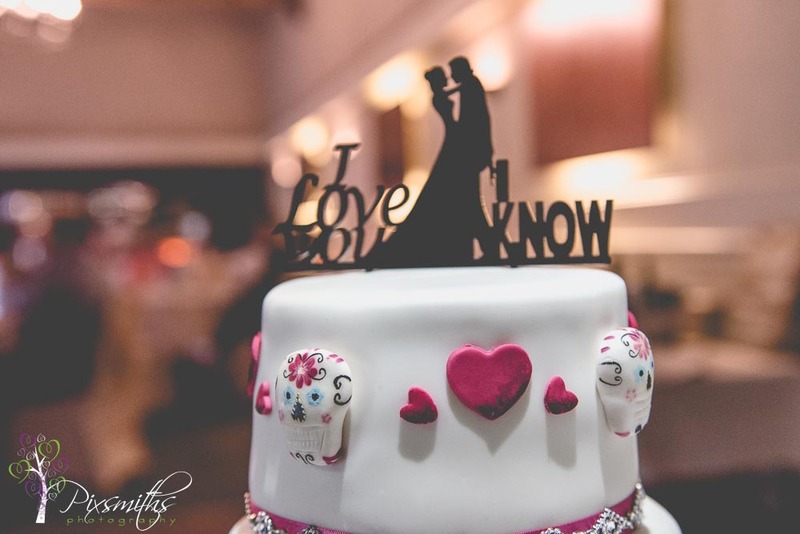 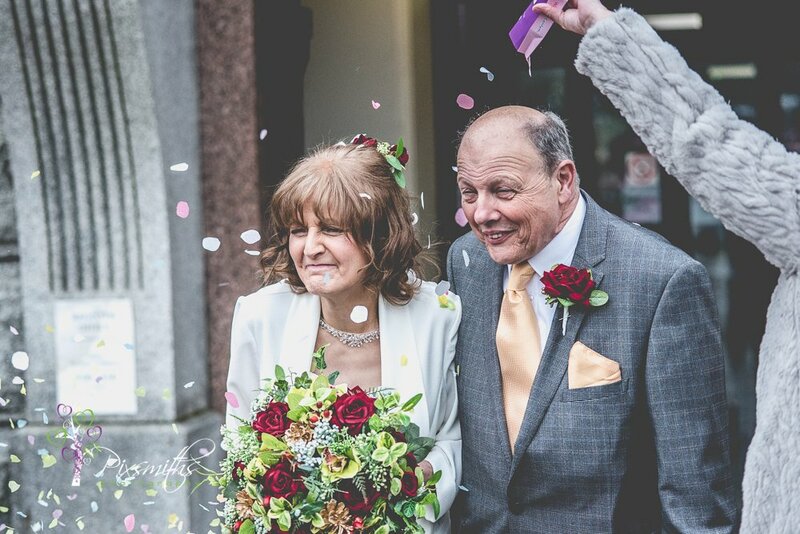 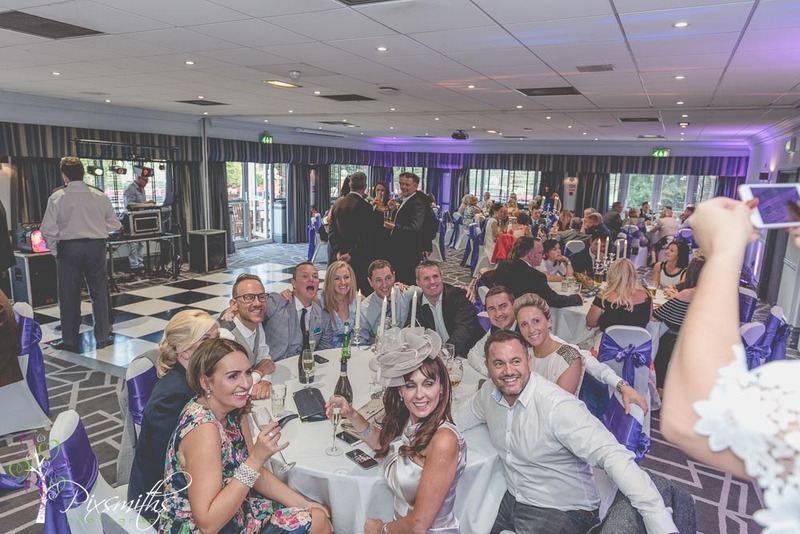 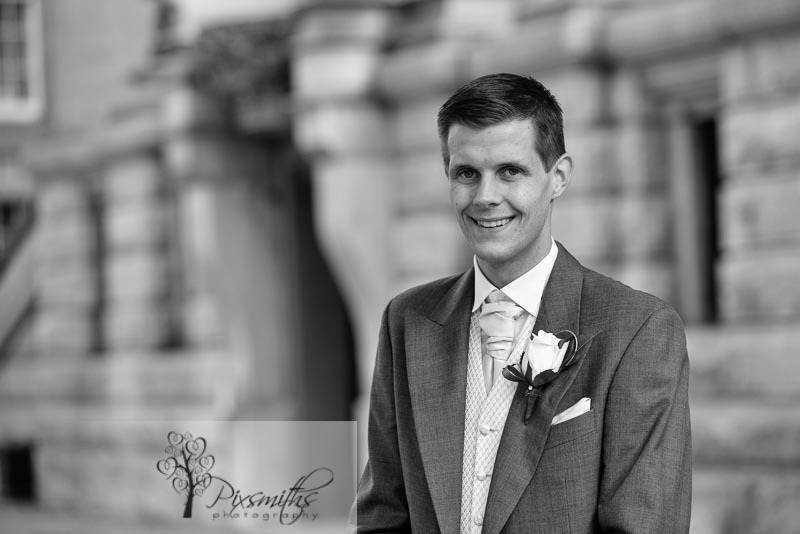 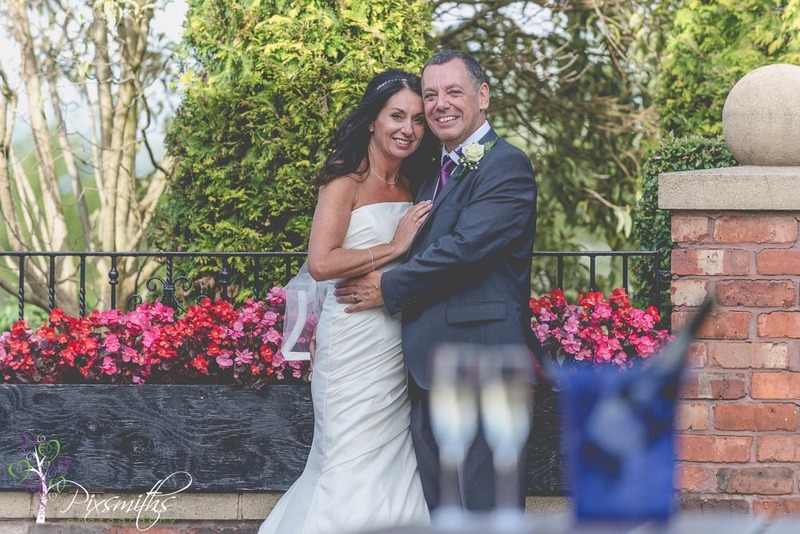 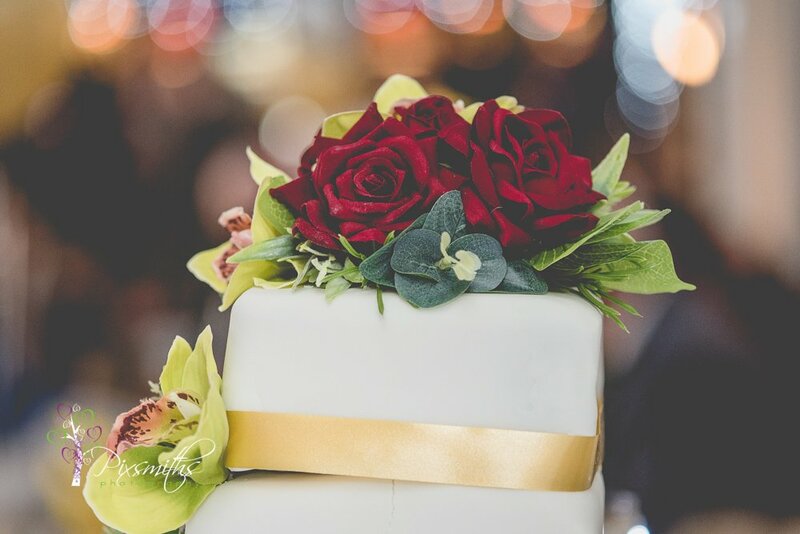 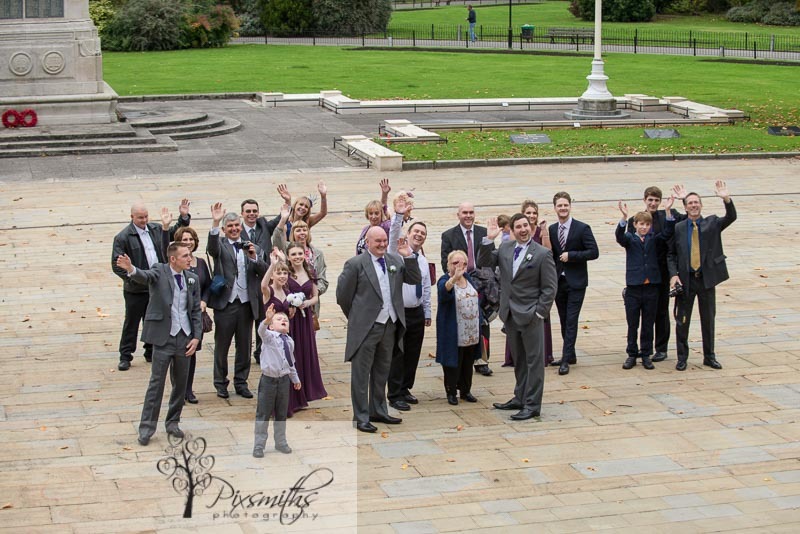 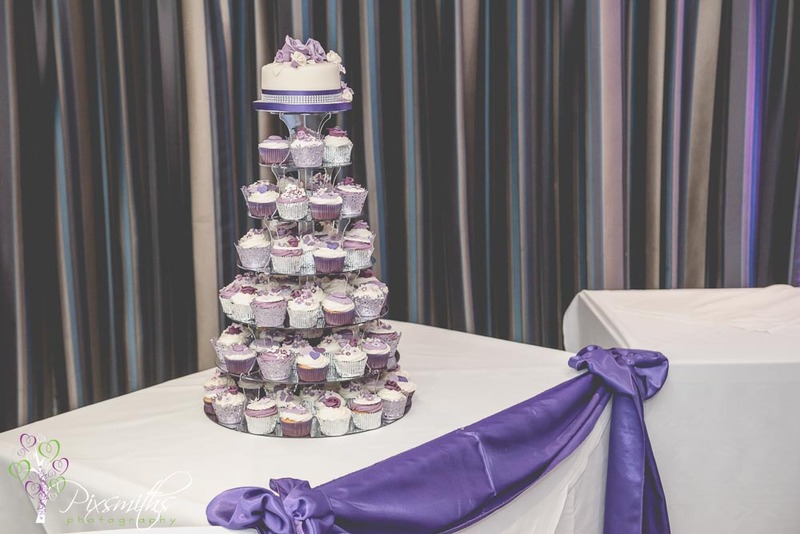 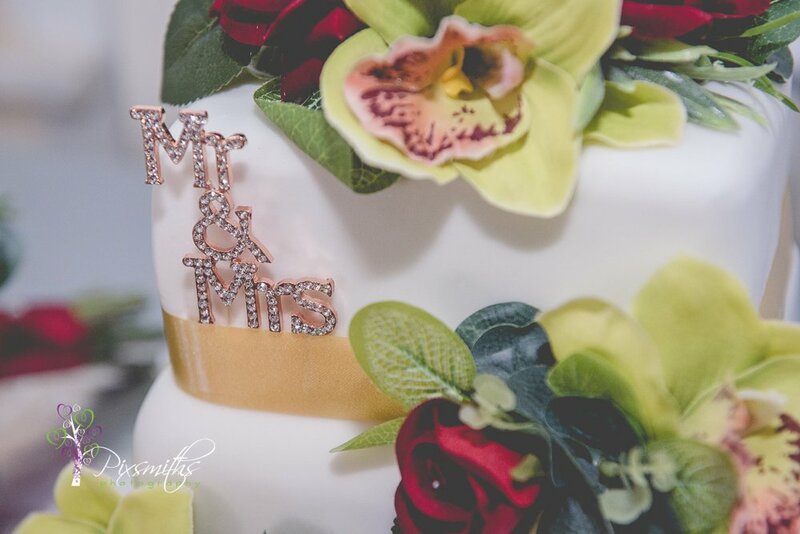 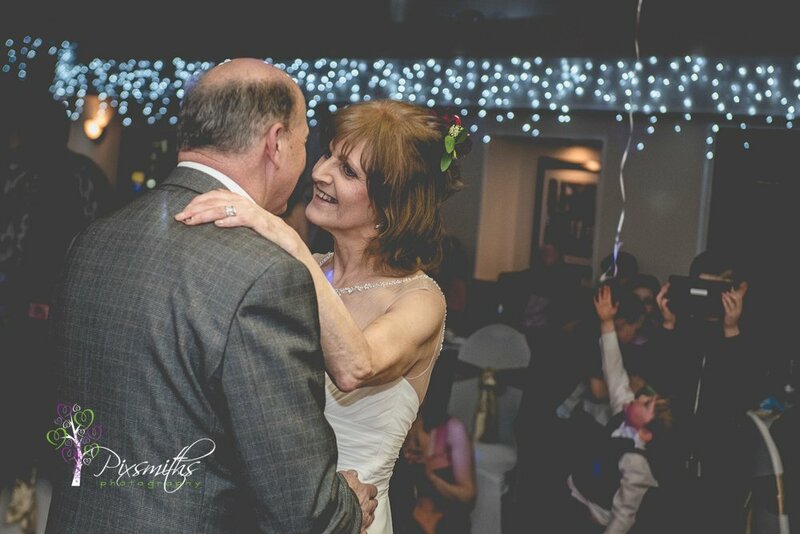 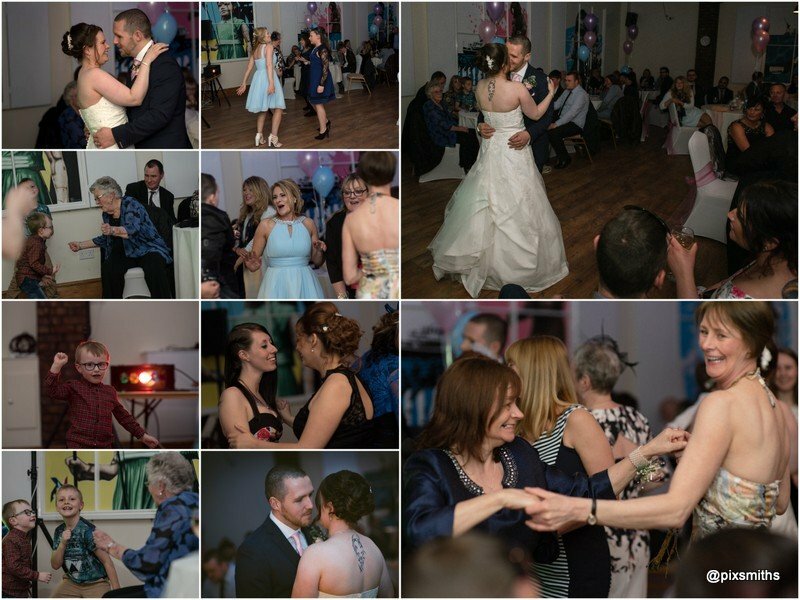 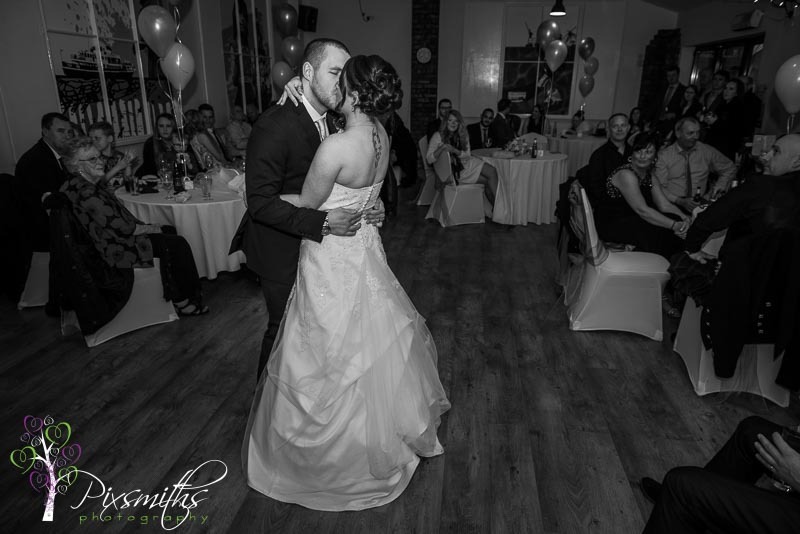 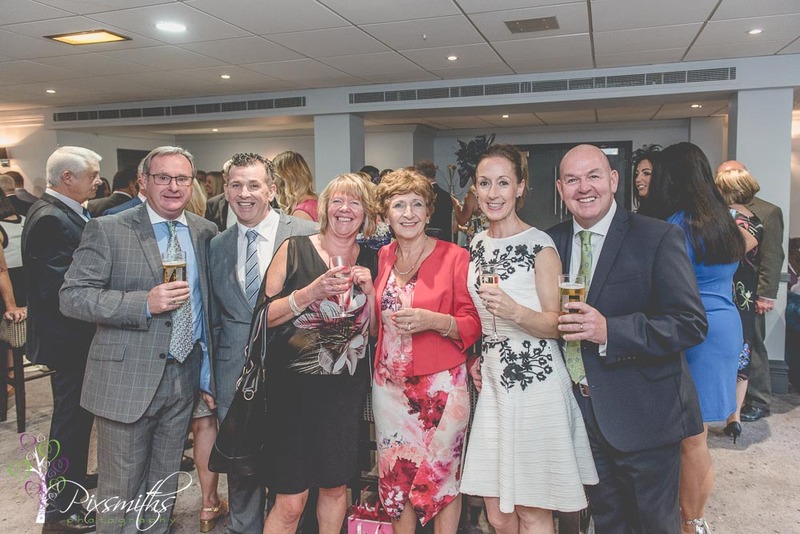 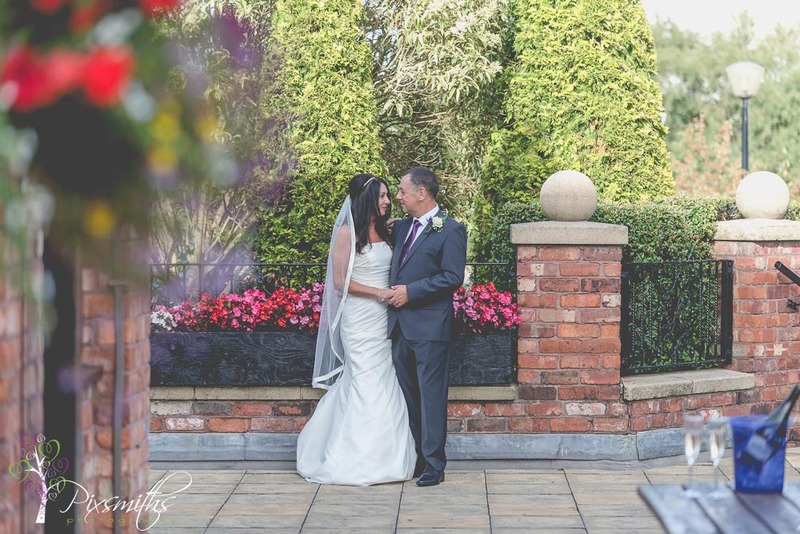 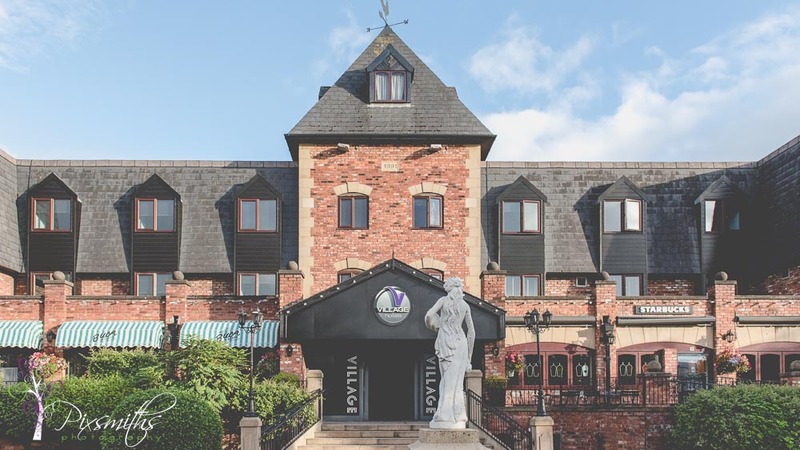 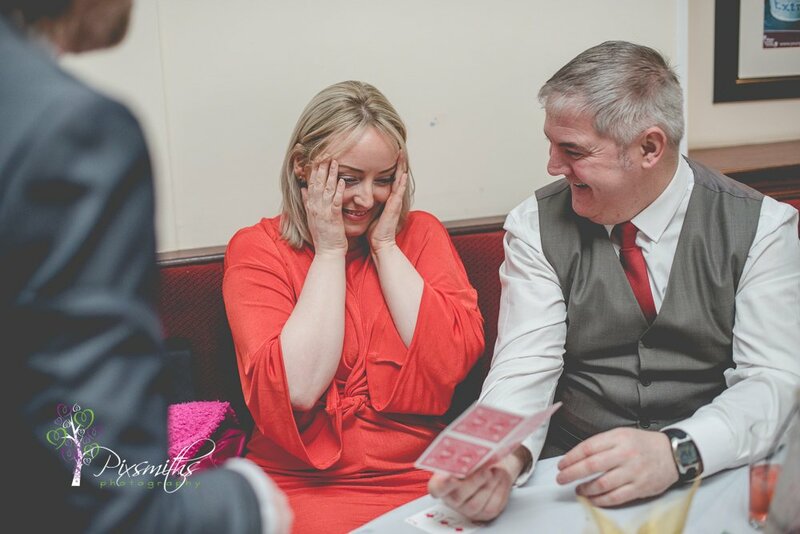 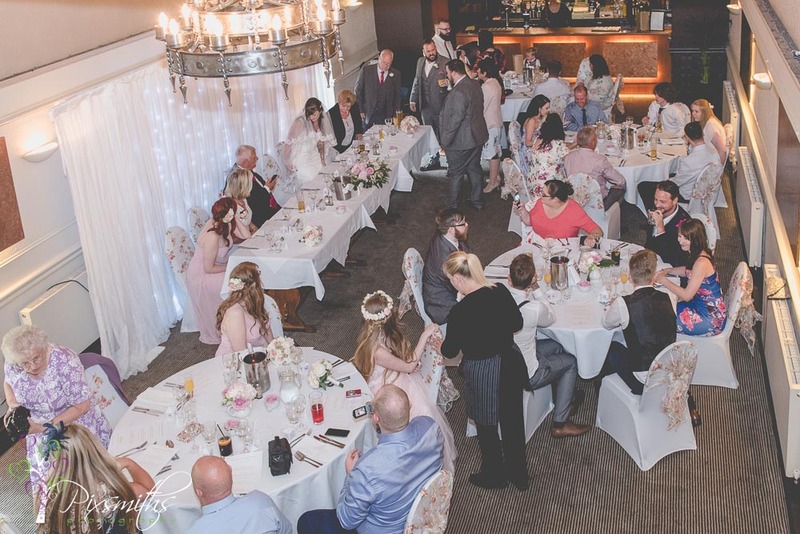 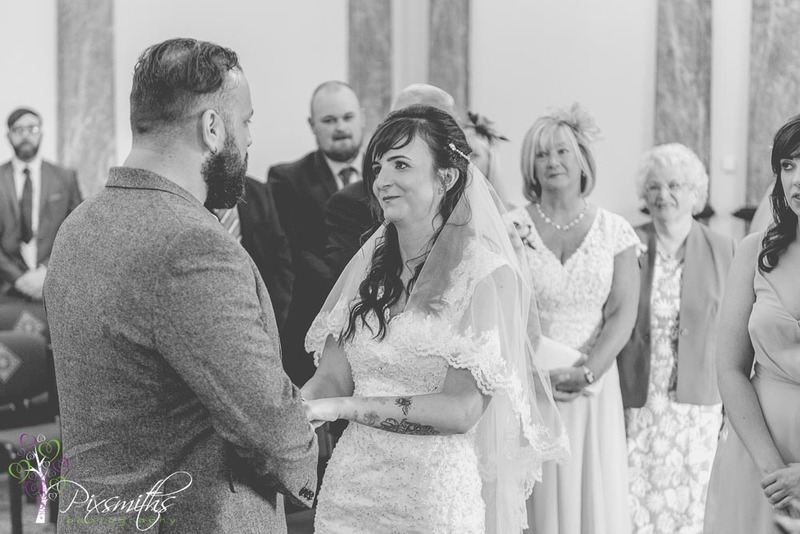 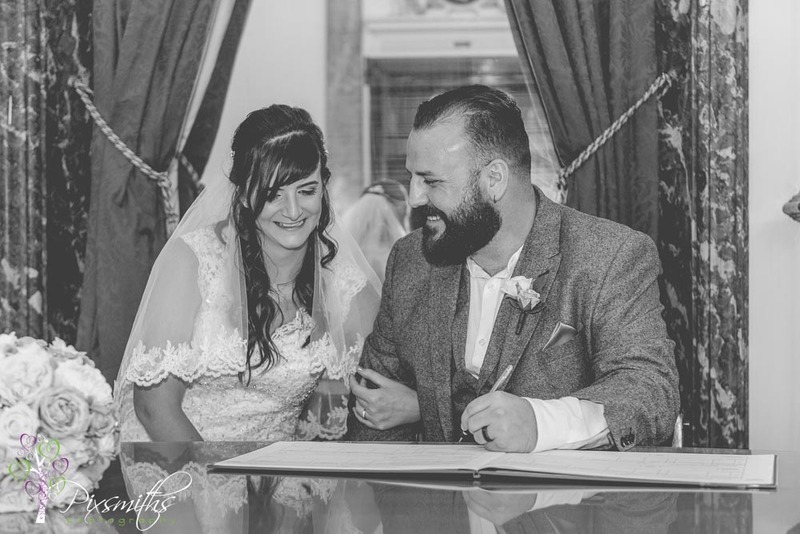 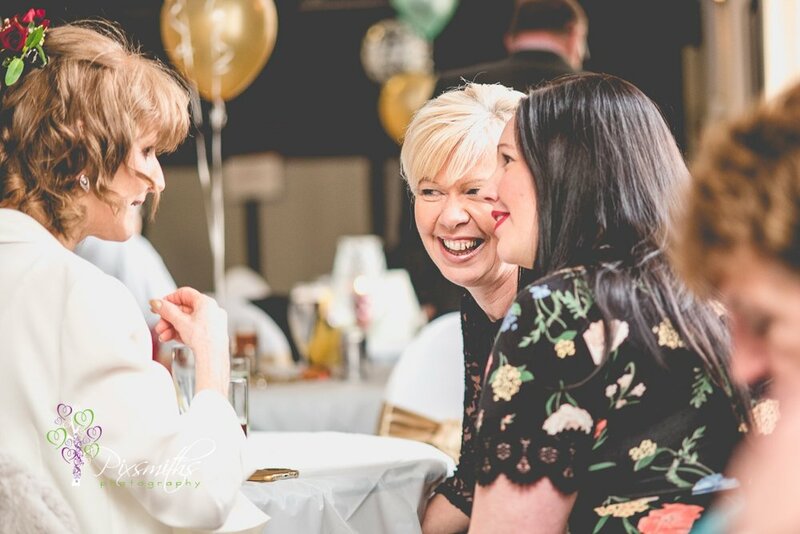 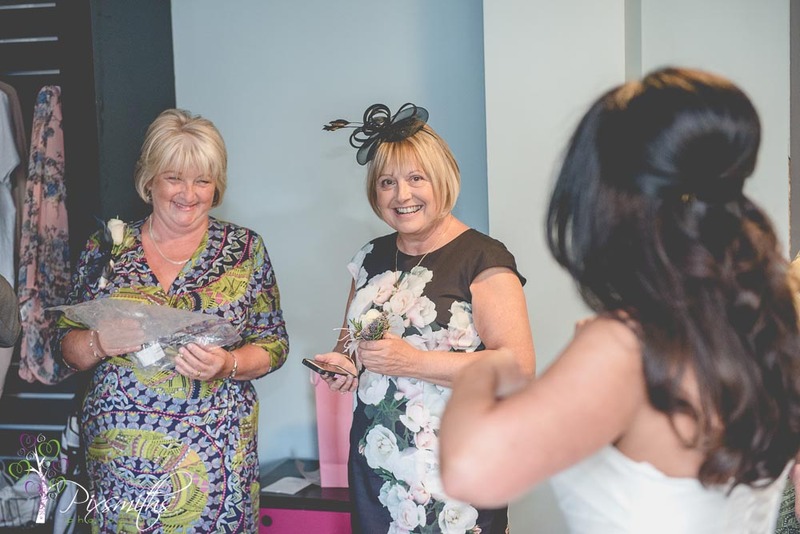 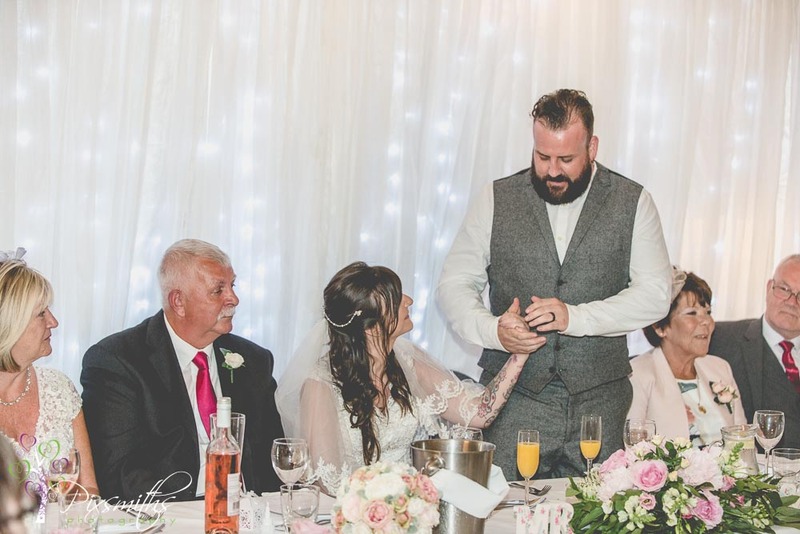 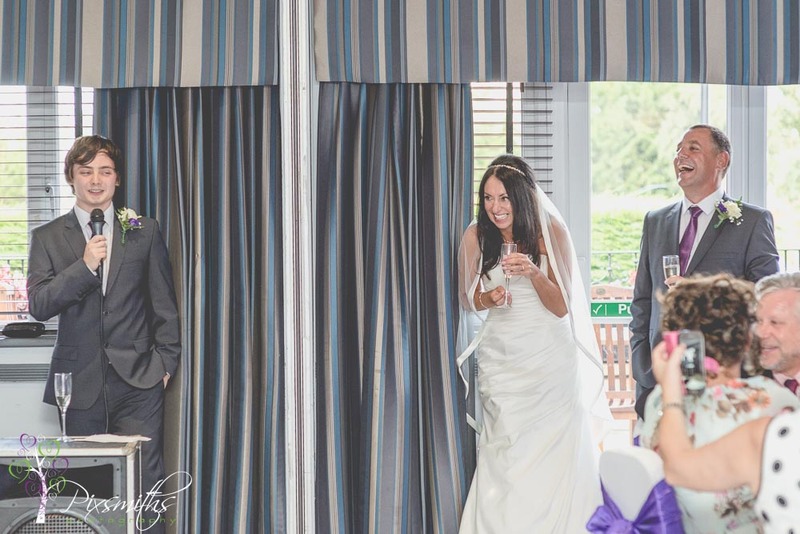 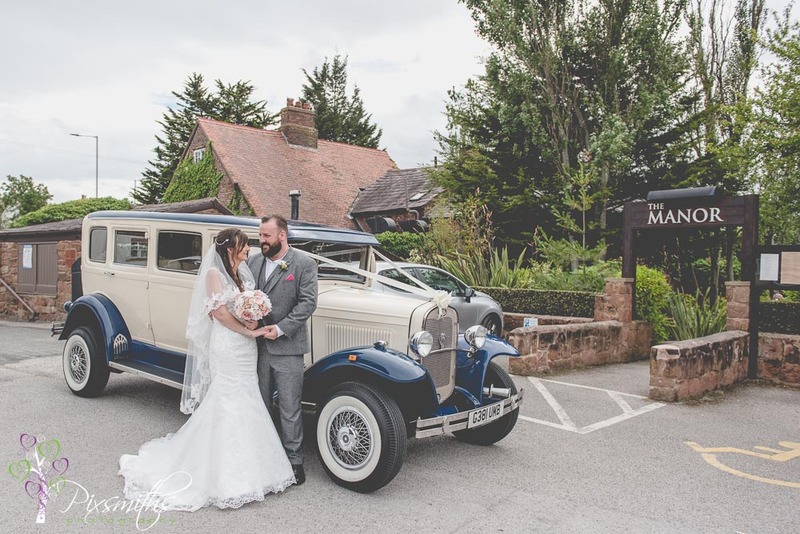 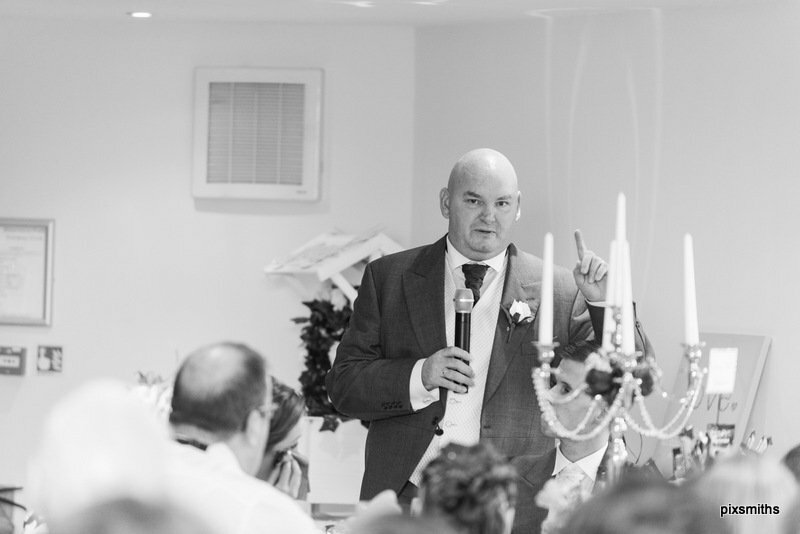 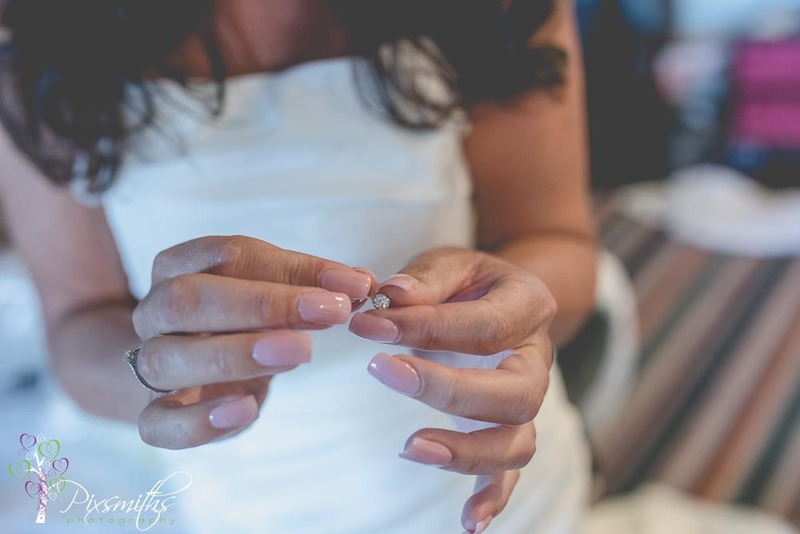 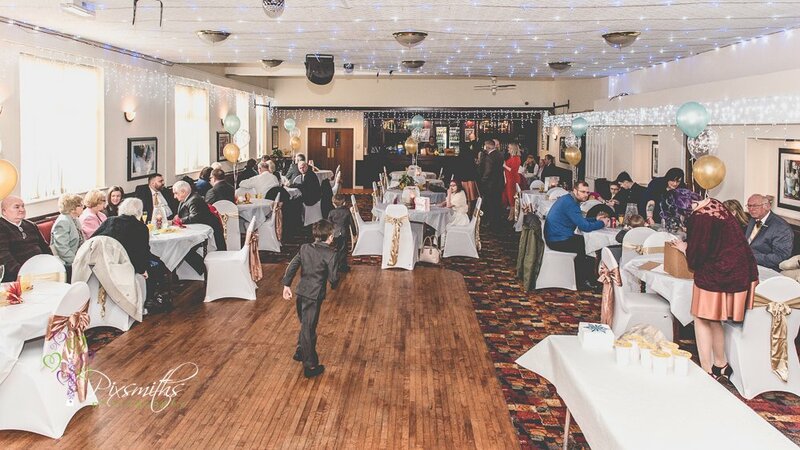 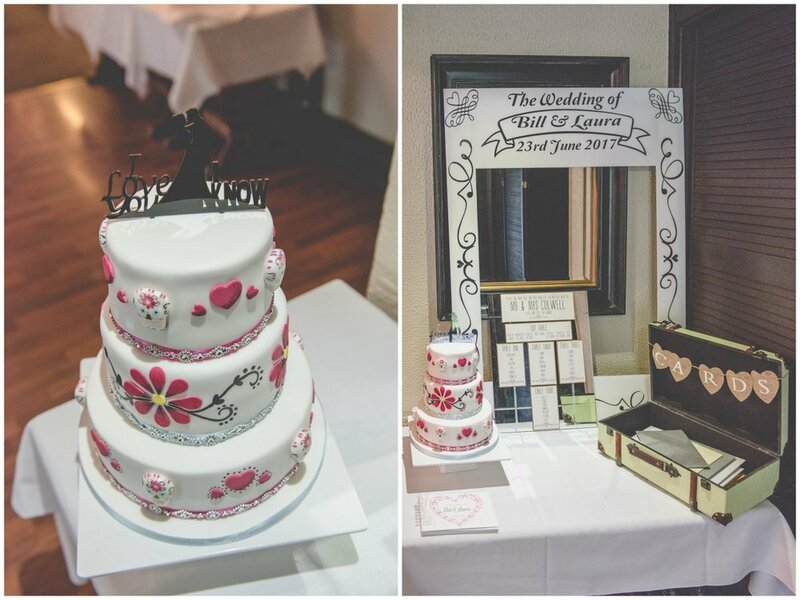 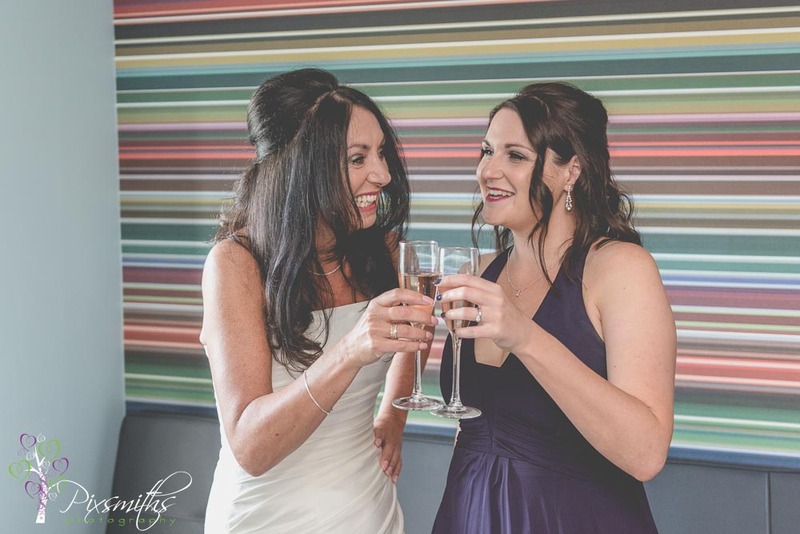 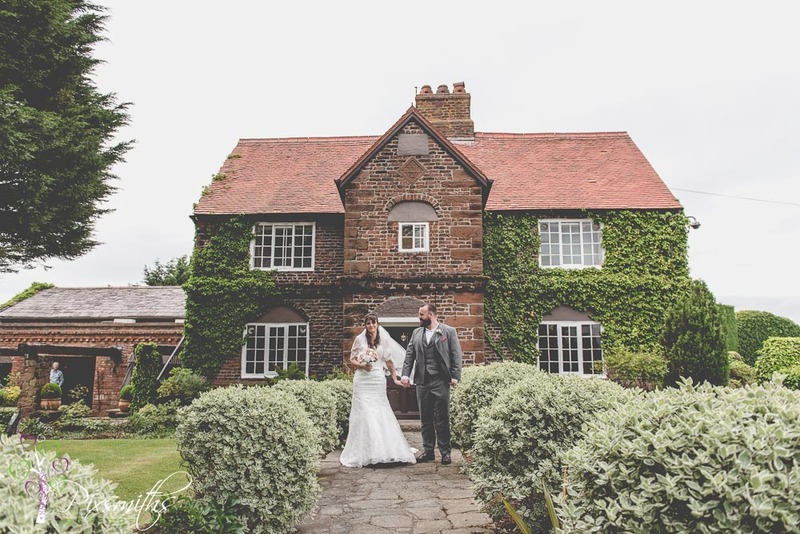 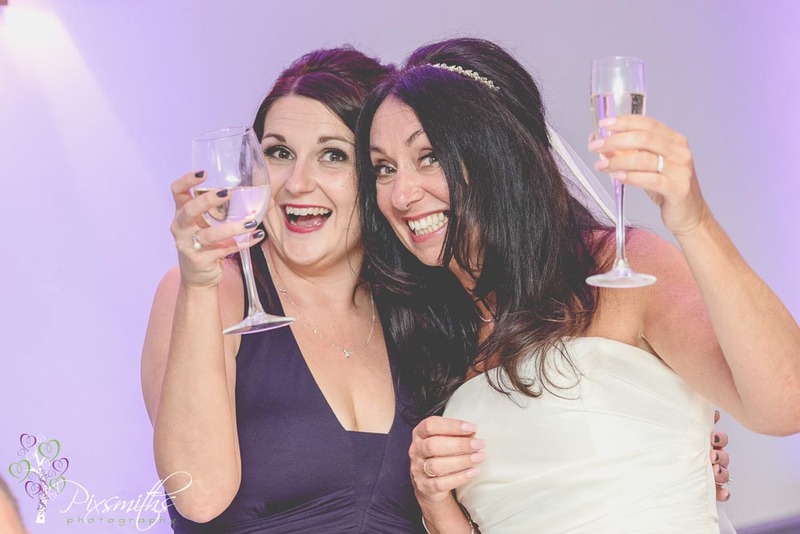 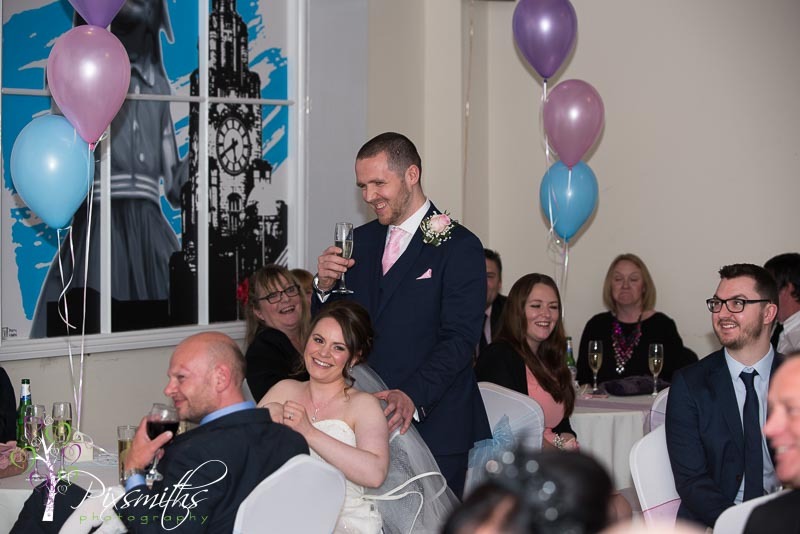 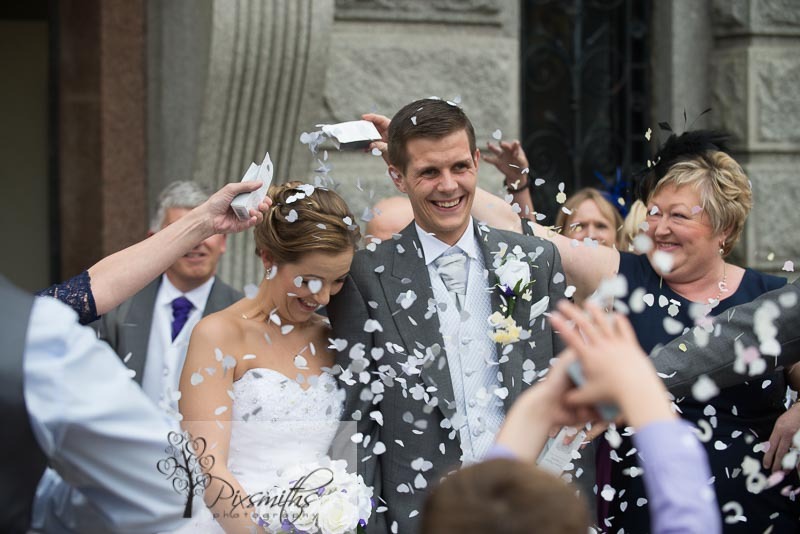 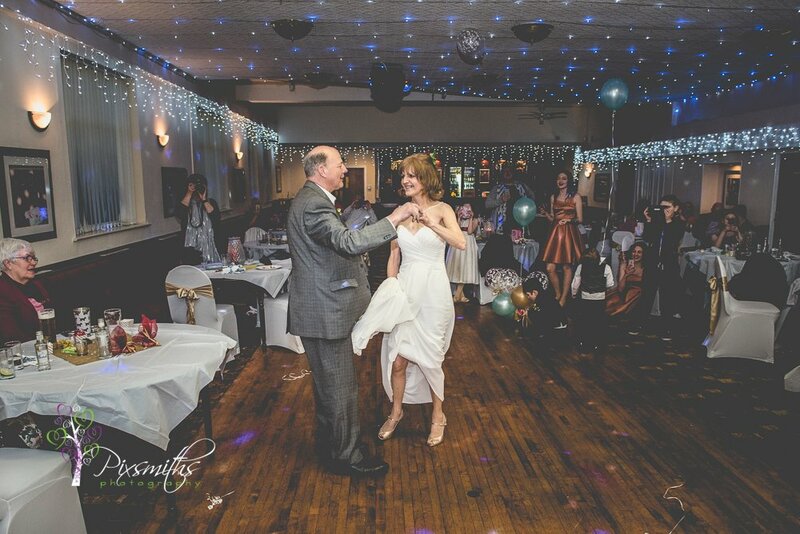 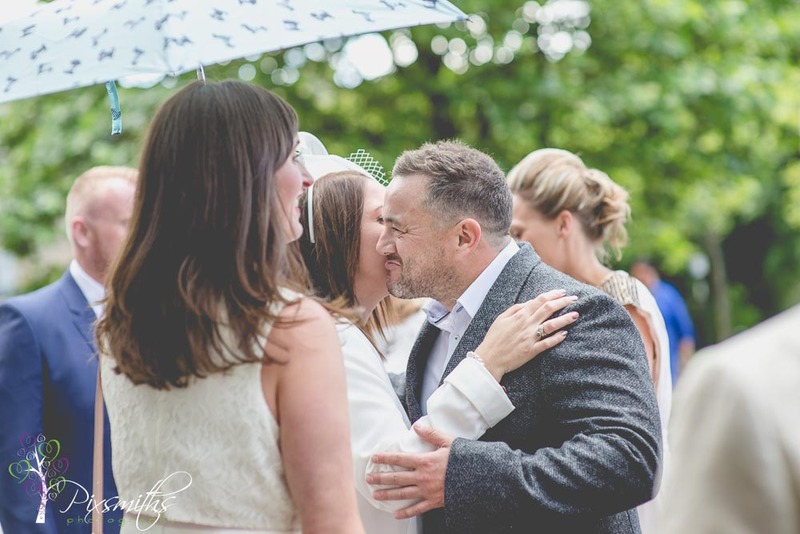 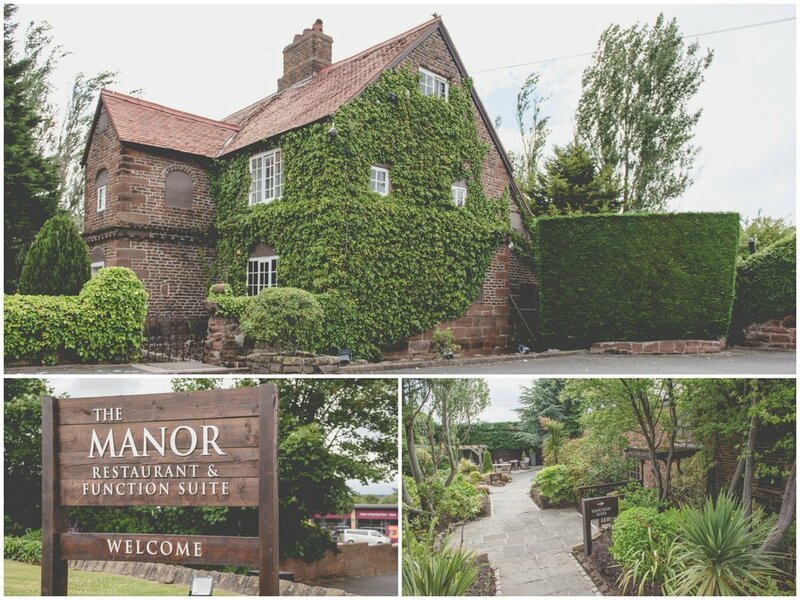 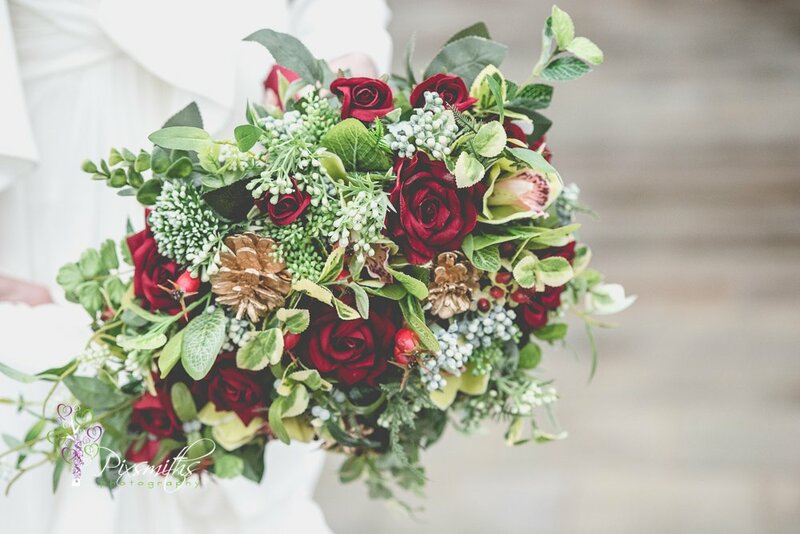 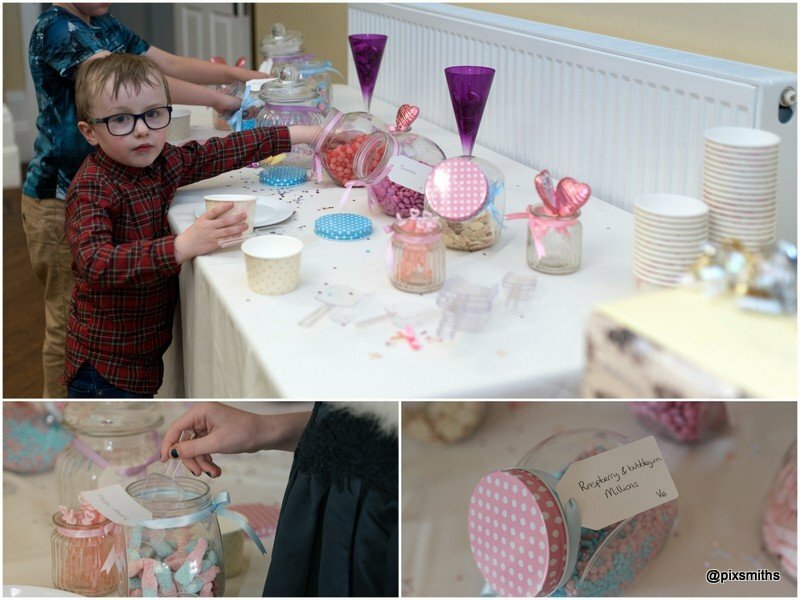 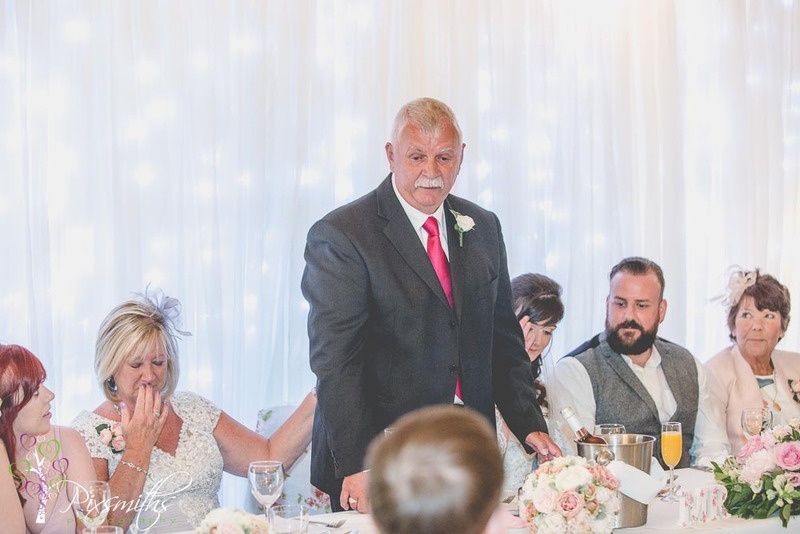 Its been a while since we had a wedding at Village Hotel Bromborough – and it nearly wasn’t here! 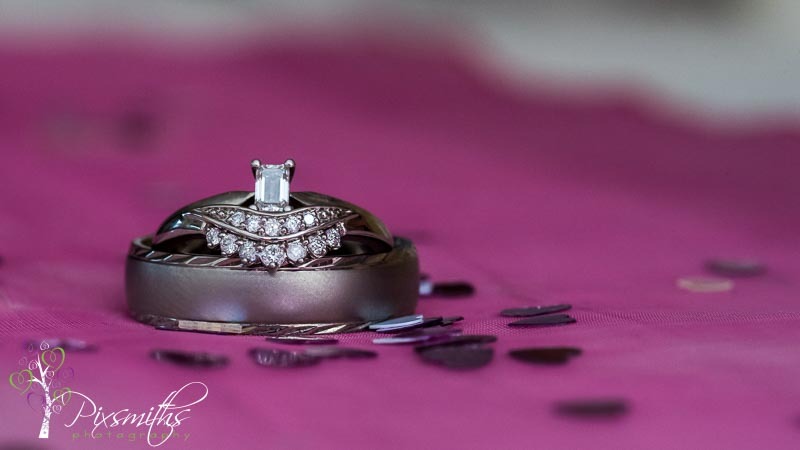 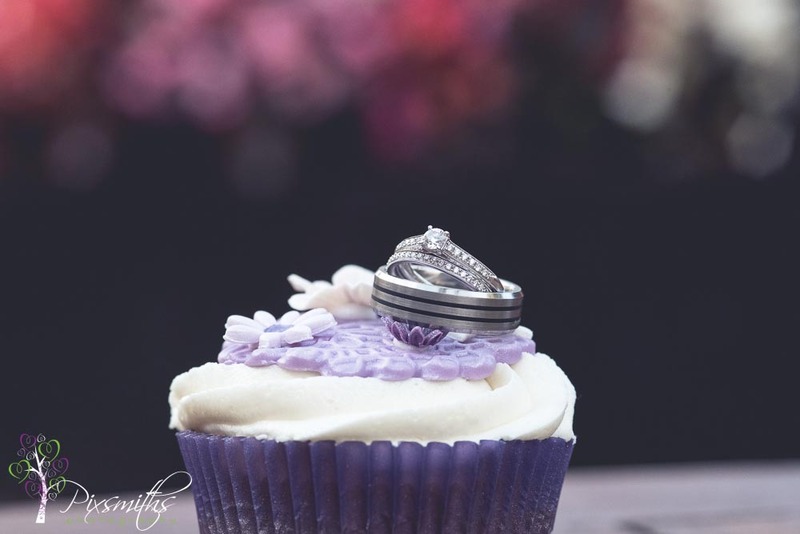 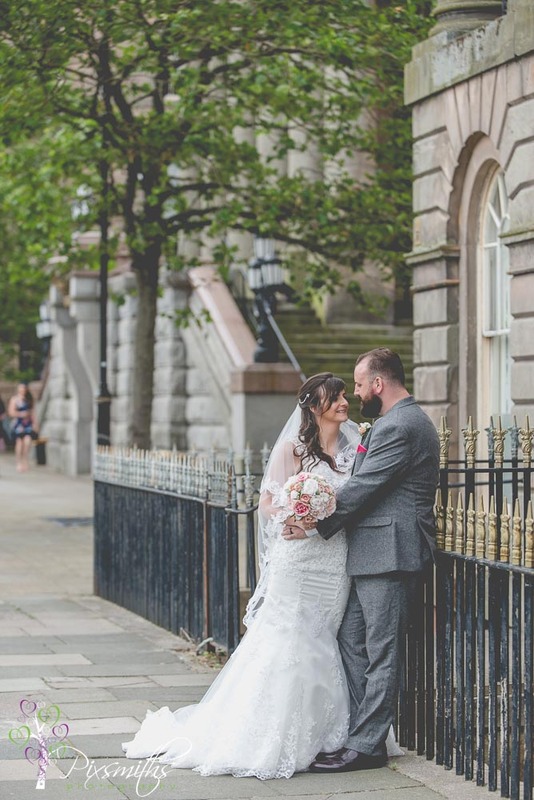 Jane and Elliot’s reception was originally planned for 4748 Hamilton Square after their Town Hall wedding…but unfortunately they closed business. 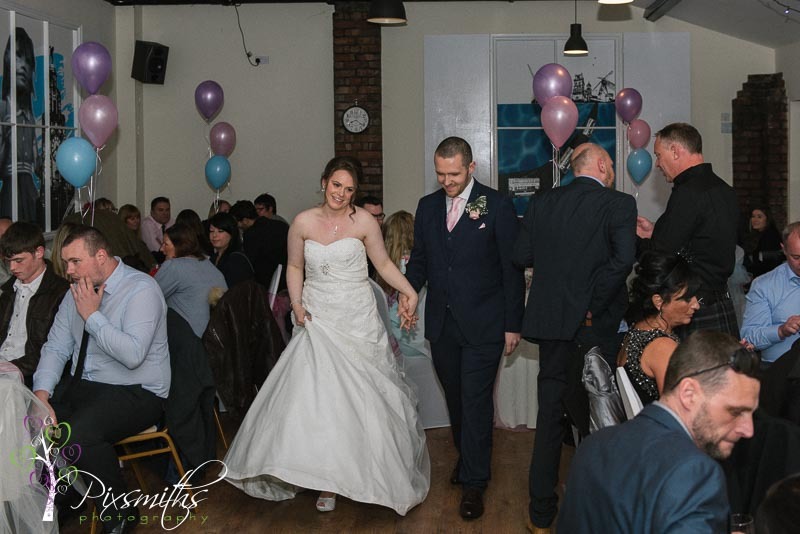 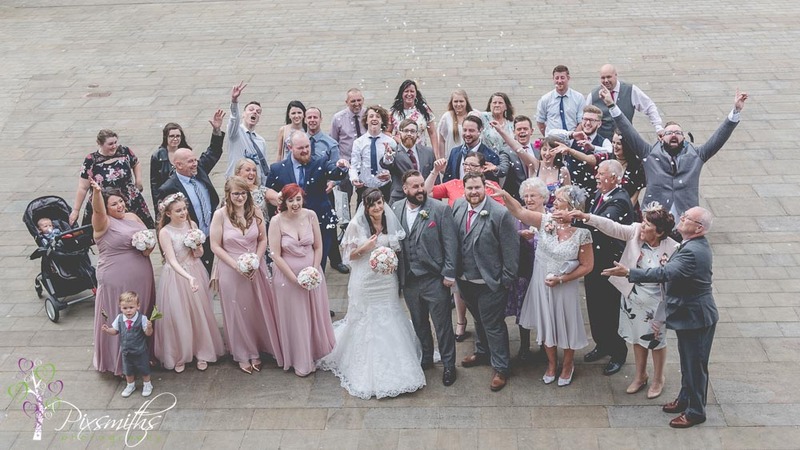 All ended well as we think their large group was more suited to the larger space for their wedding at Village Hotel Bromborough. 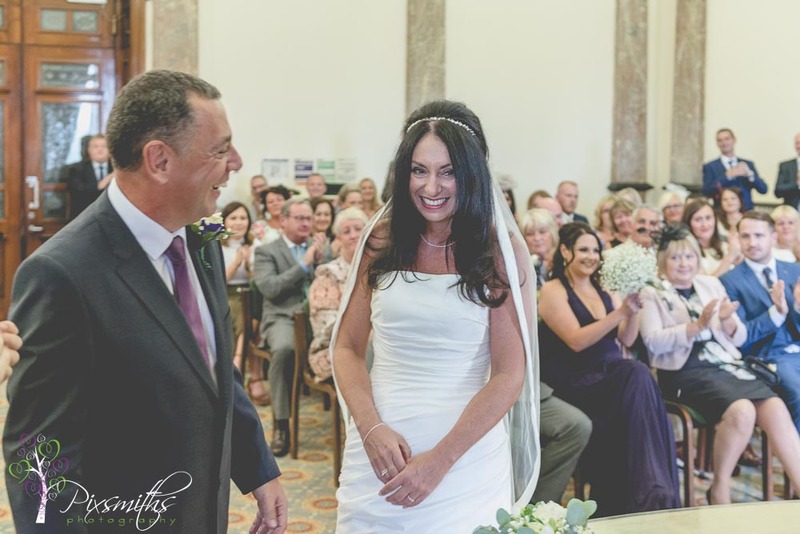 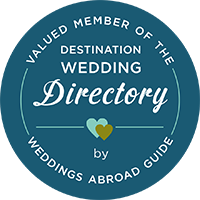 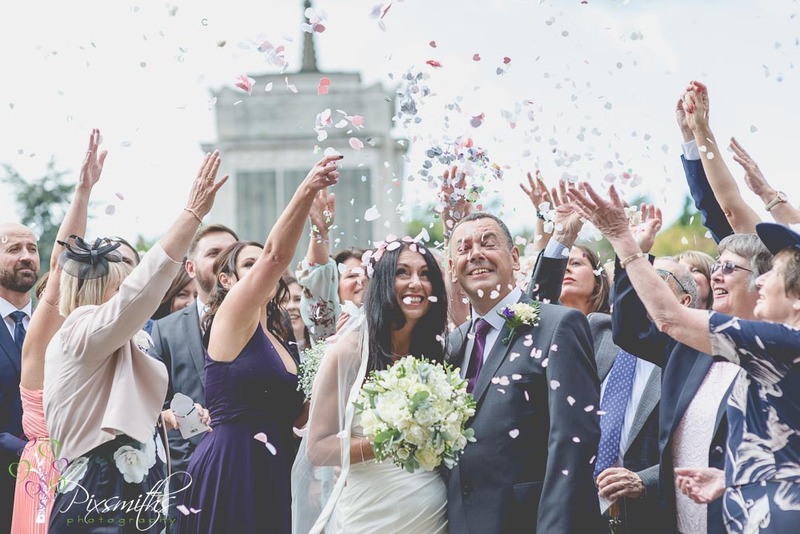 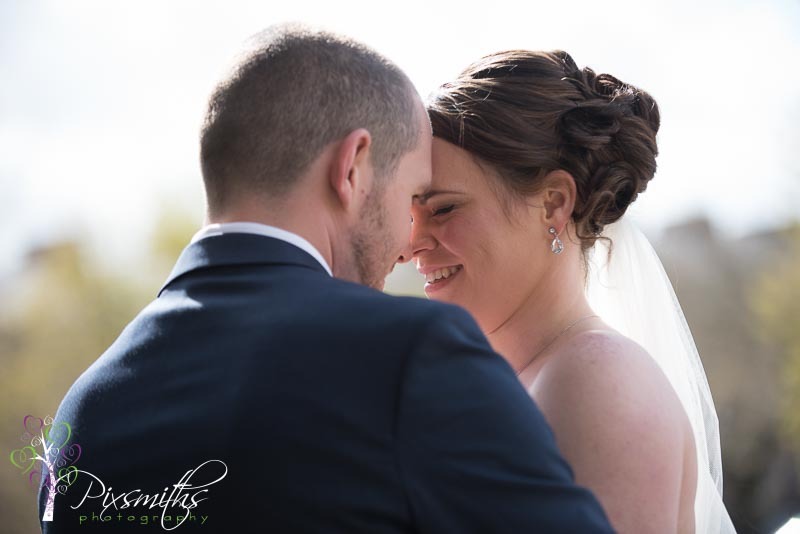 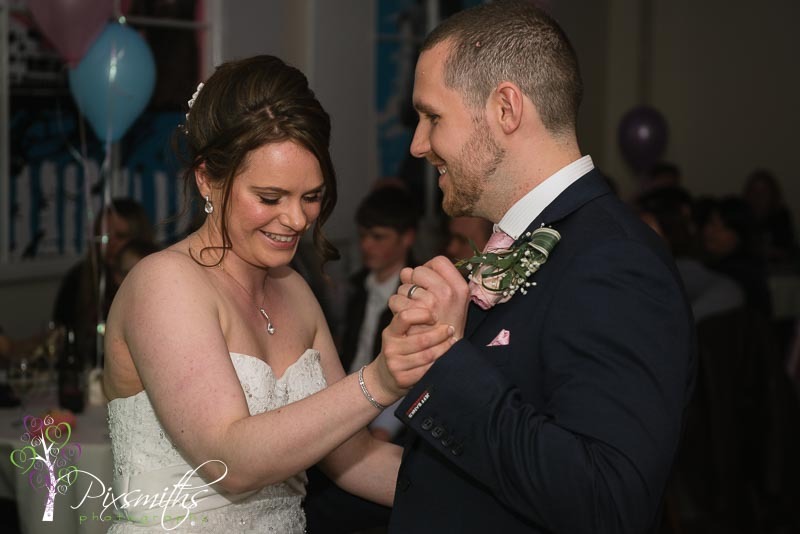 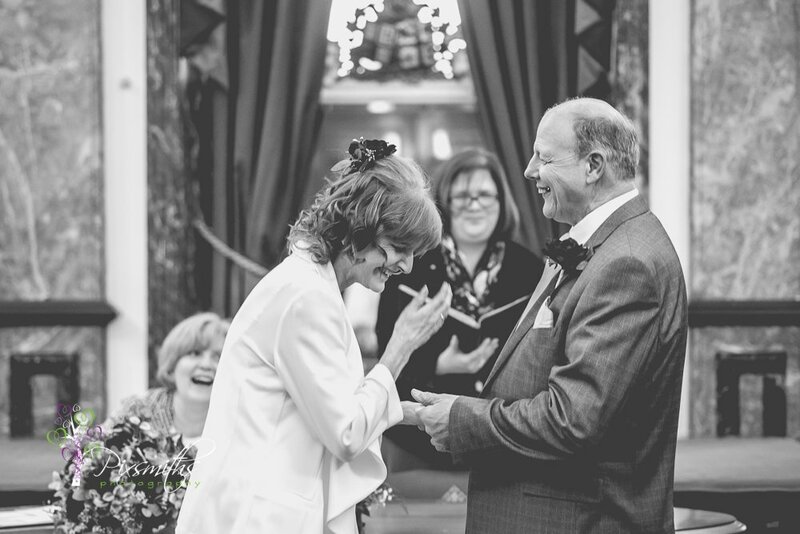 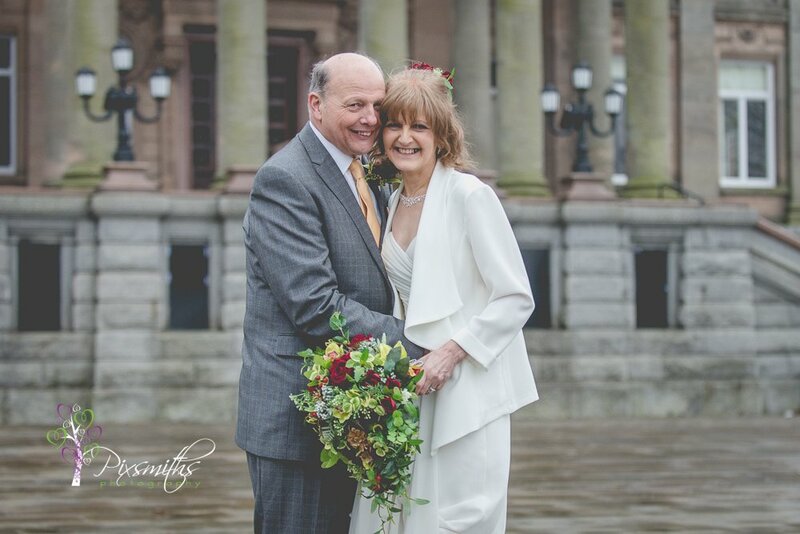 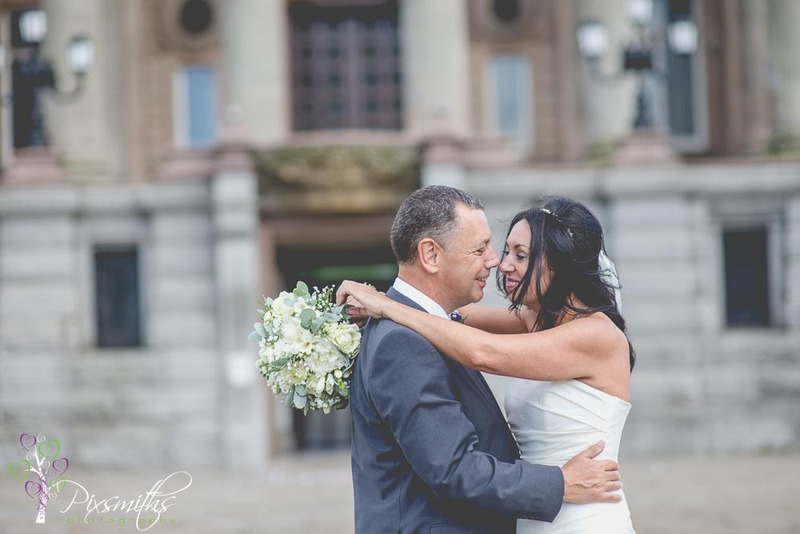 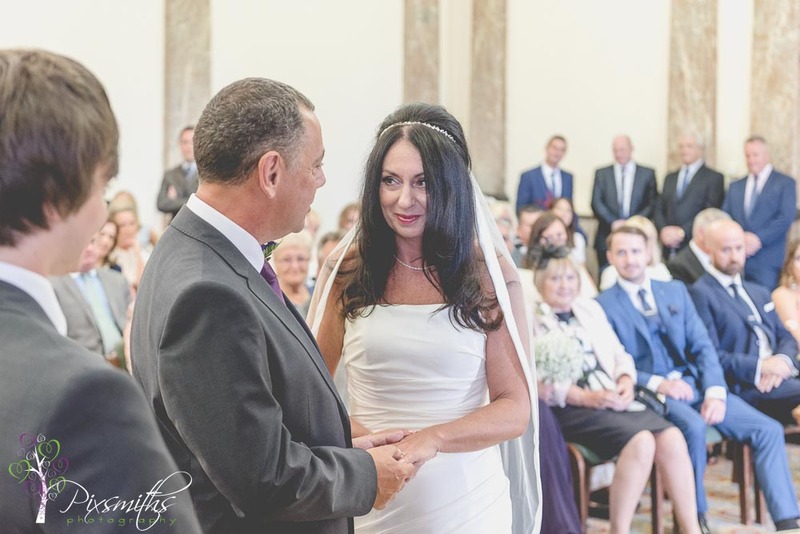 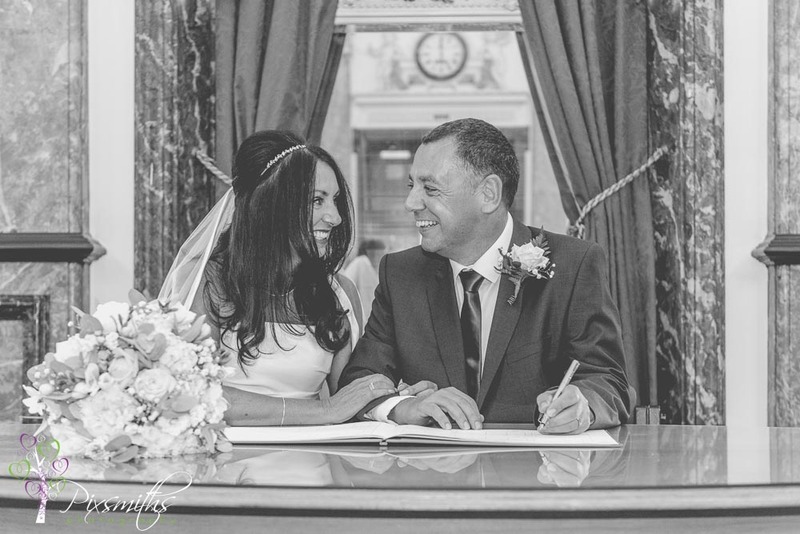 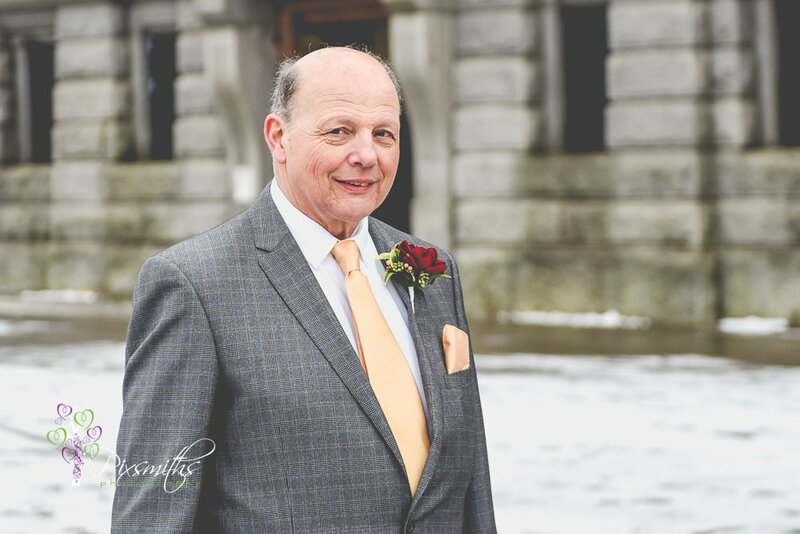 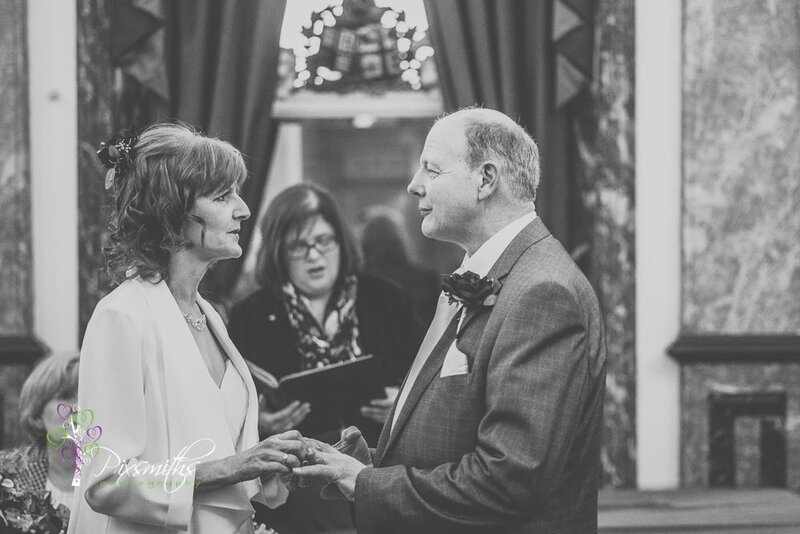 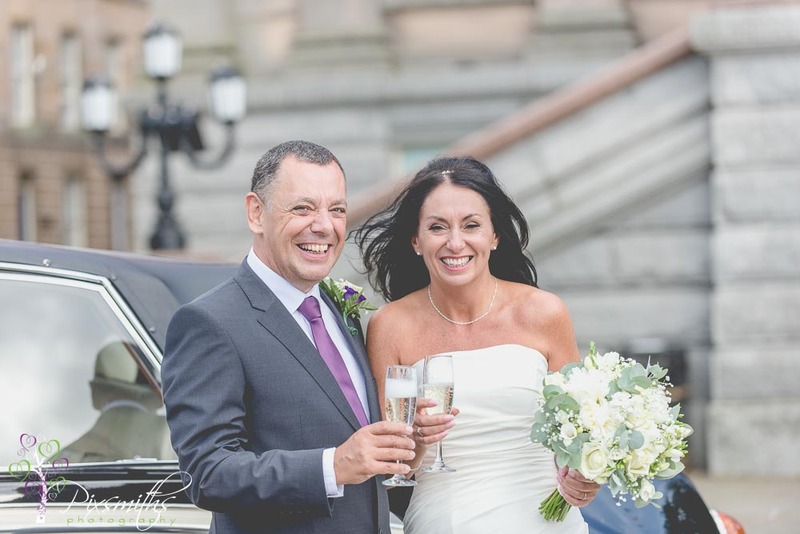 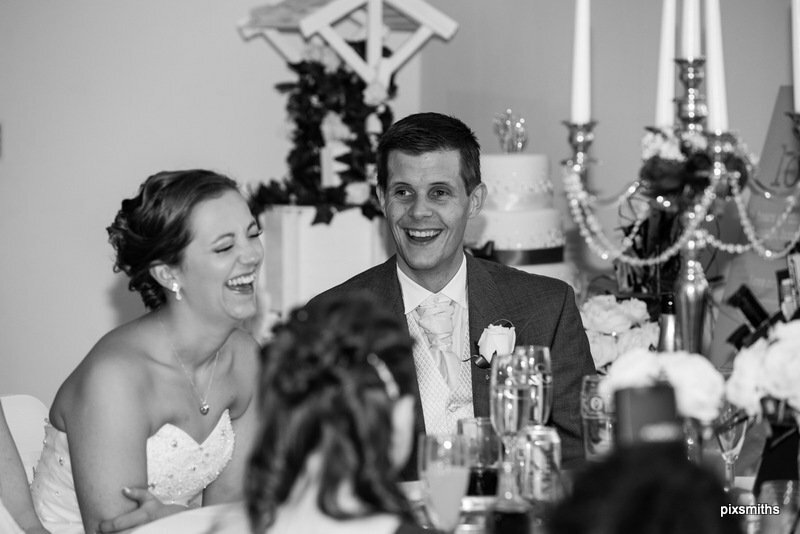 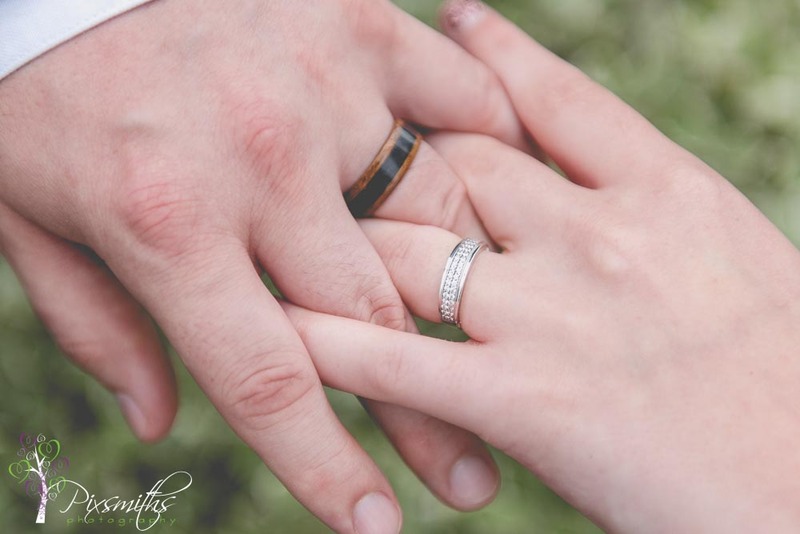 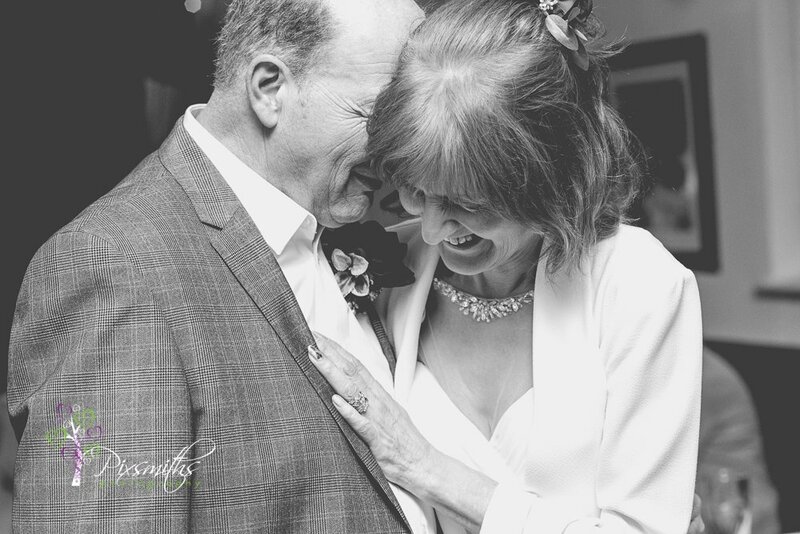 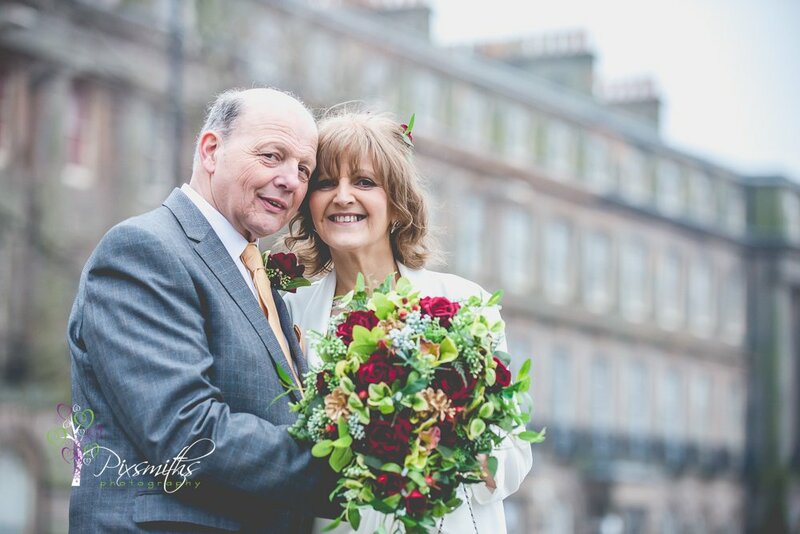 Jane and Elliot met on-line – like several of our recent couples and it was obvious to see their happiness throughout their eventful day. 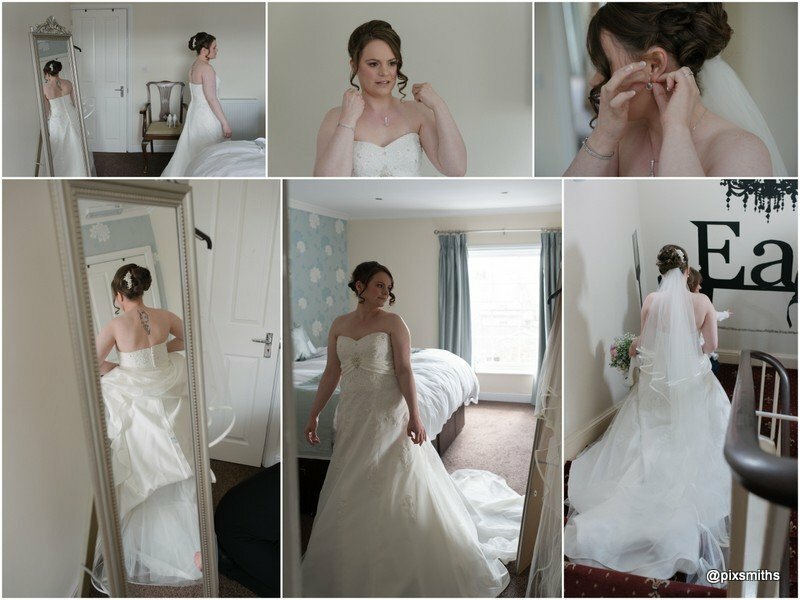 She started off by saying how behind time she felt ut actually she soon got dressed and was ready with an hour to spare! 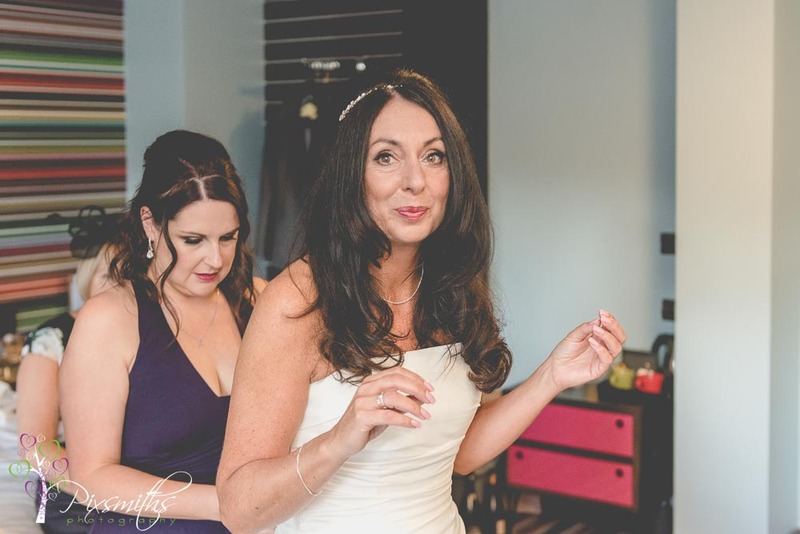 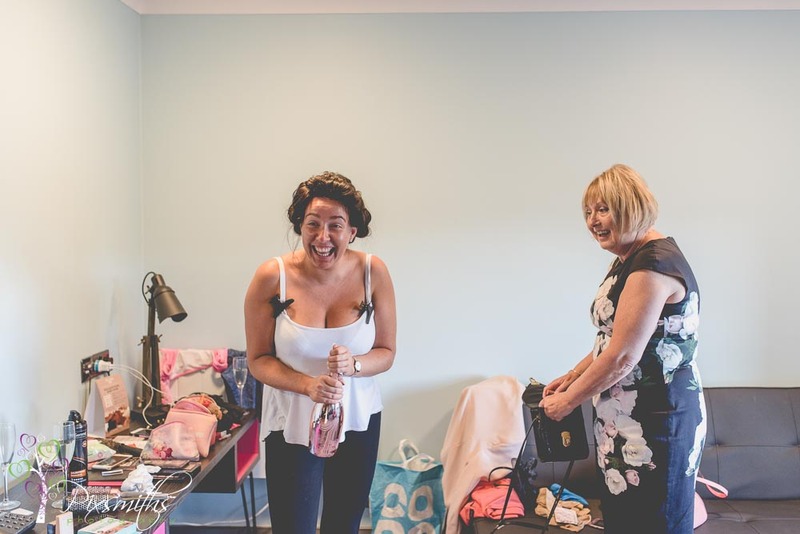 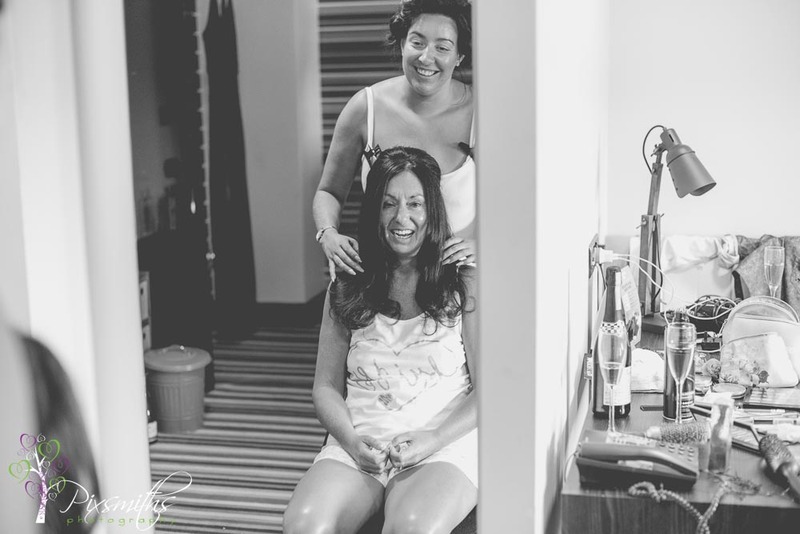 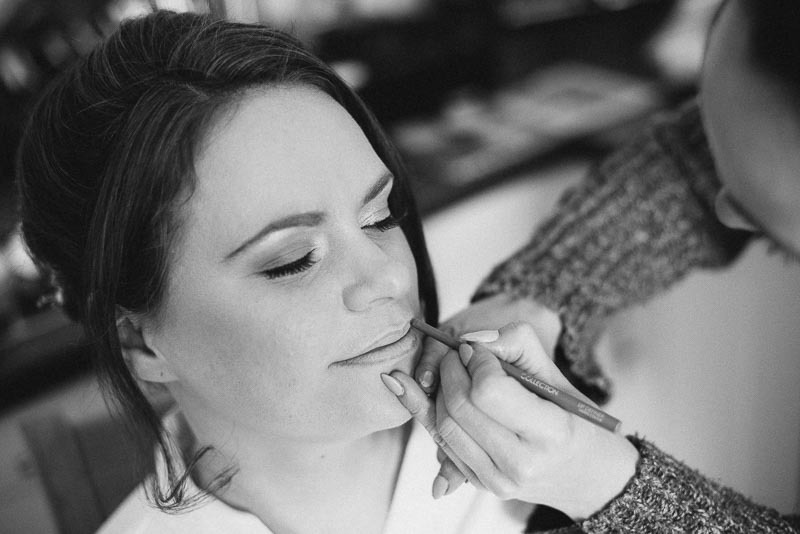 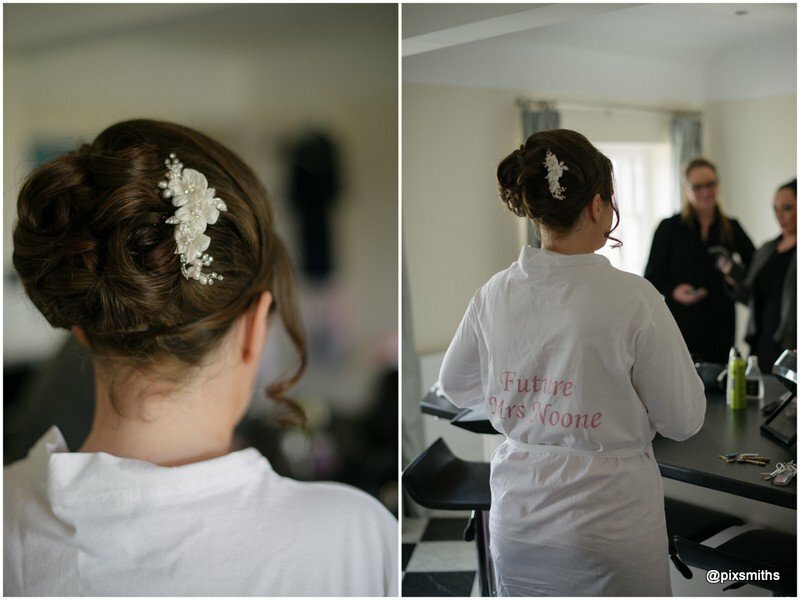 never known a bride get ready so quick! 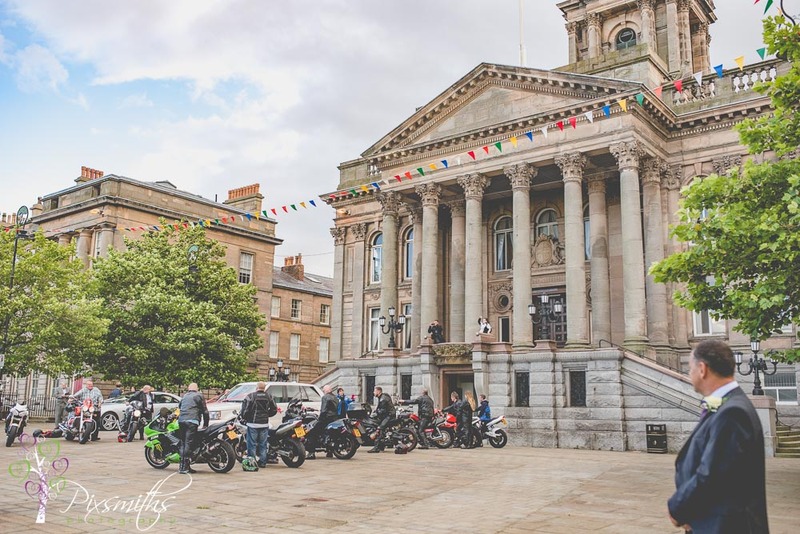 Surely the in-going bride would have heard the revving of the bike engines! 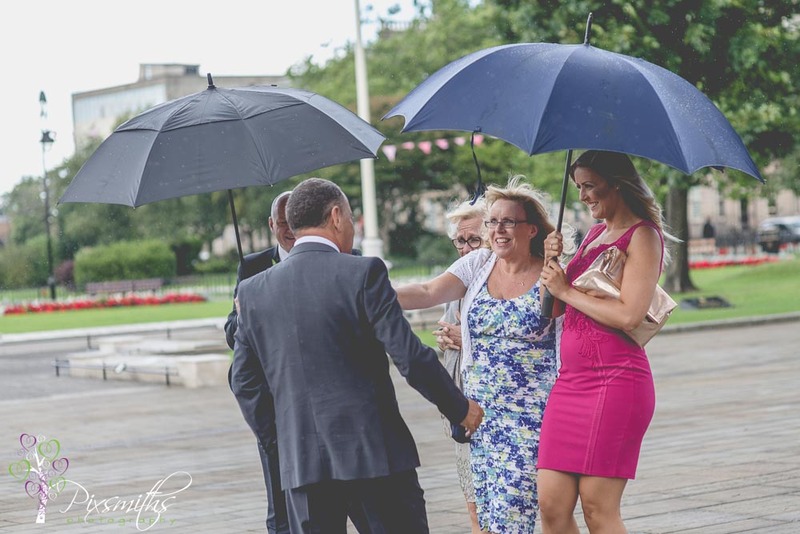 A little rain but ably sheltered by umbrellas. 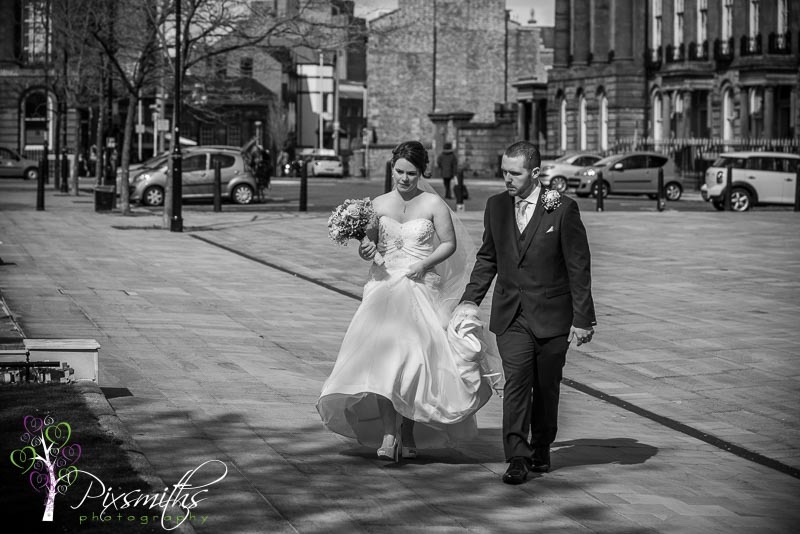 Short ceremony and then out to sunshine ..and soon an almost empty Square. 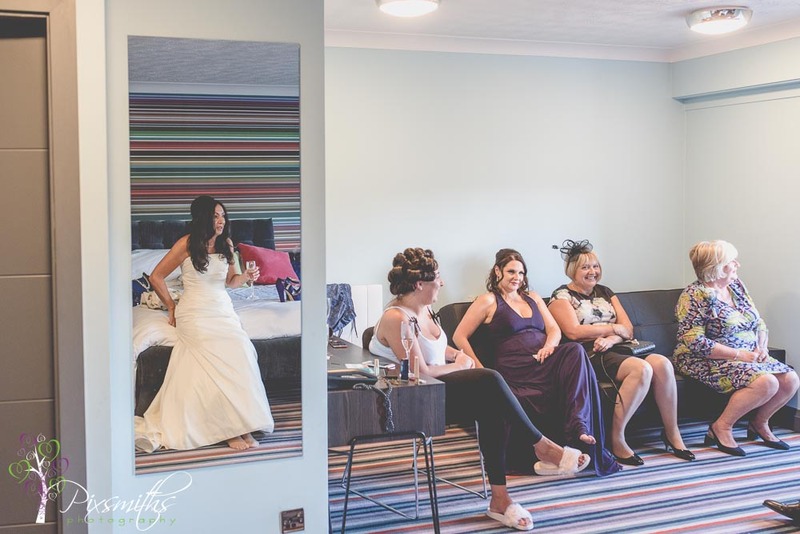 perfect for photos before their twilight wedding reception at the Village Hotel. 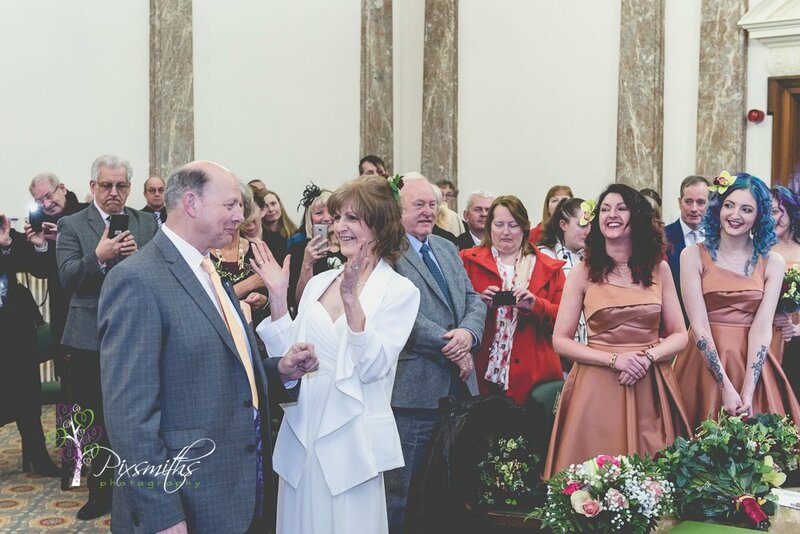 Great crowd of friends to help them celebrate. 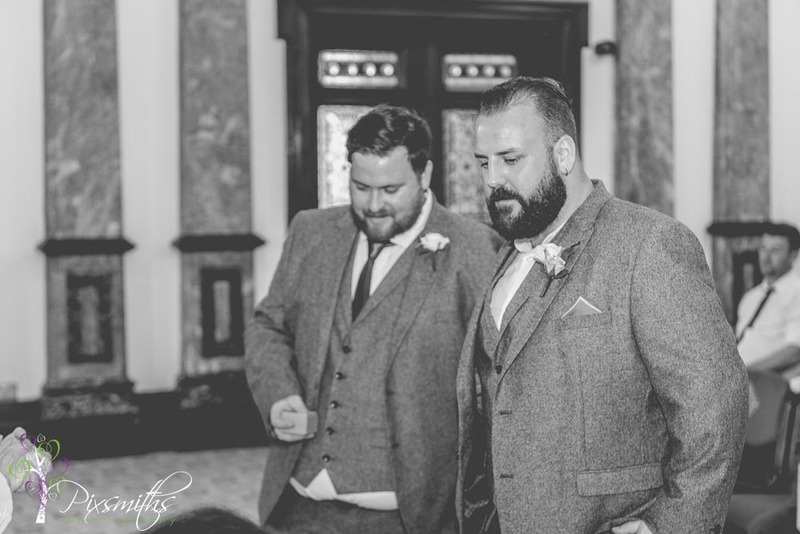 Just a couple of speeches – how well did Elliot’s son do, very articulate! 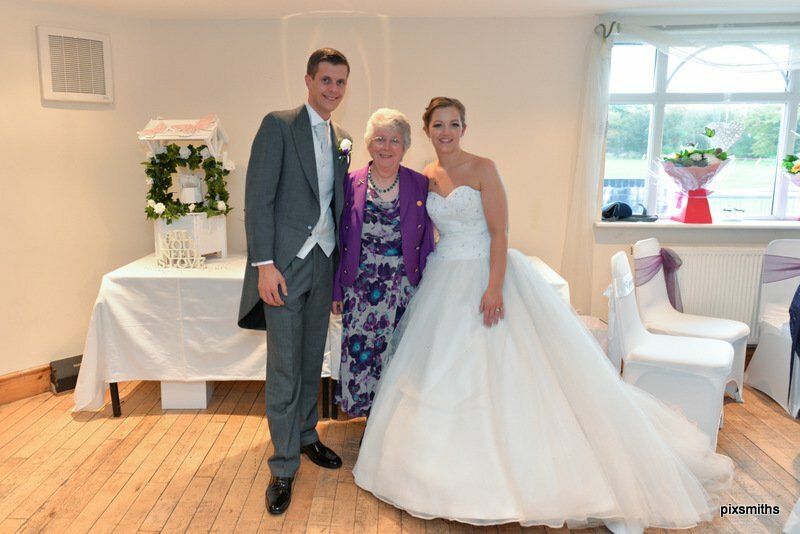 Many congratulations to you Jane and Elliot. 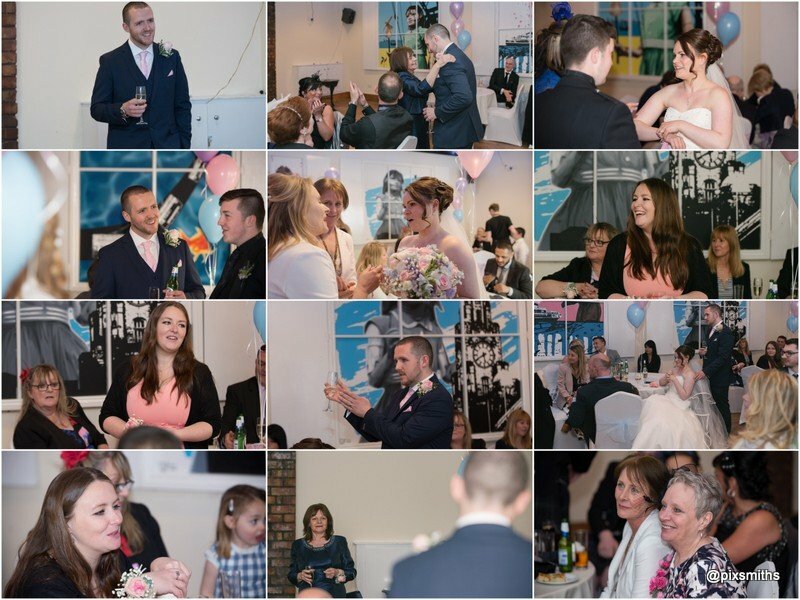 Glad you had a fabulous day and so enjoyable being with you and your friends and family. 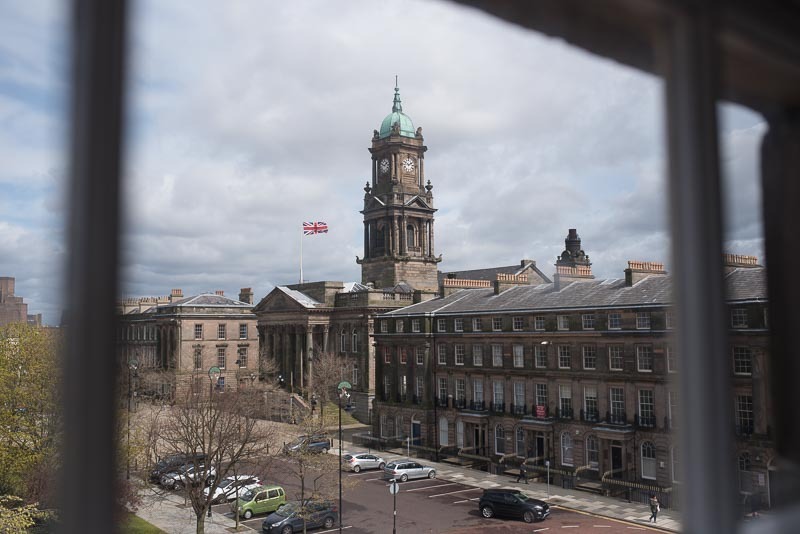 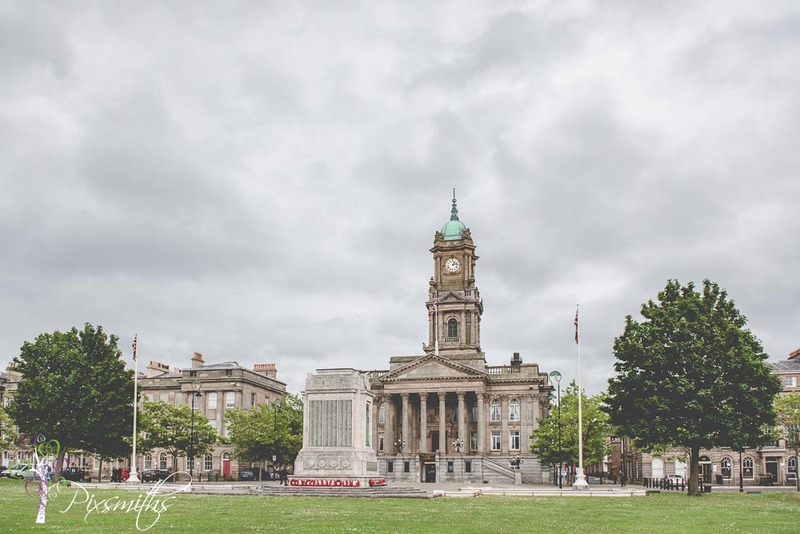 How lovely (and quiet) does Hamilton Square look! so pretty with all the bunting out too. 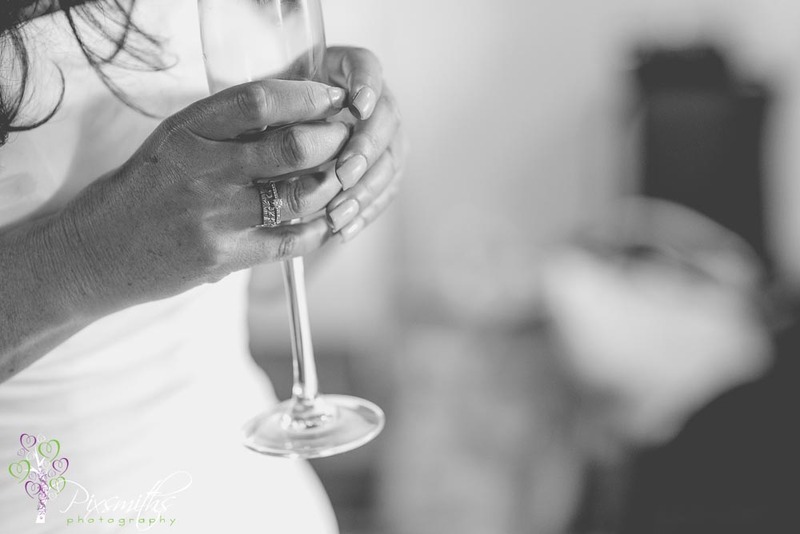 Perfect time for a glass of bubbly. 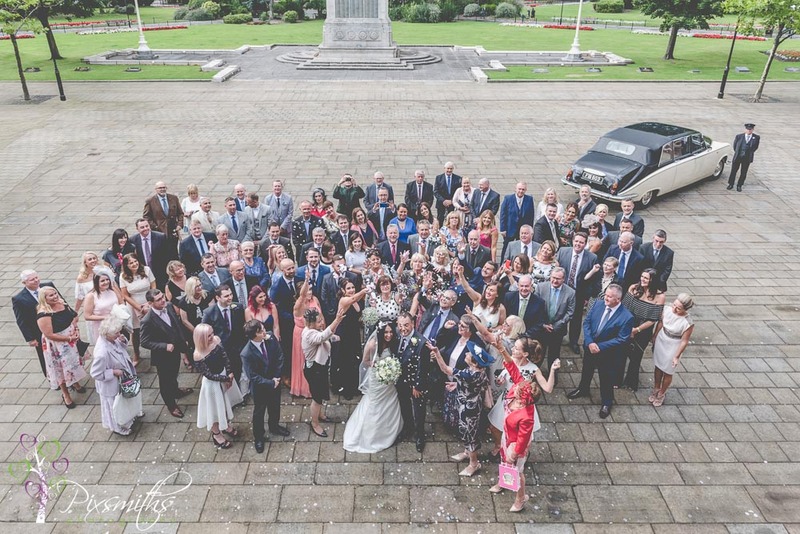 Ha spot the cork in the photo below! 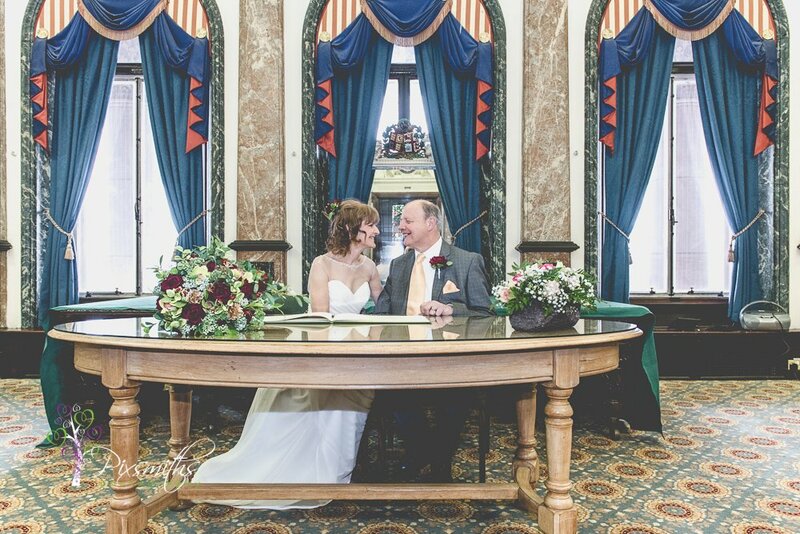 We were fortunate to have some extra time at the Manor whilst the room was being prepared to get some extra portraits which went down really well. 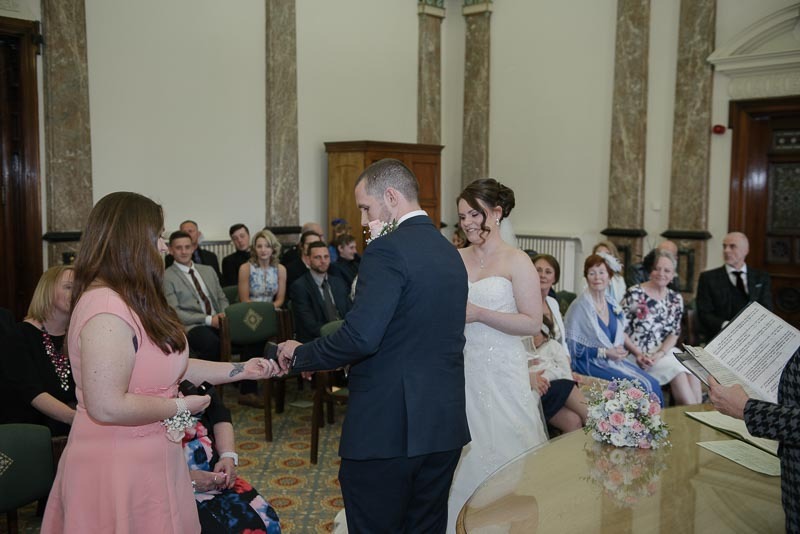 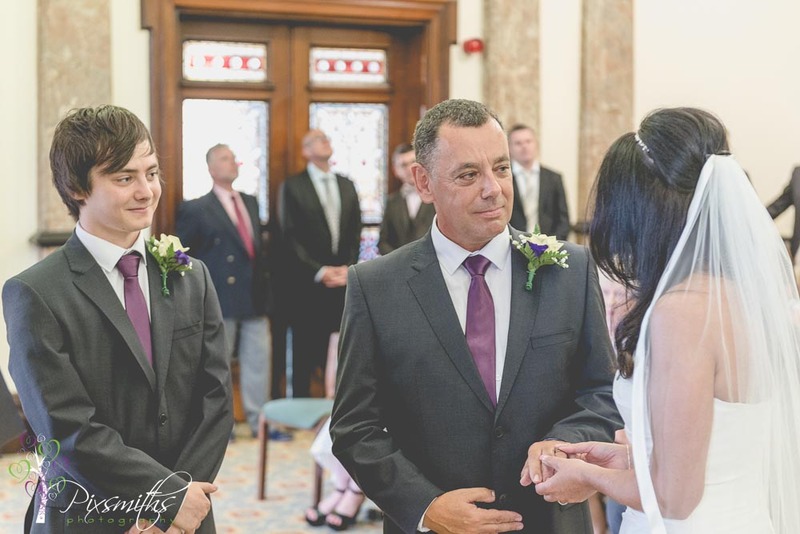 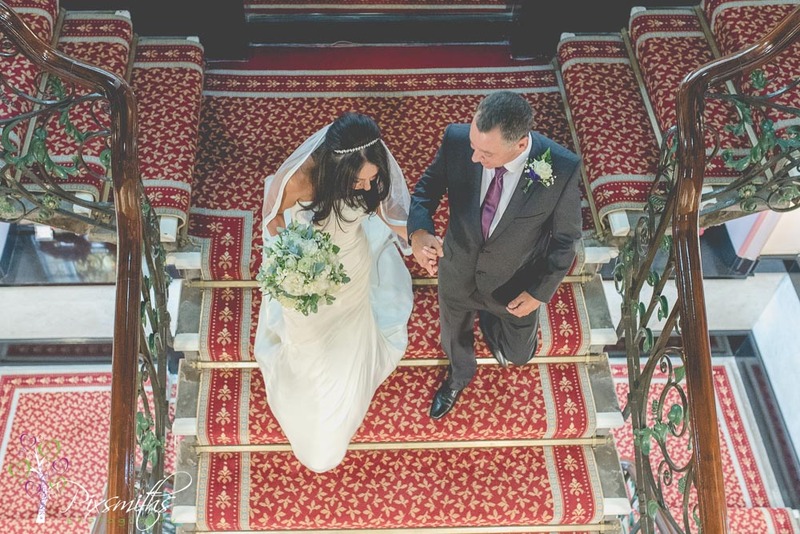 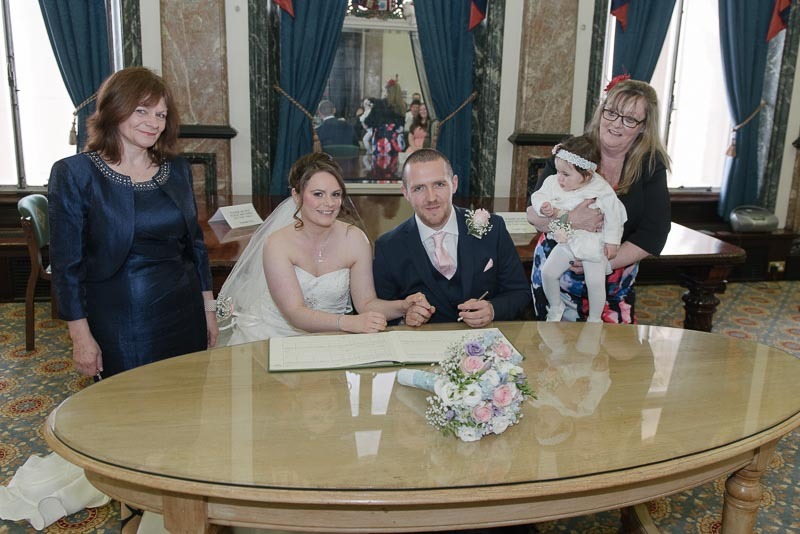 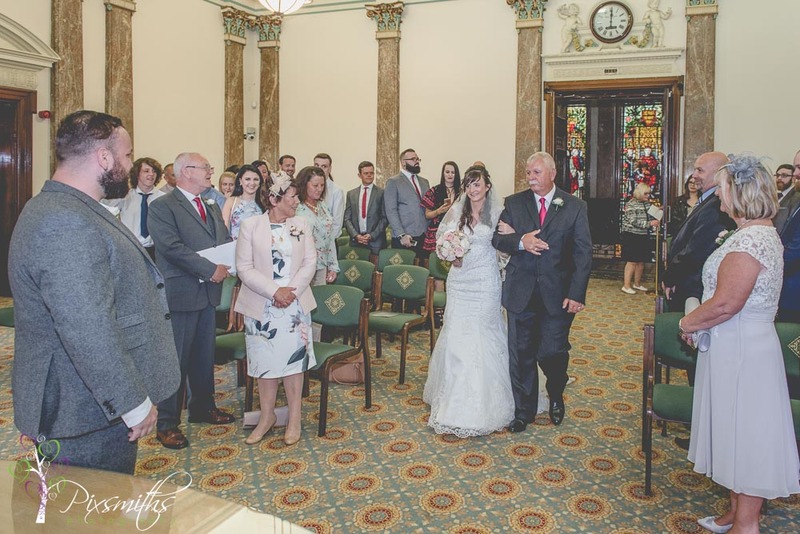 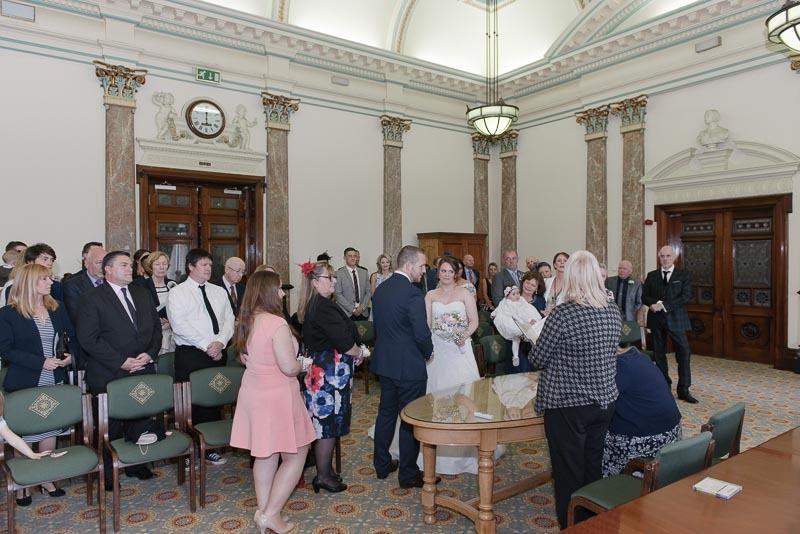 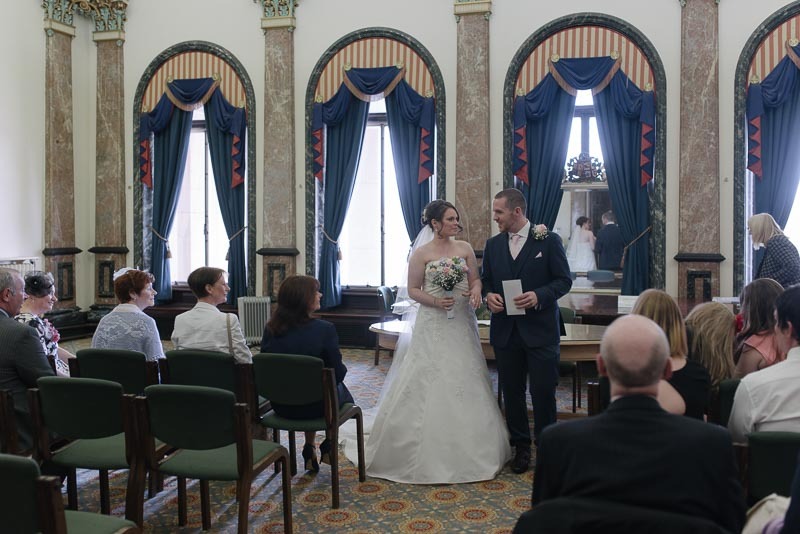 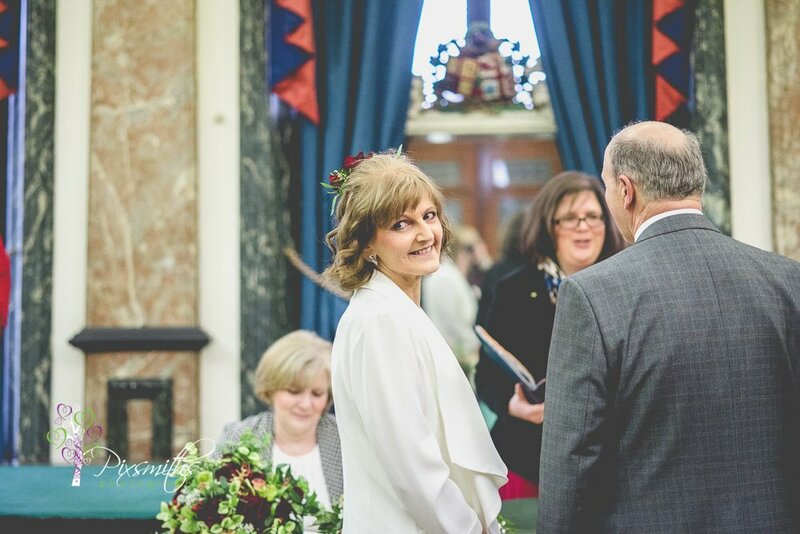 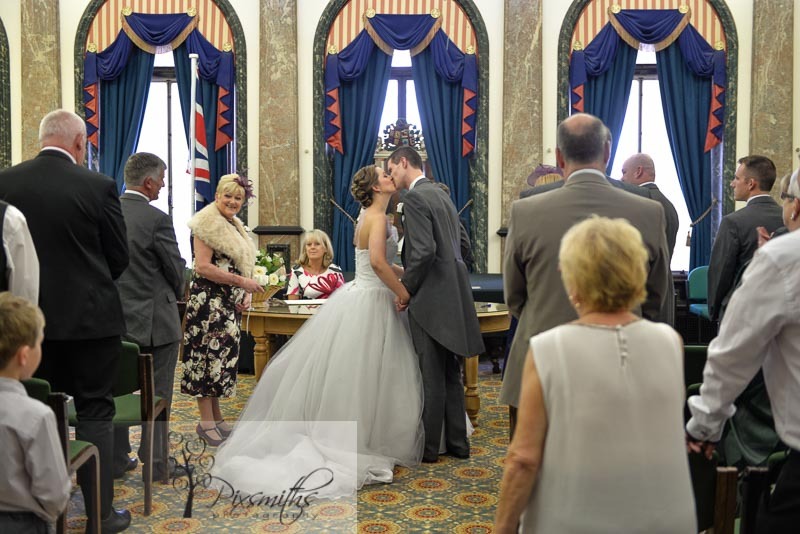 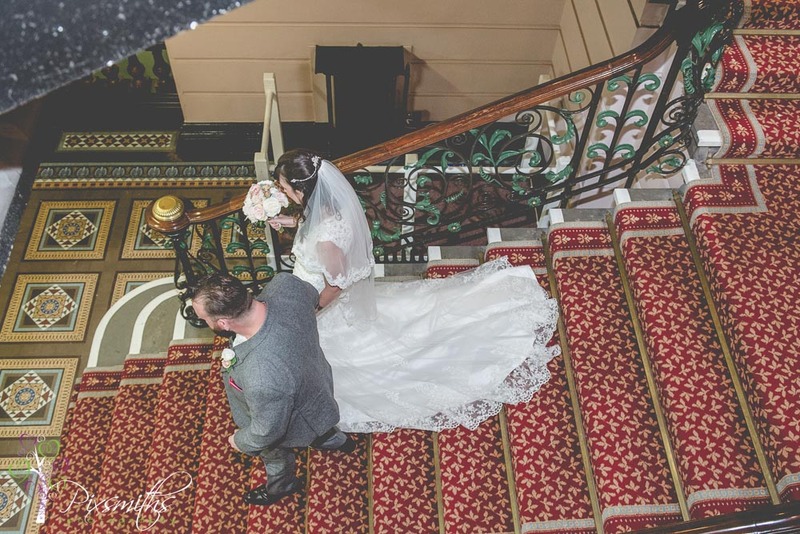 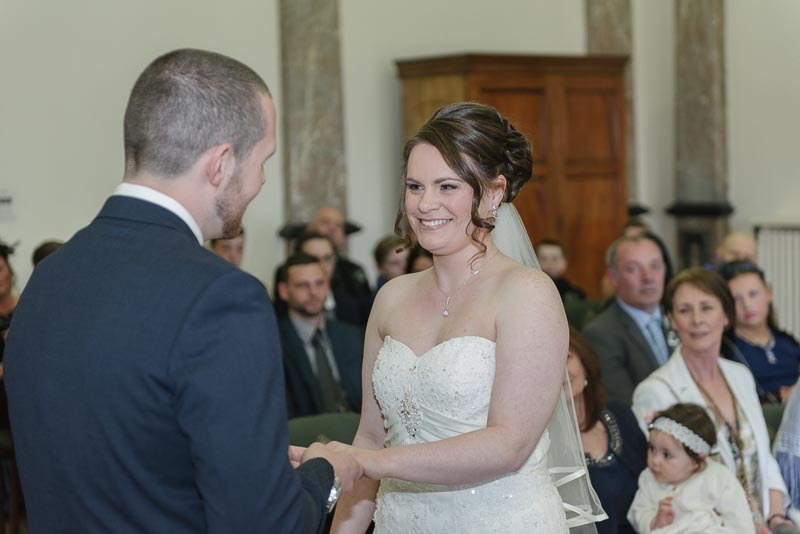 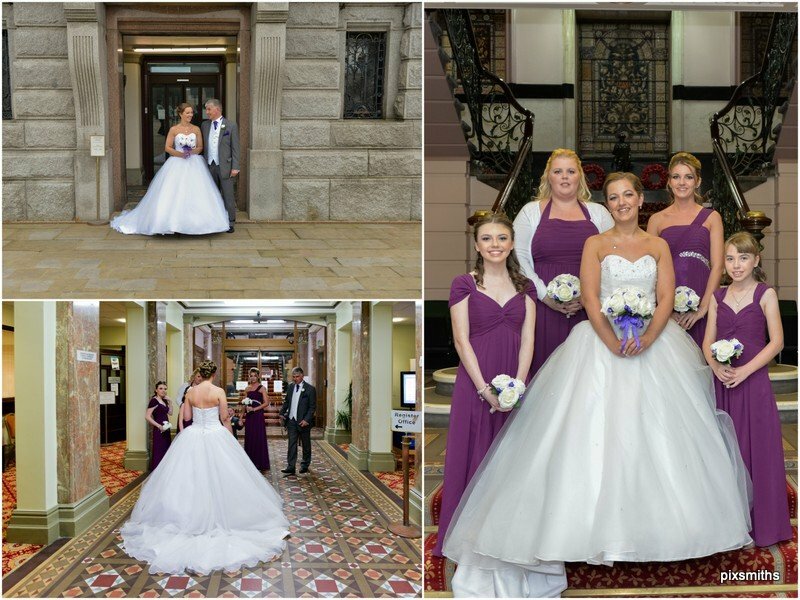 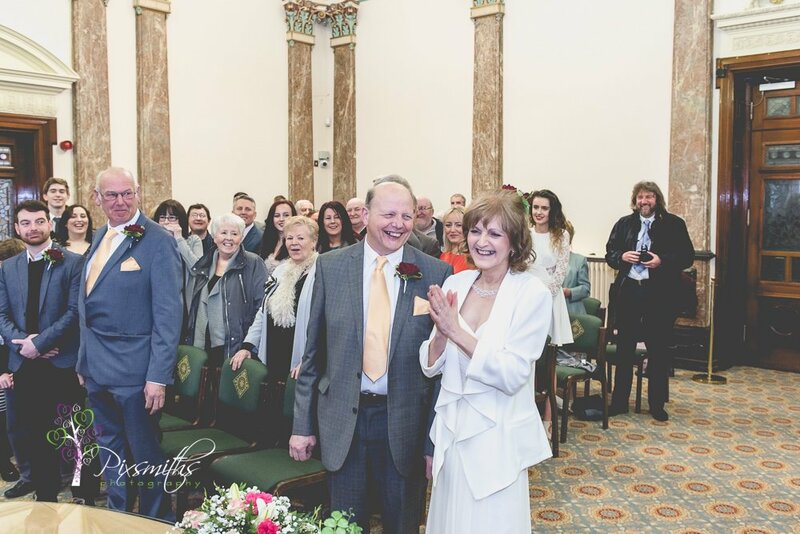 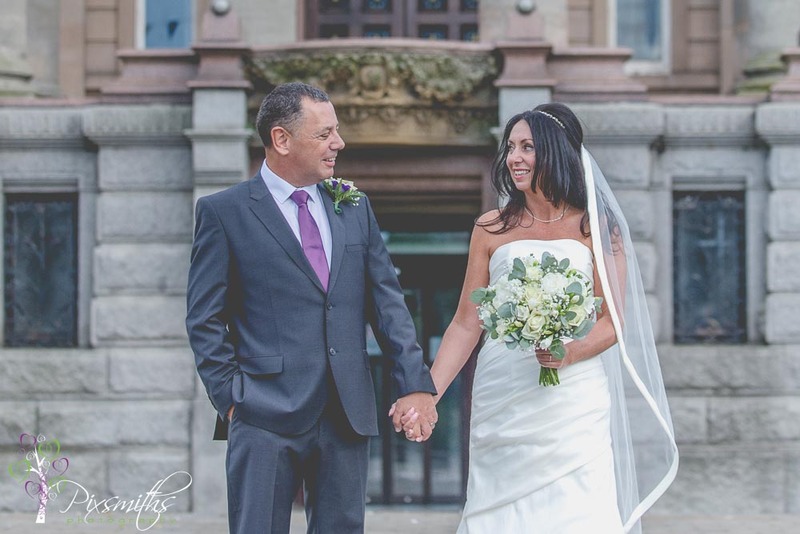 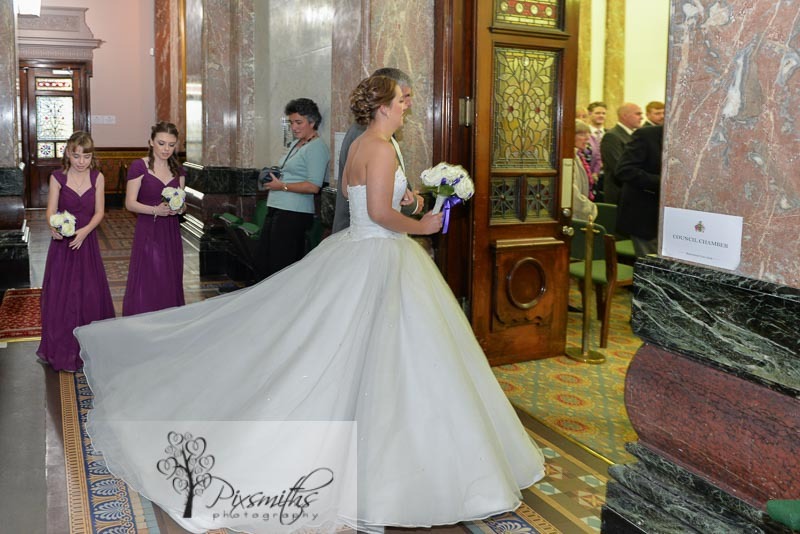 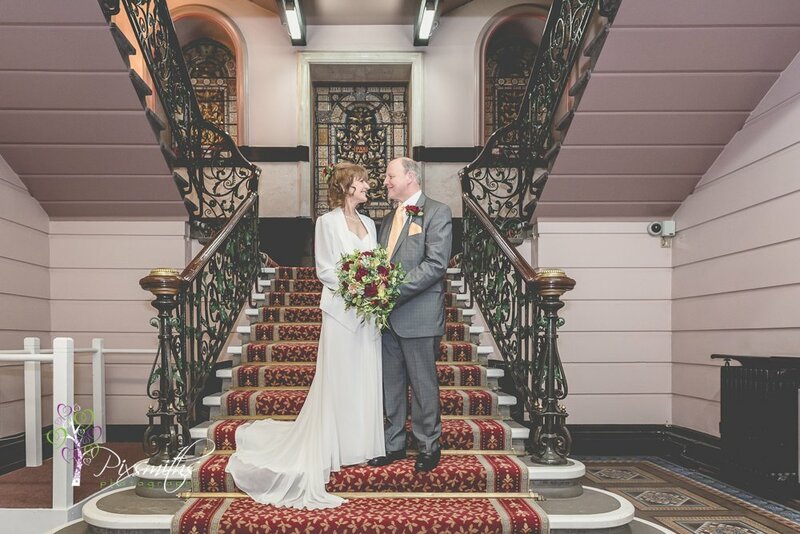 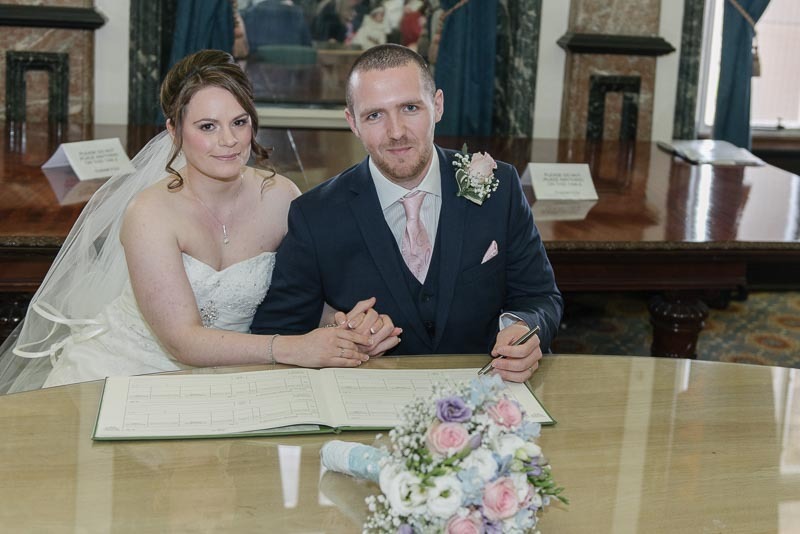 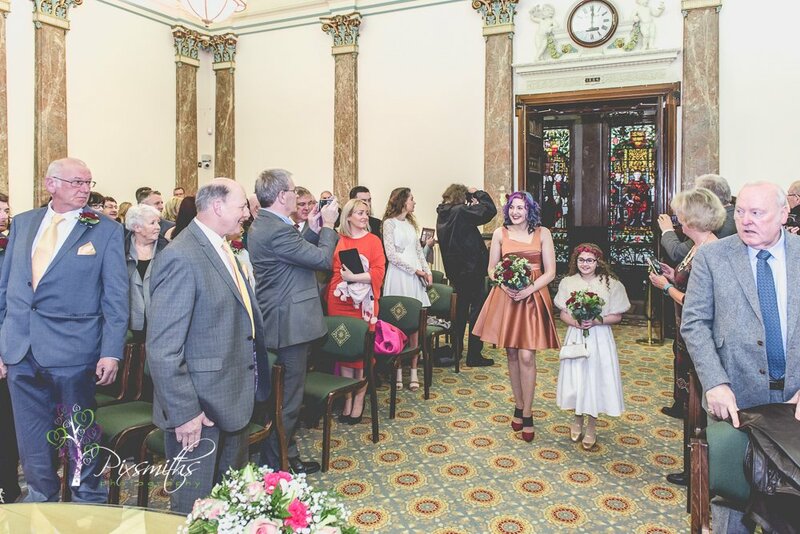 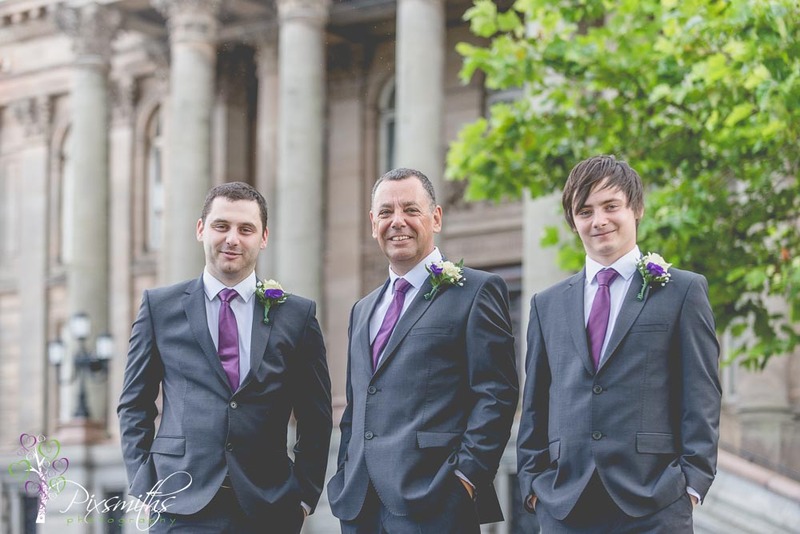 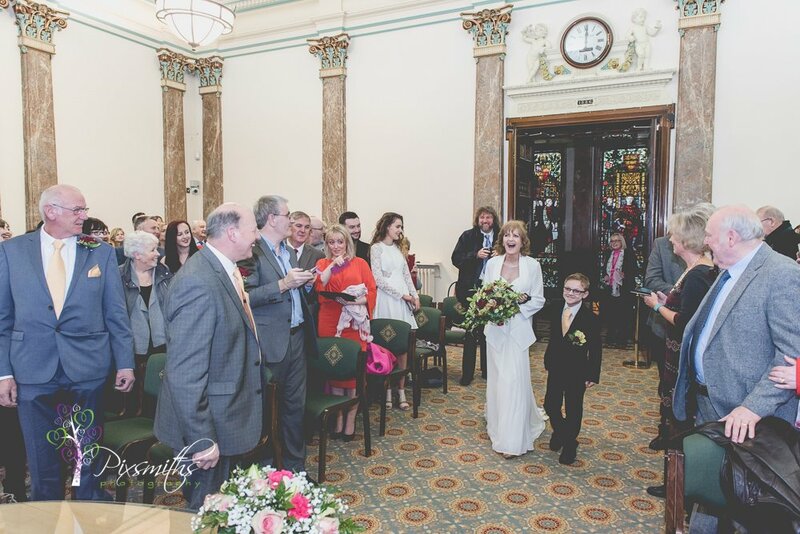 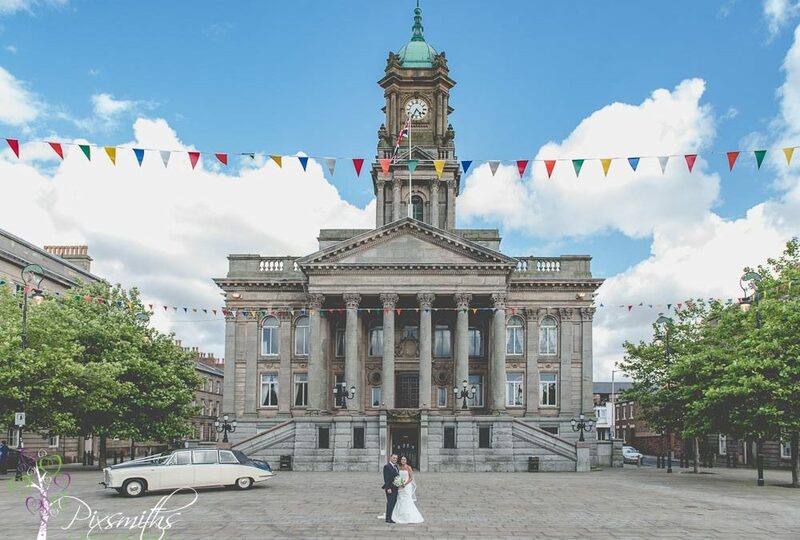 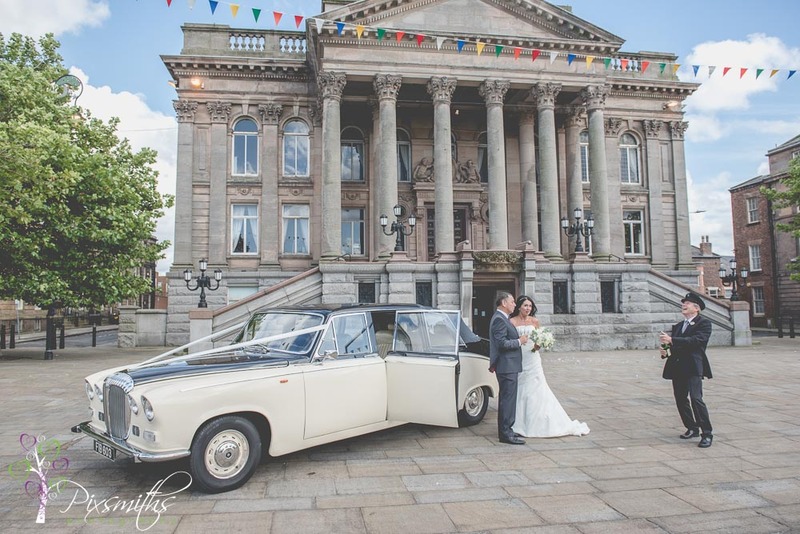 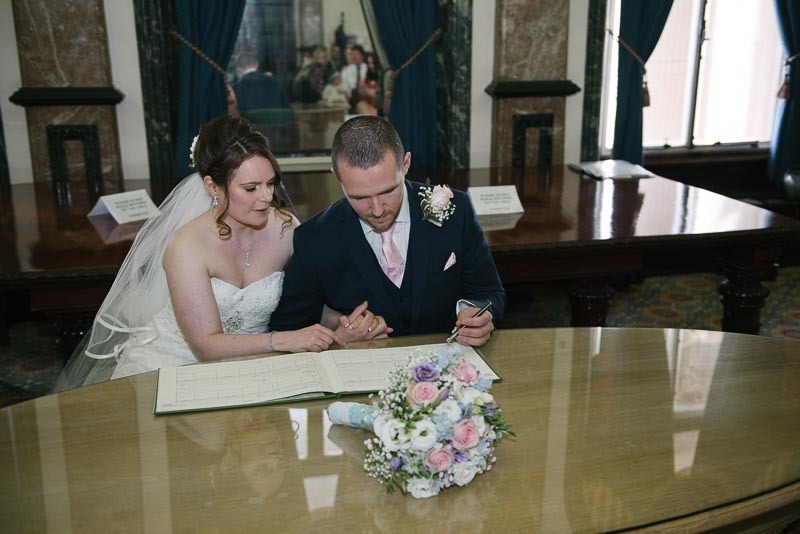 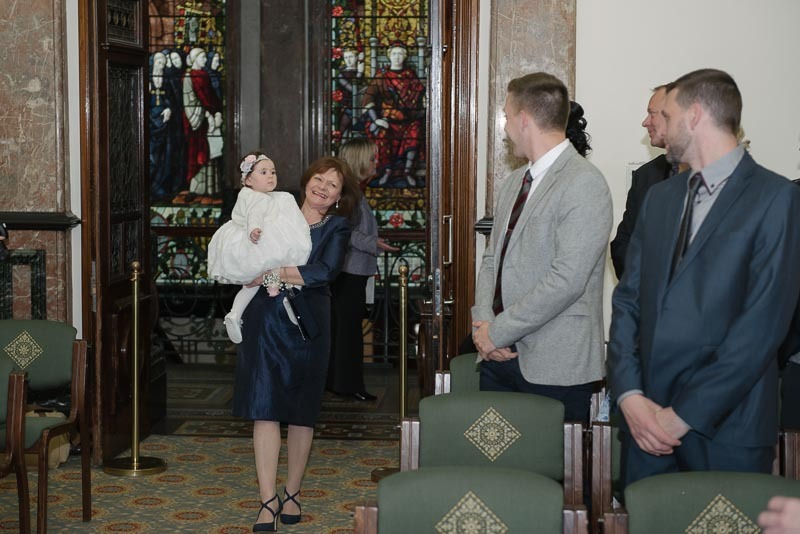 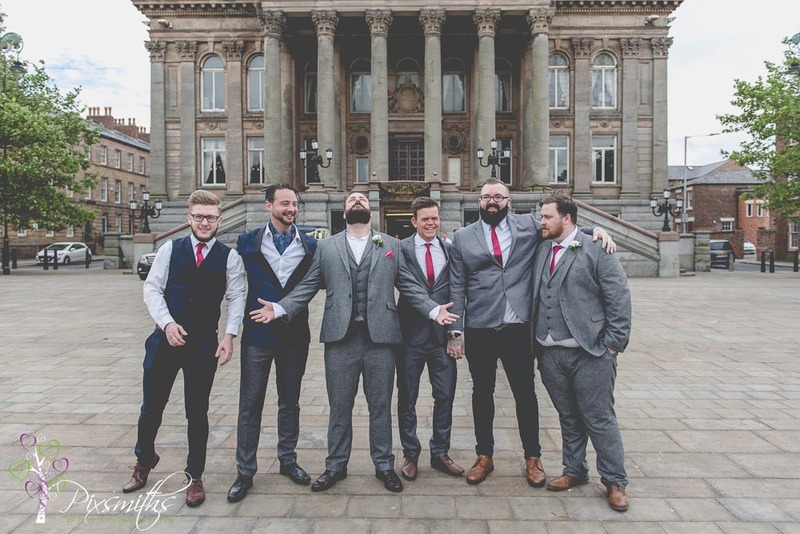 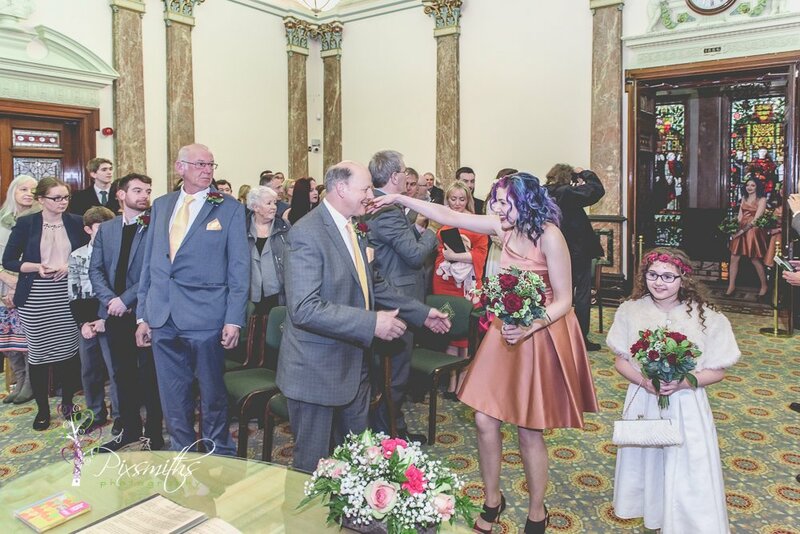 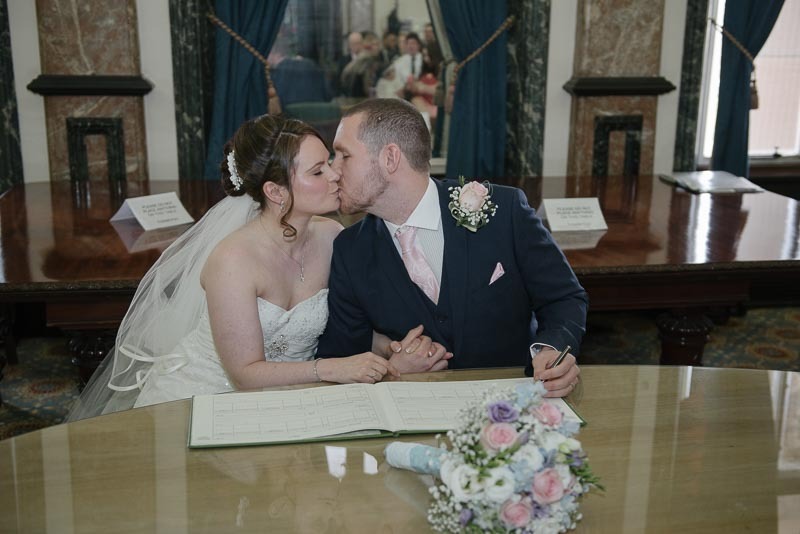 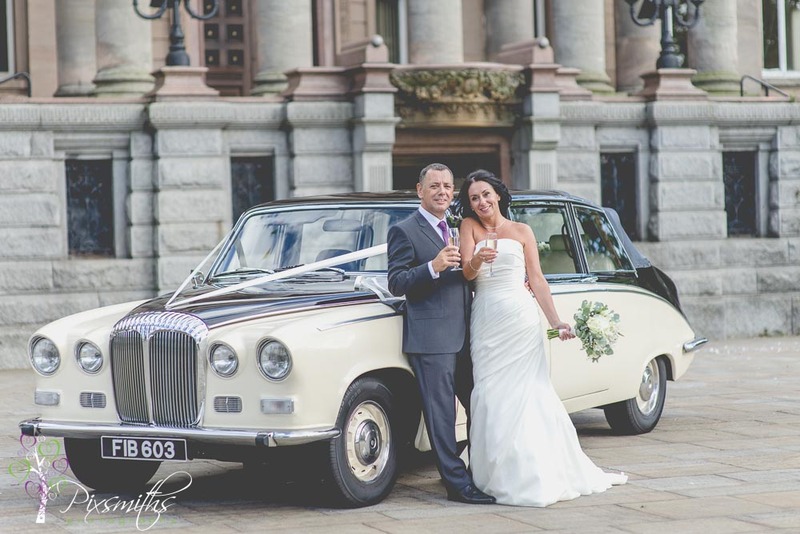 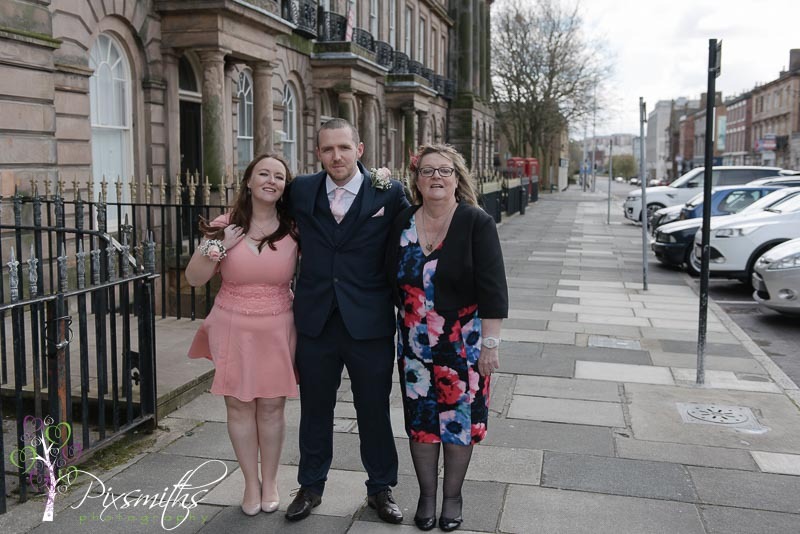 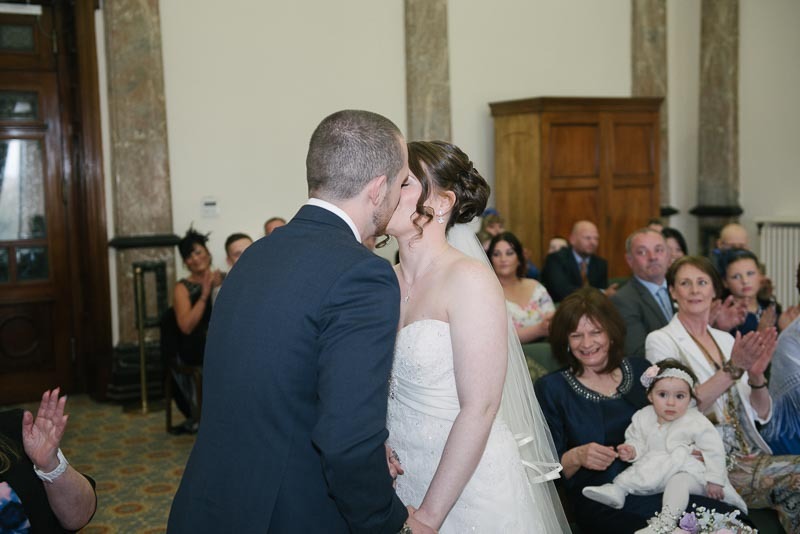 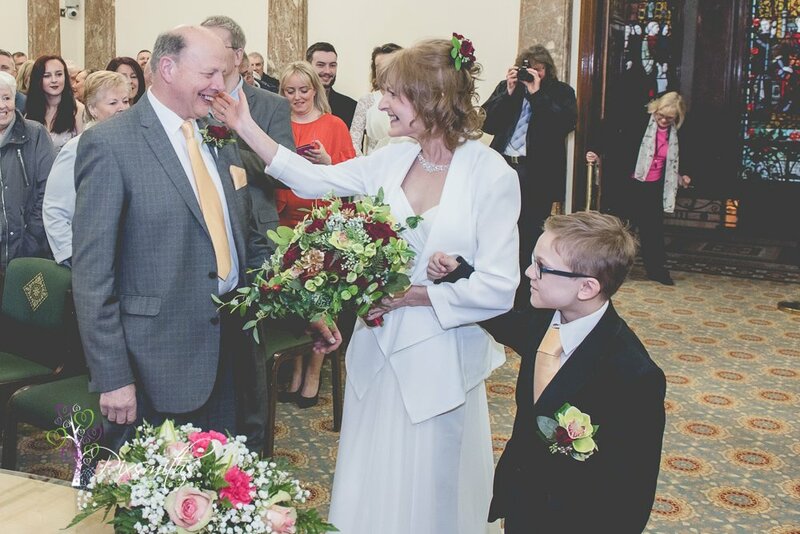 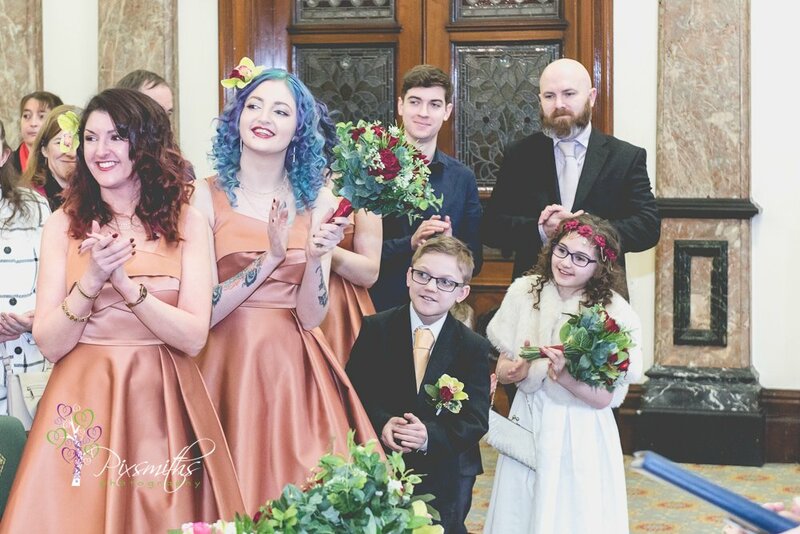 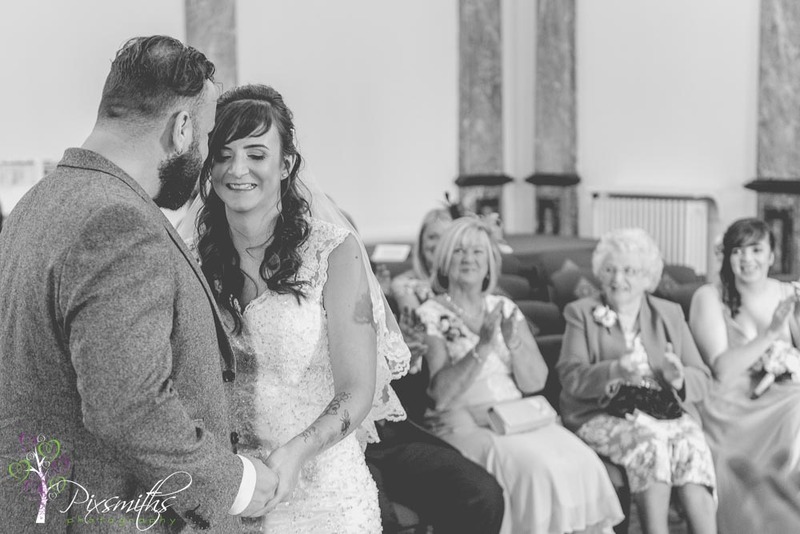 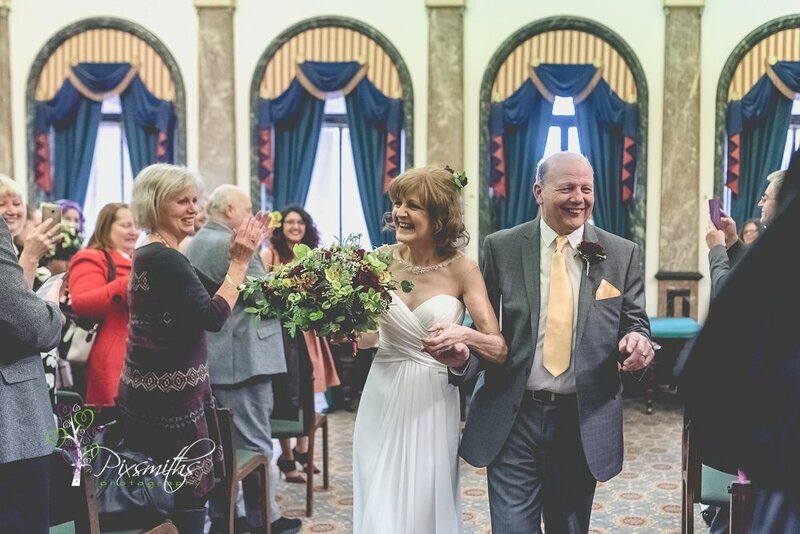 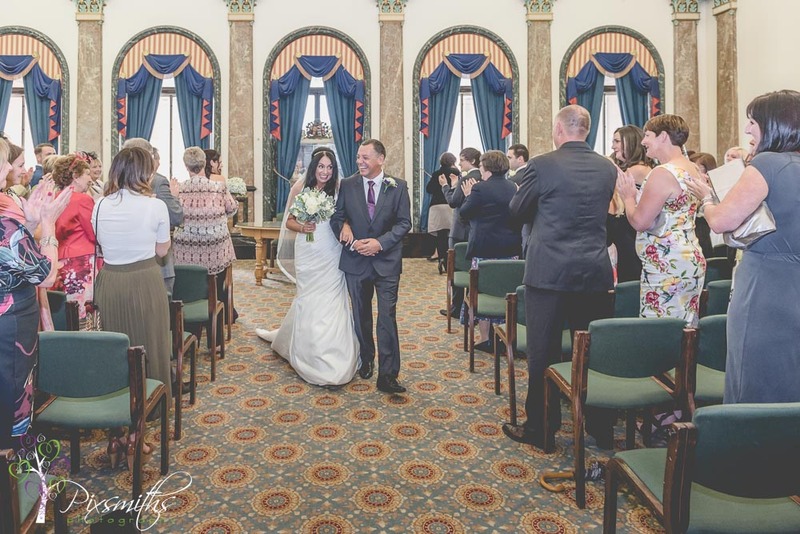 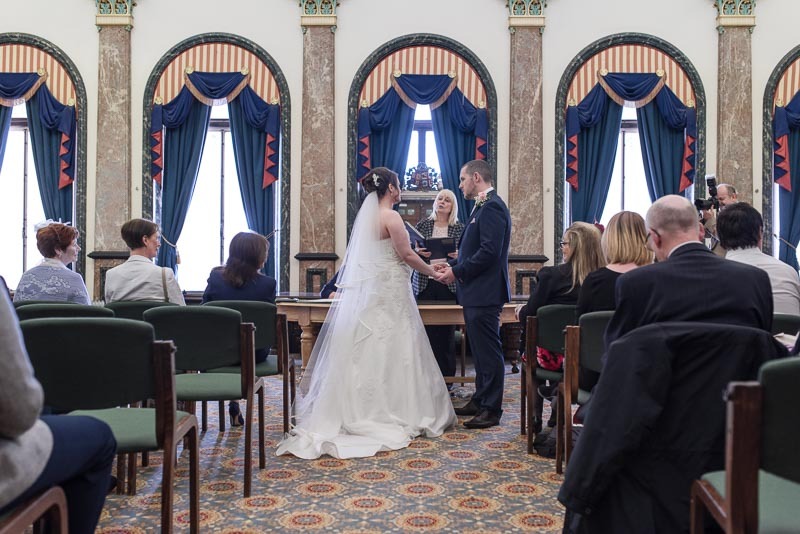 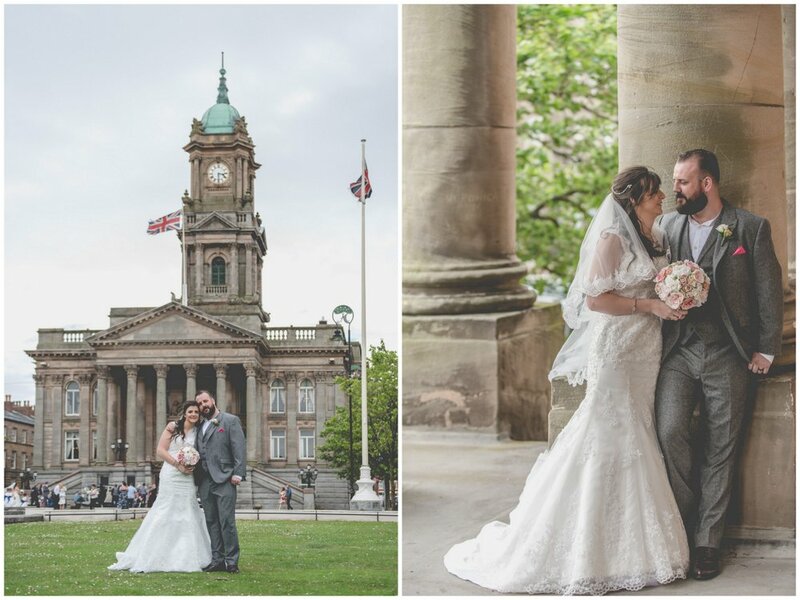 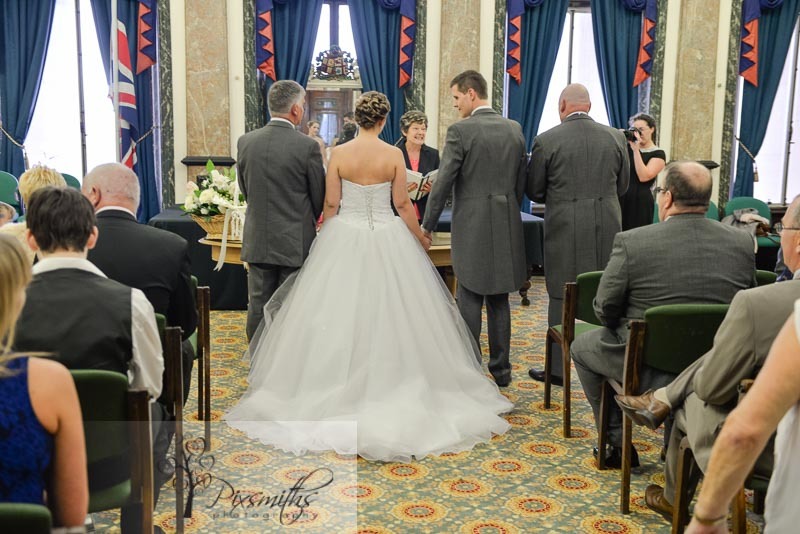 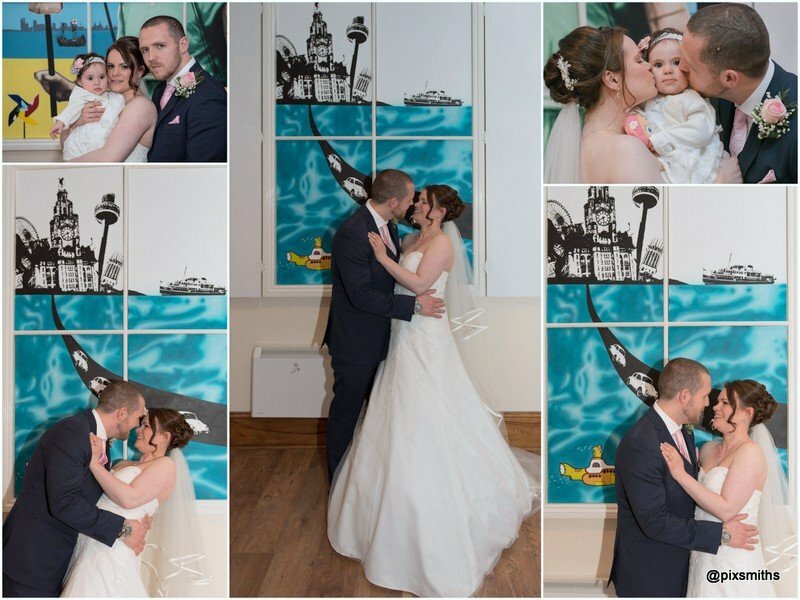 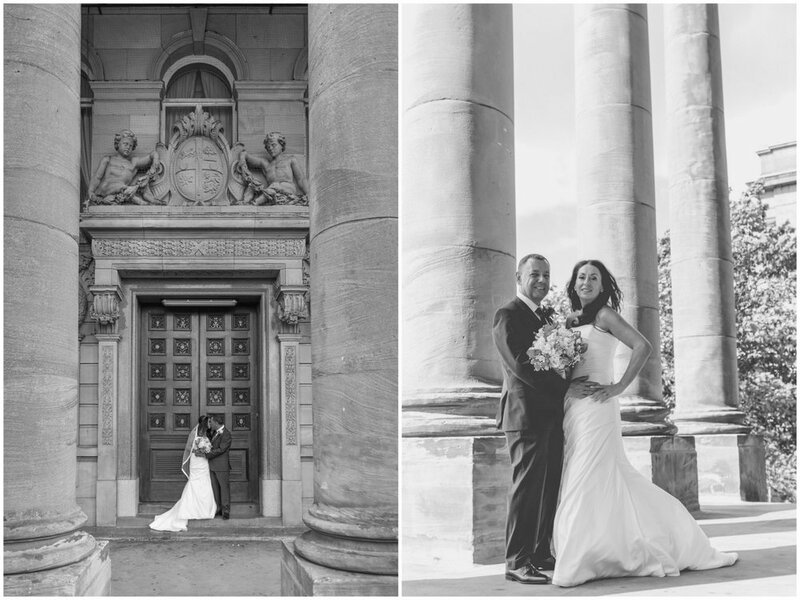 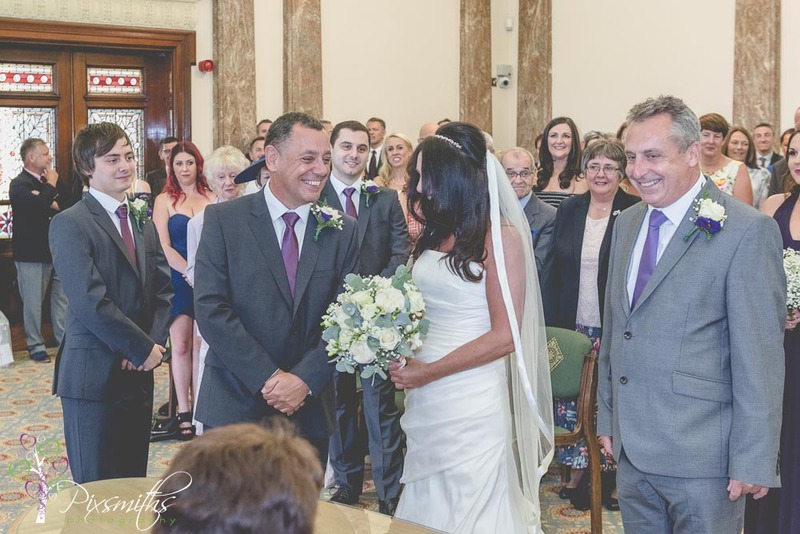 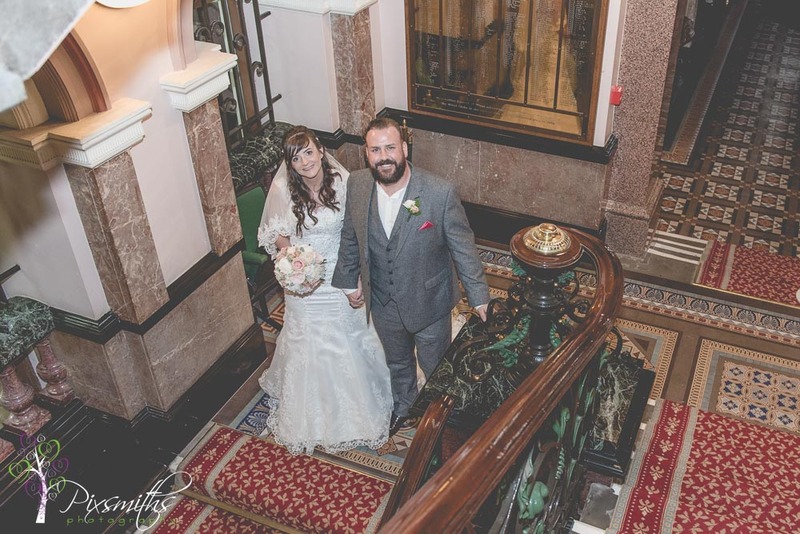 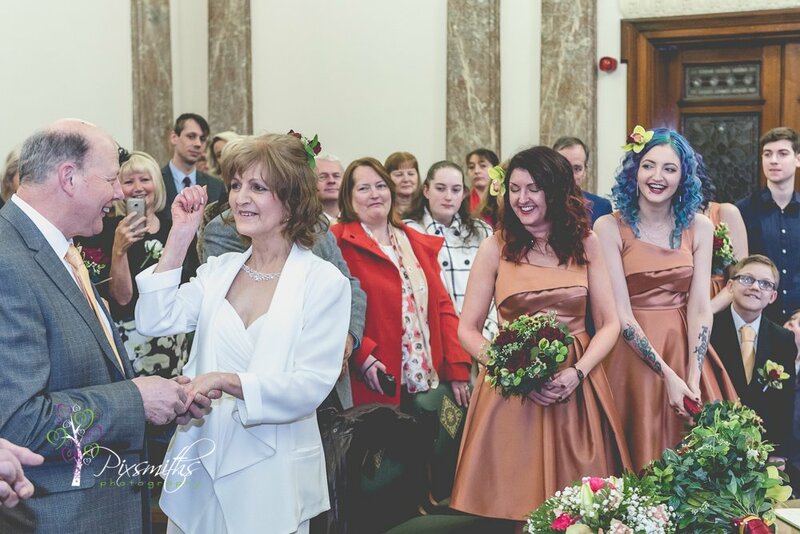 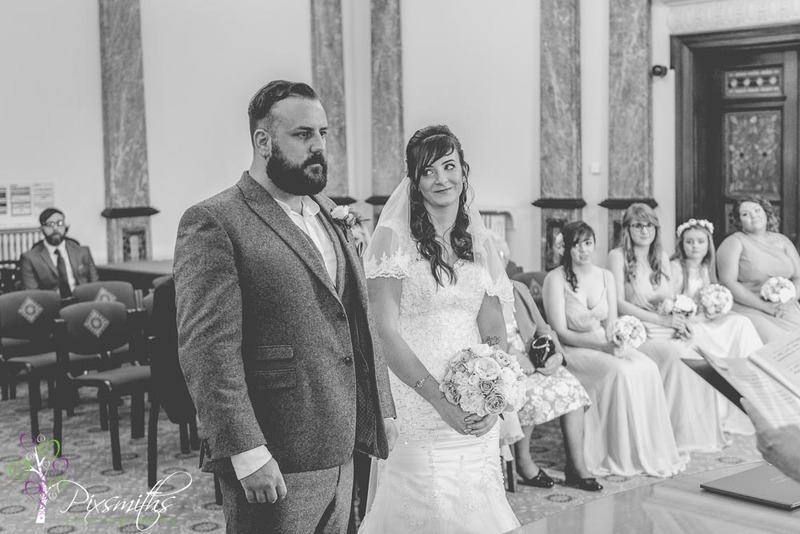 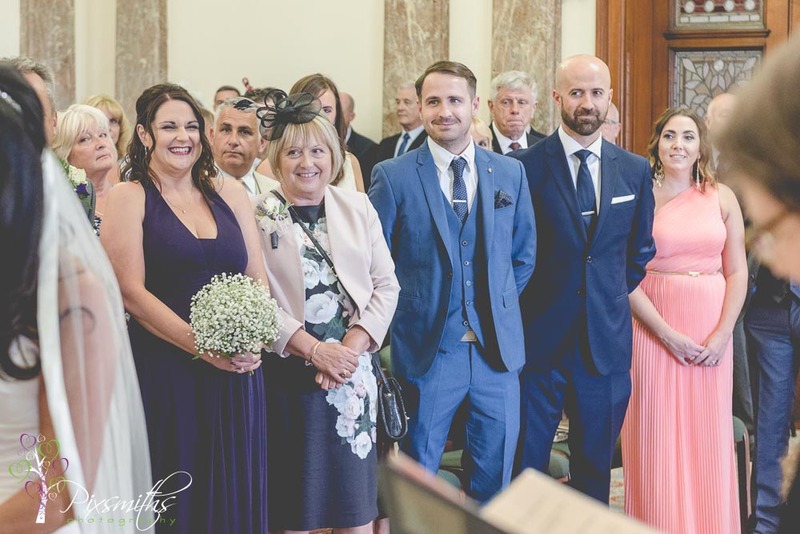 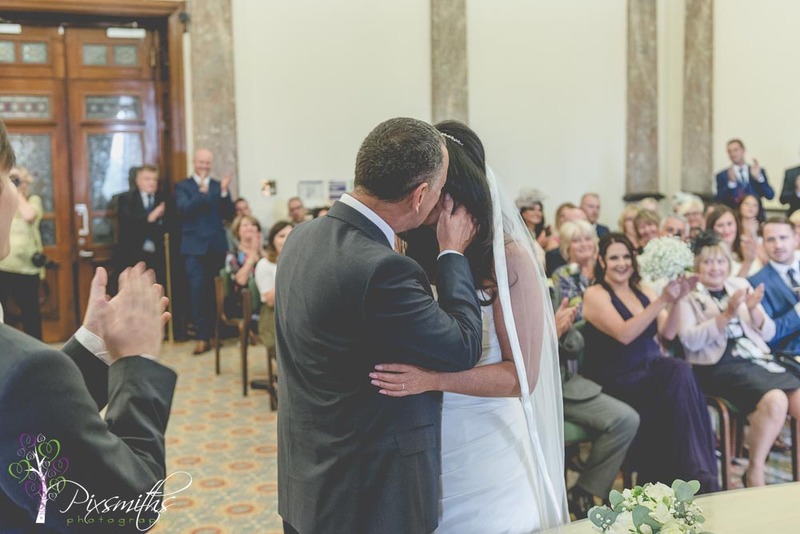 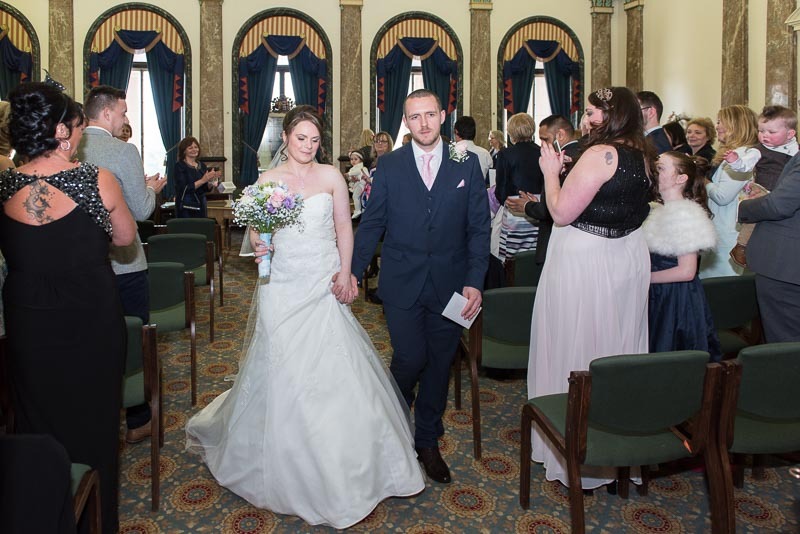 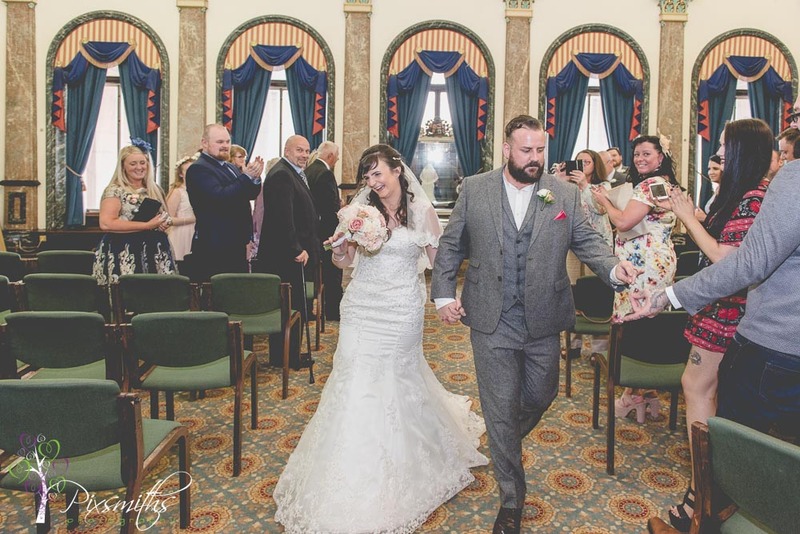 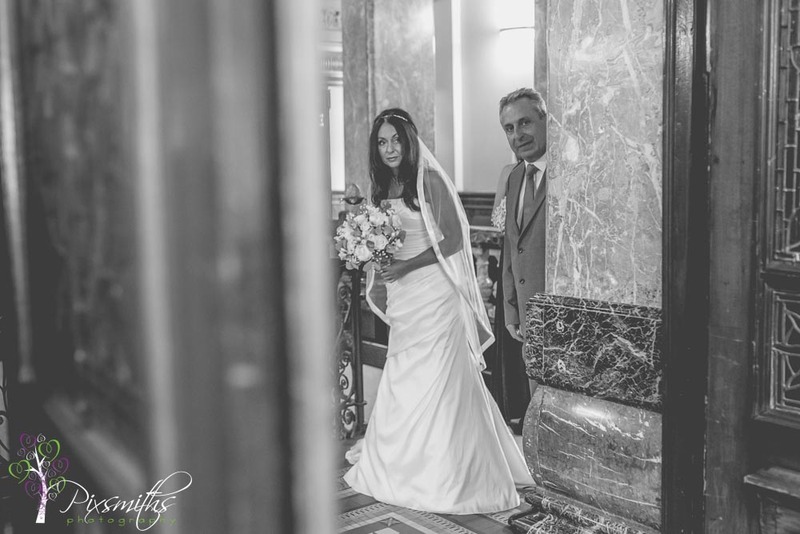 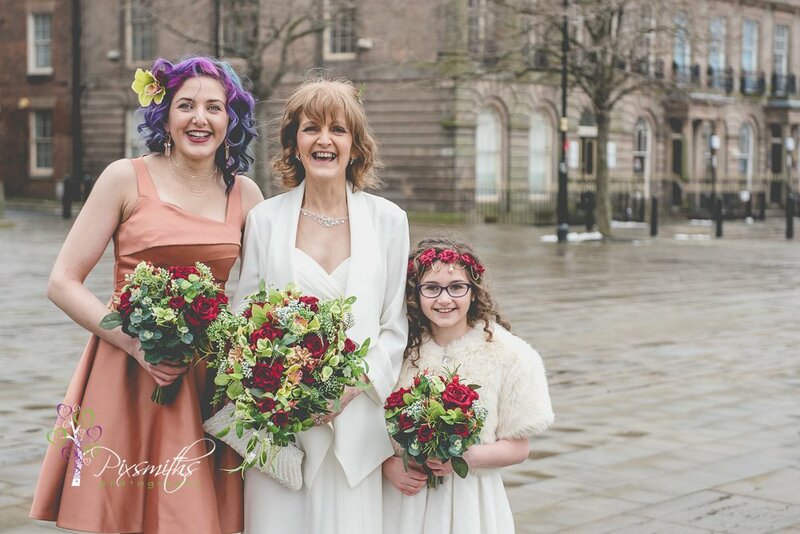 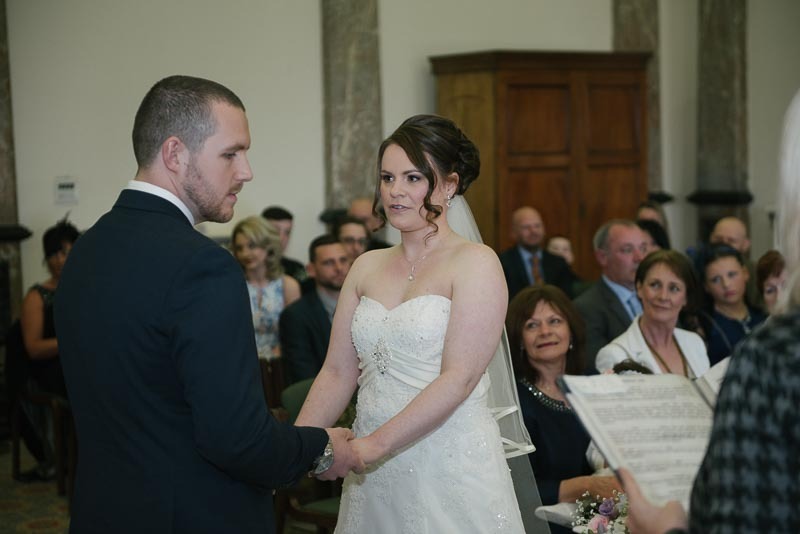 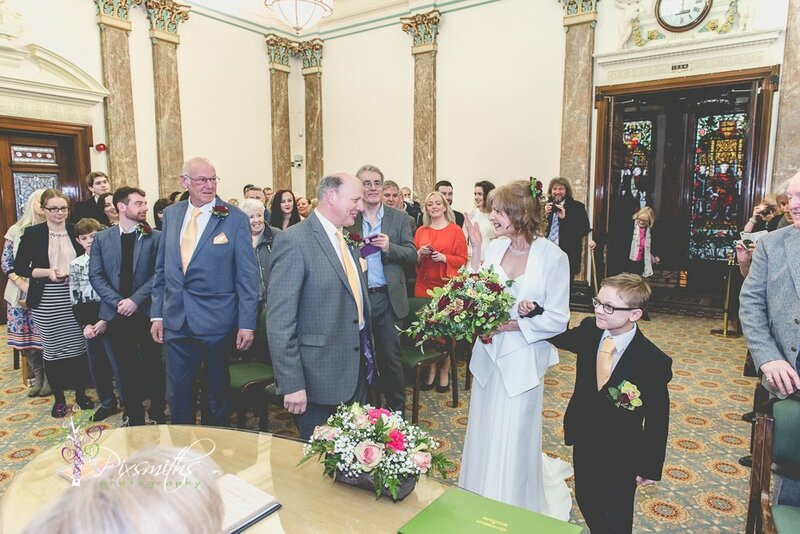 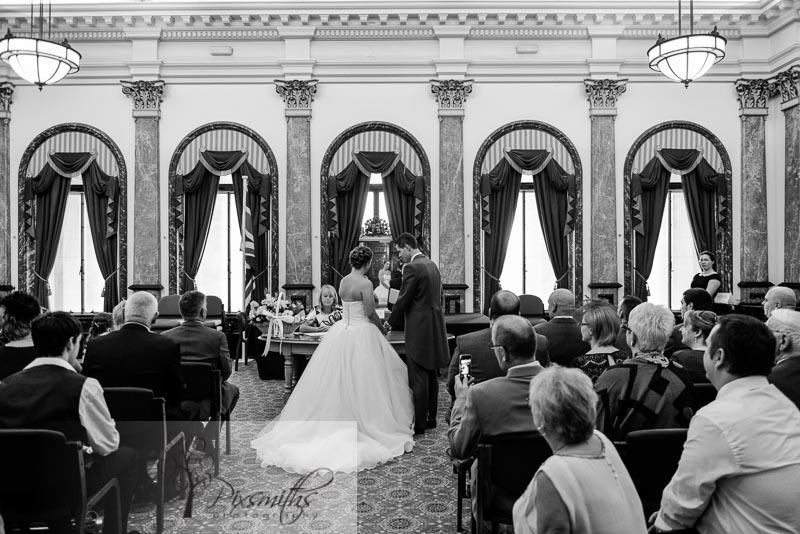 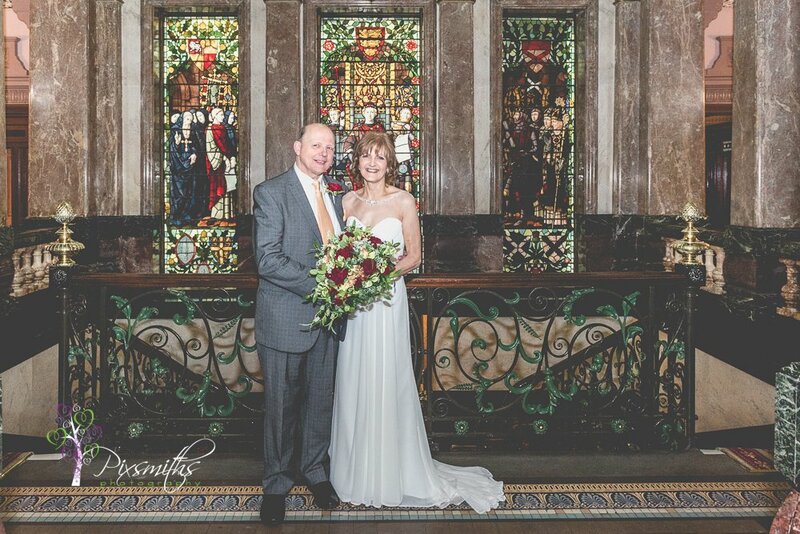 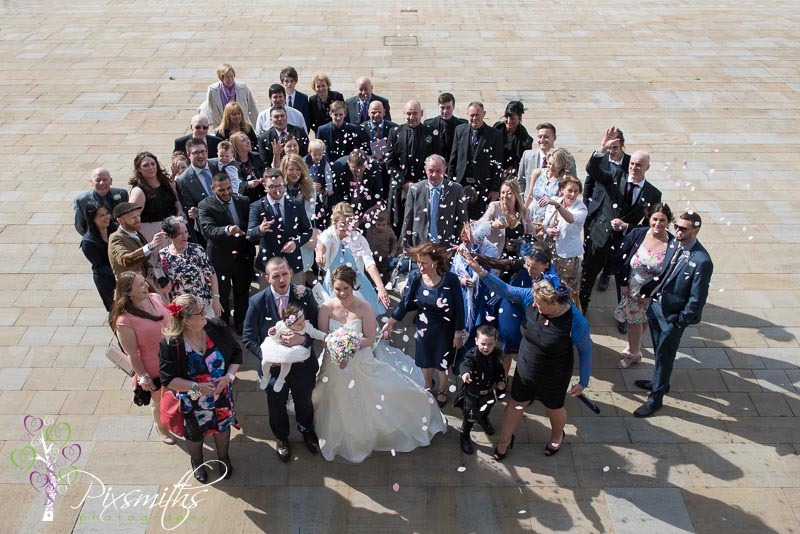 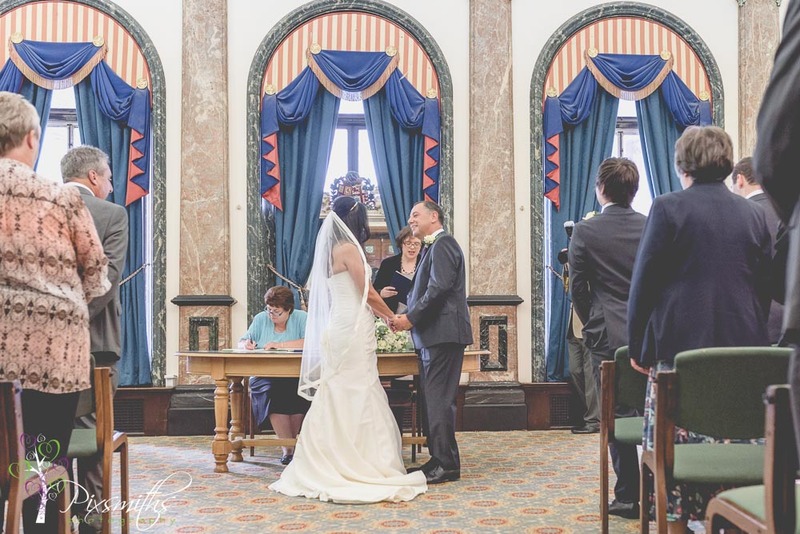 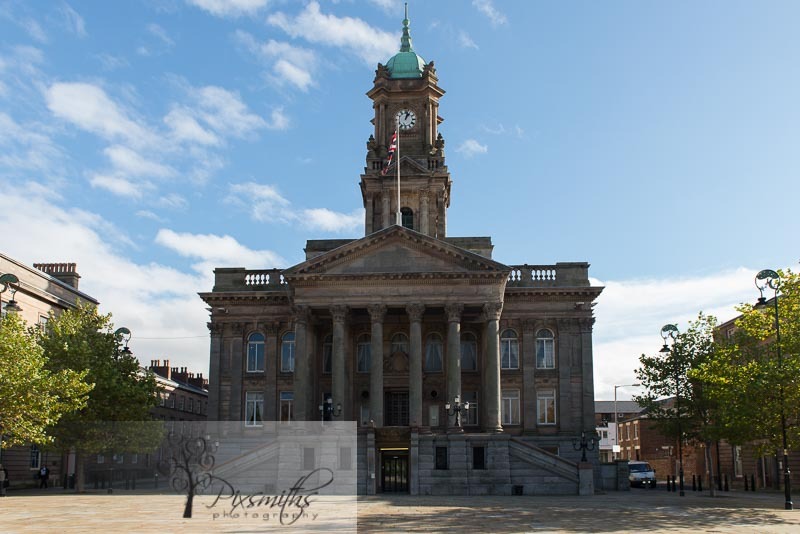 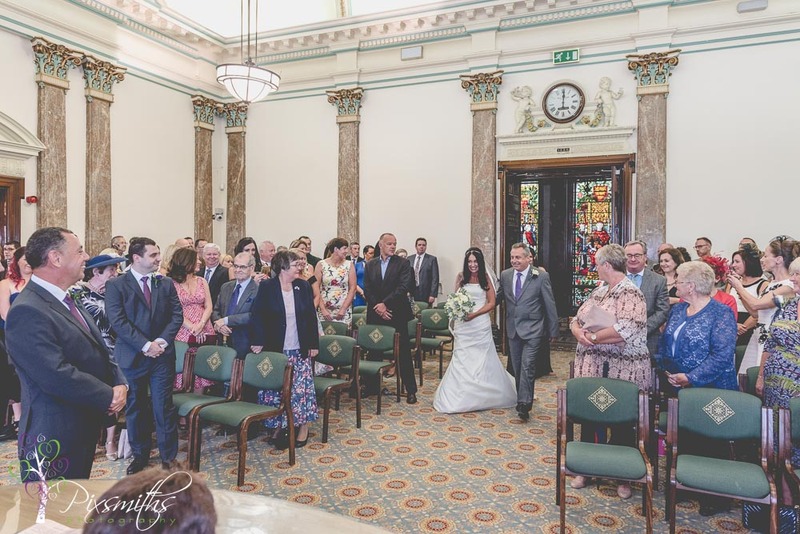 Birkenhead Town Hall weddings are extremely popular, especially on a Friday as they always take place in the beautiful upper room, gorgeous with its decor and stained glass. 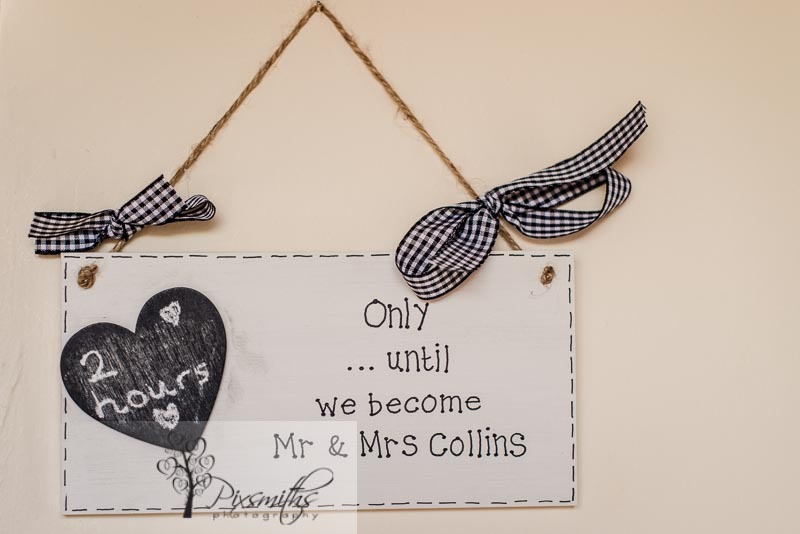 Currently weddings can be 30 minutes apart although this will soon be extended. 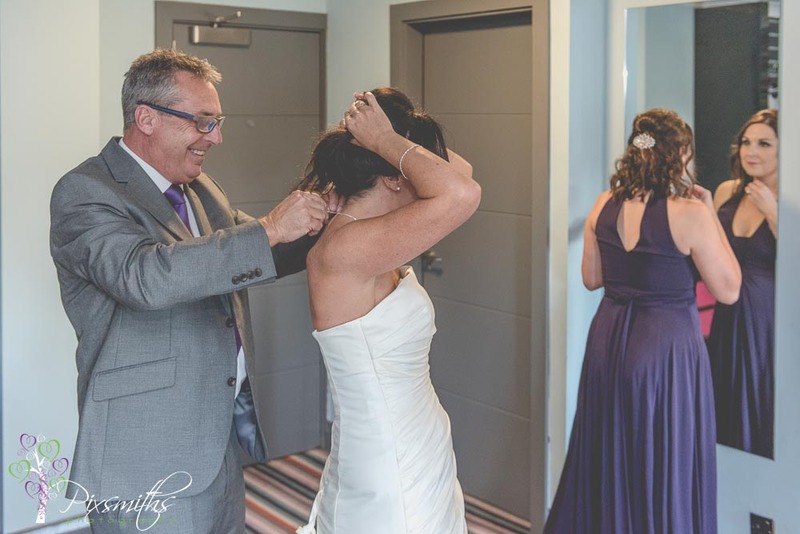 This is why its so important being on time – Laura and Bill where. 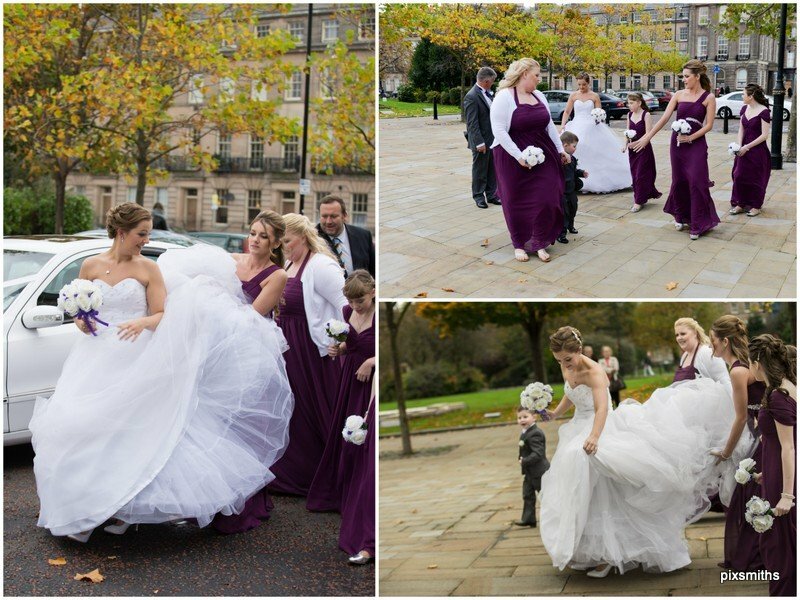 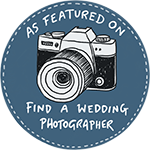 Lateness can impact on your timings for photos on stirs etc..with other weddings crossing over so please be aware of this. 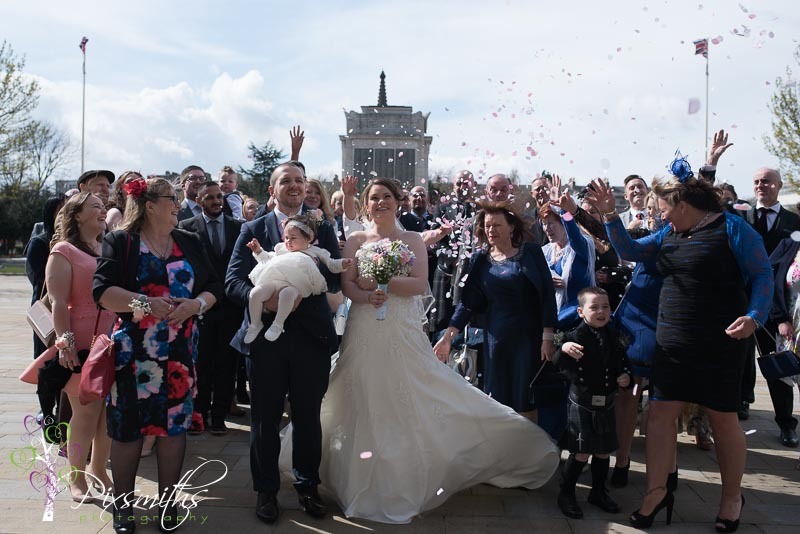 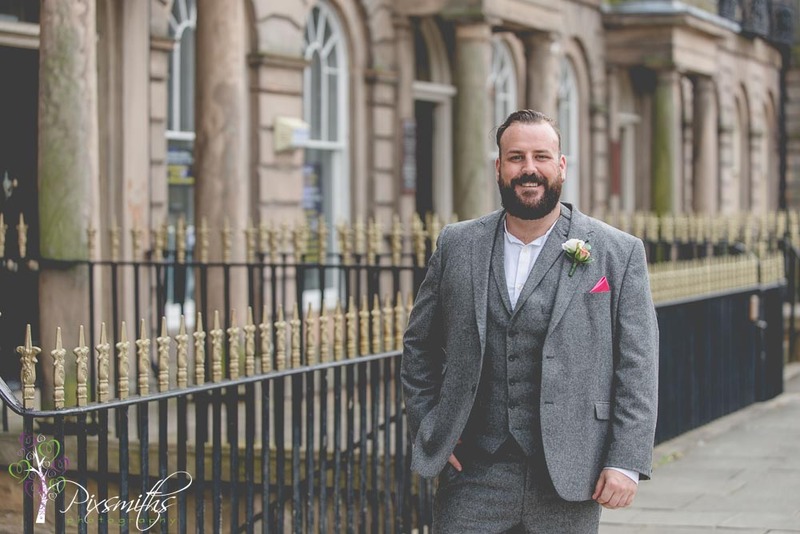 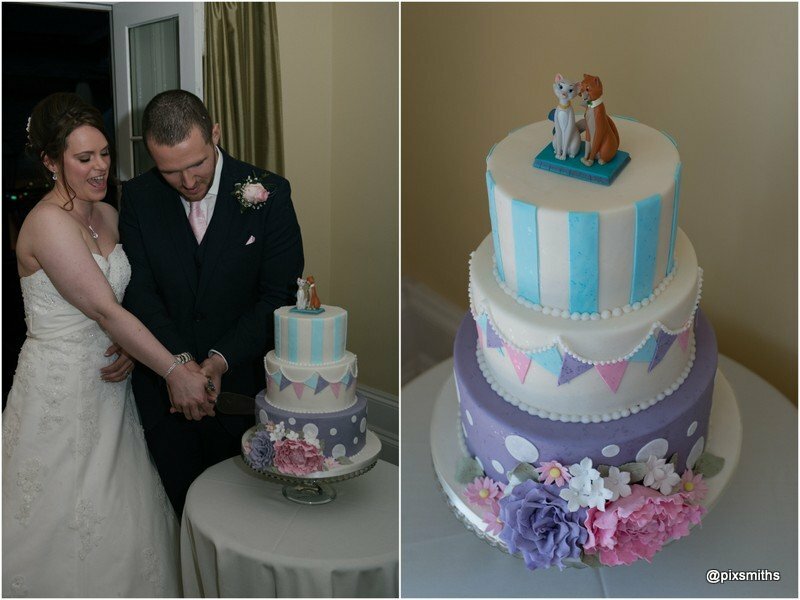 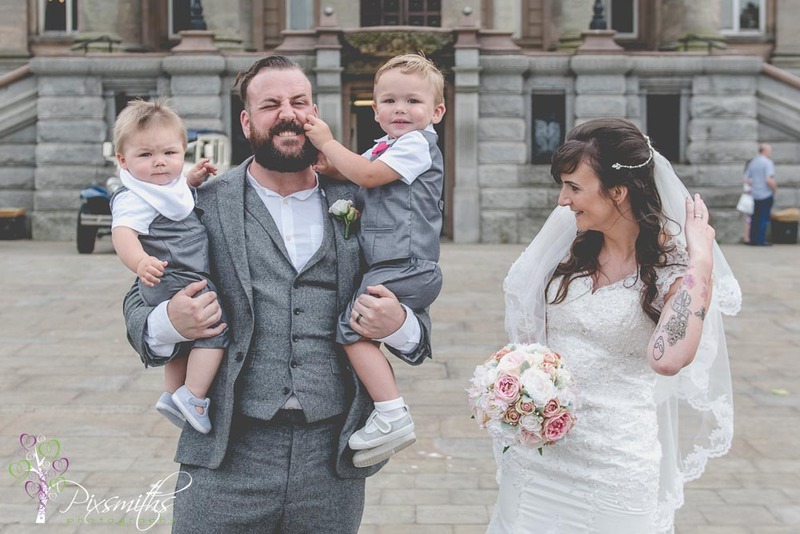 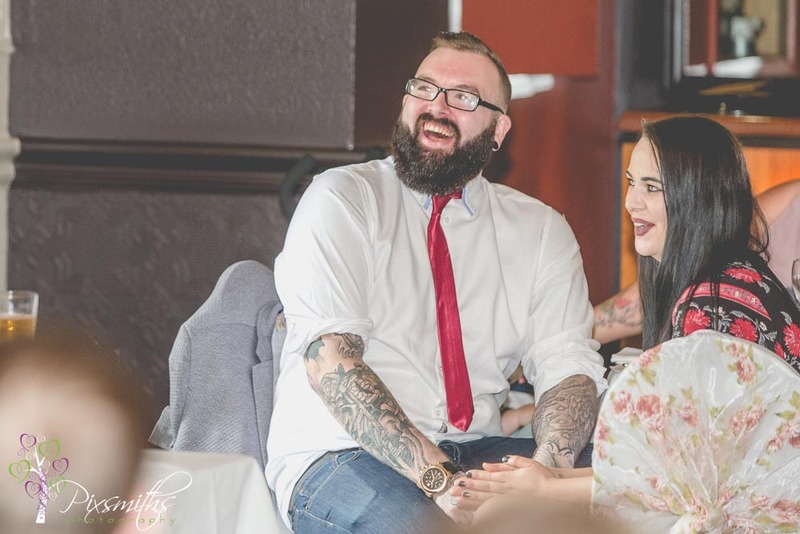 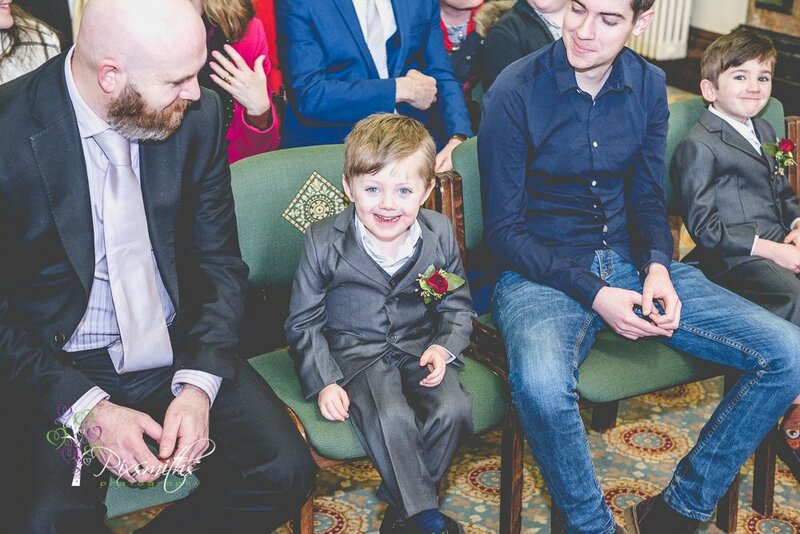 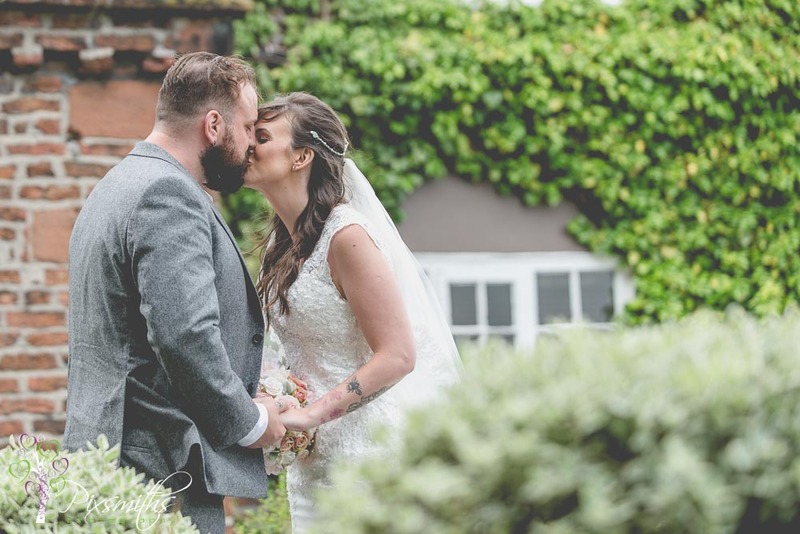 We strongly believe things happen for a reason … cat loving Kristie and Chris booked us some time back for a wedding and then a little bundle of joy arrived. 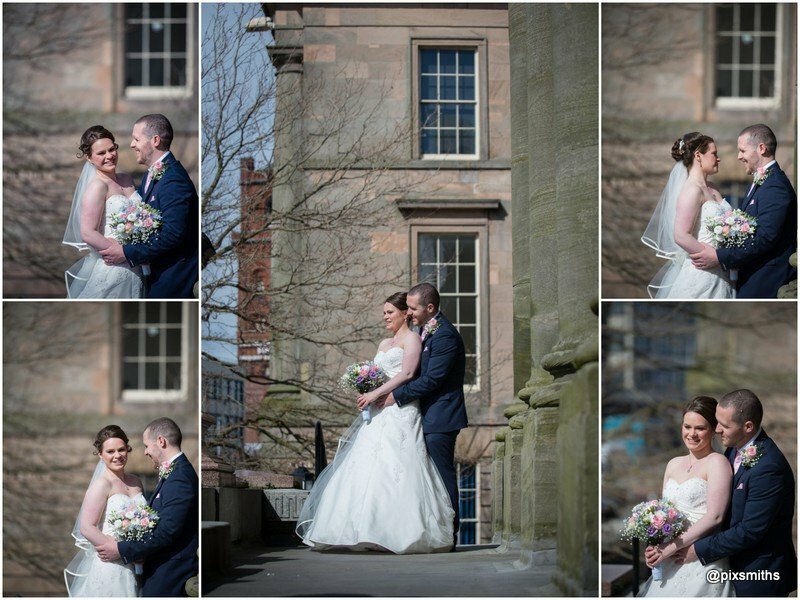 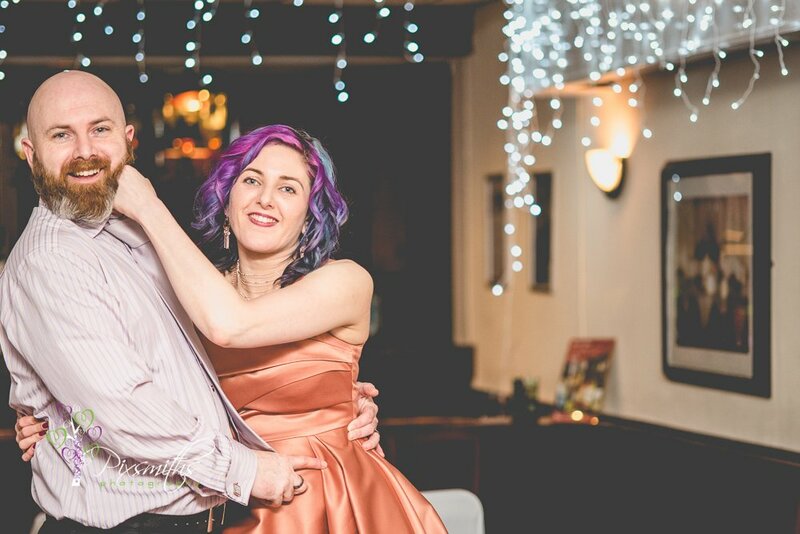 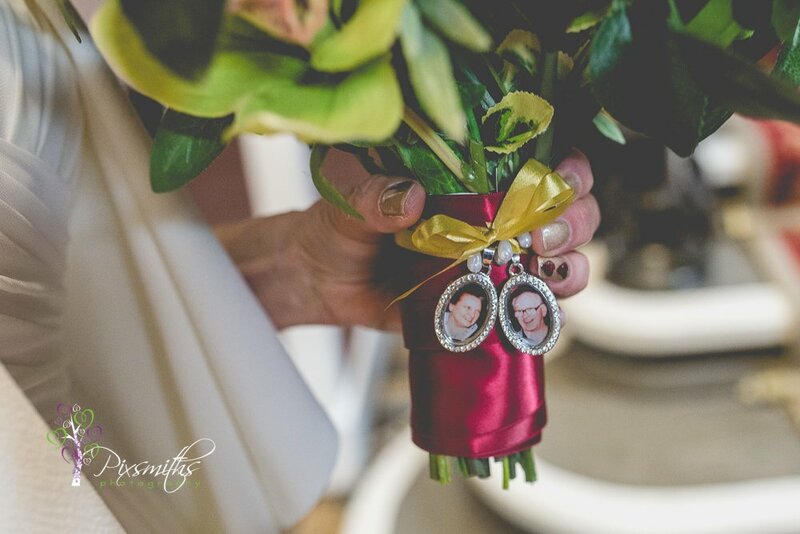 Date and plans changed, but delighted they still wanted us as their photographers. 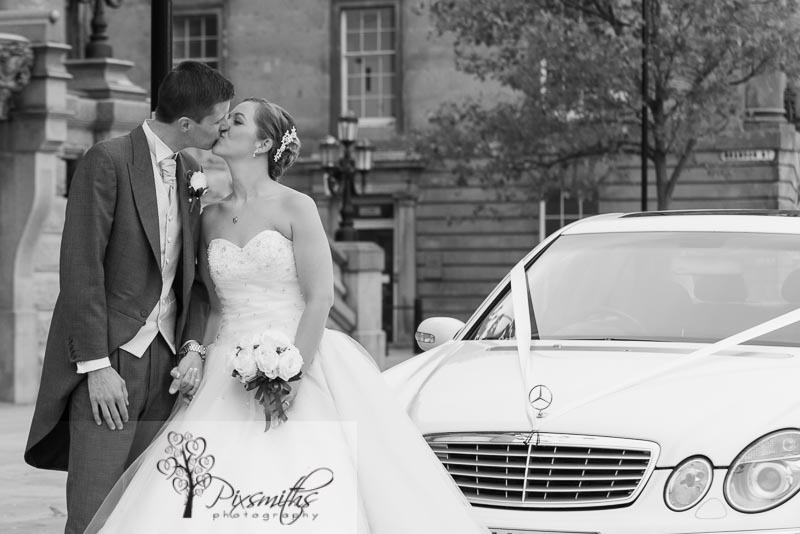 S o happy we were available for new date and deposit was carried across, no problem. 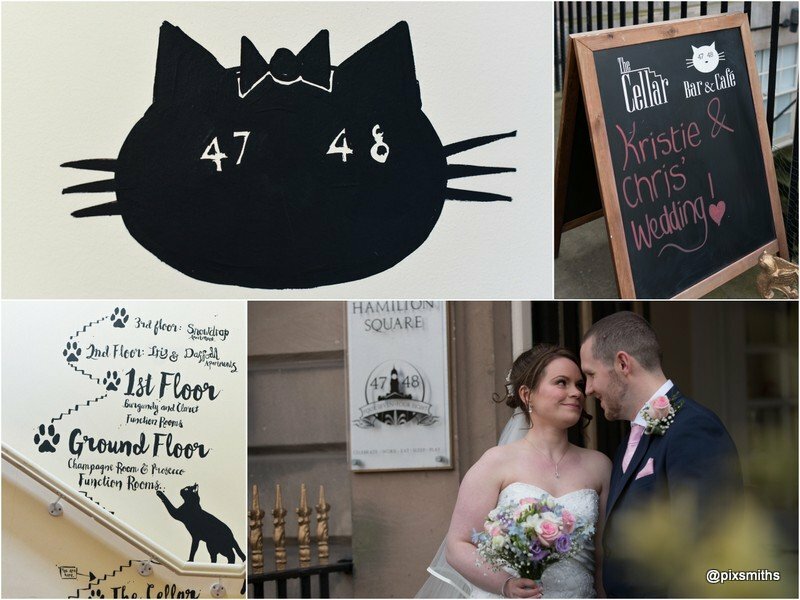 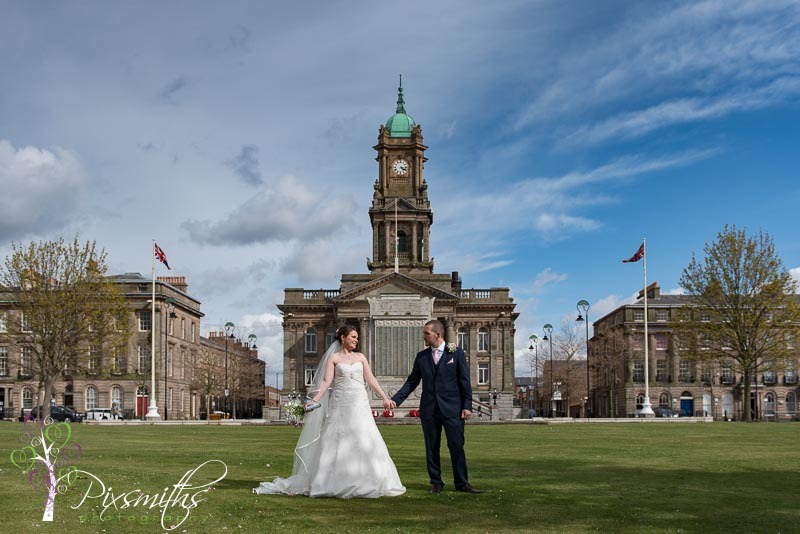 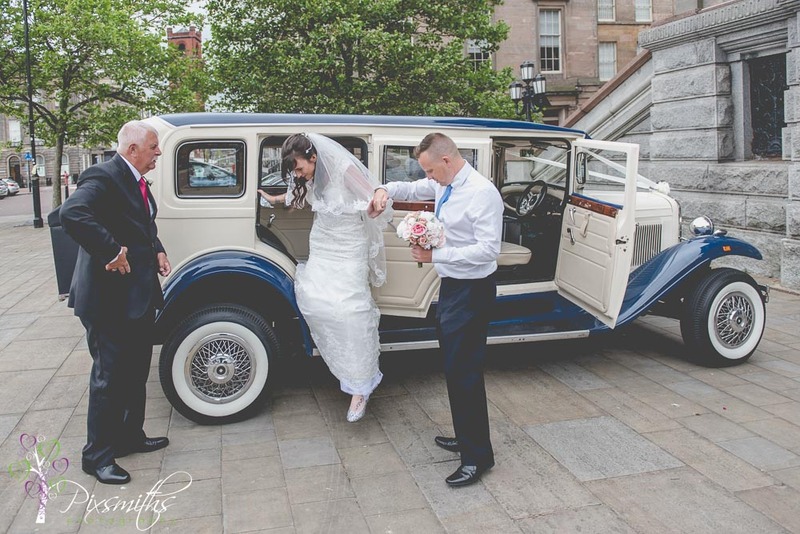 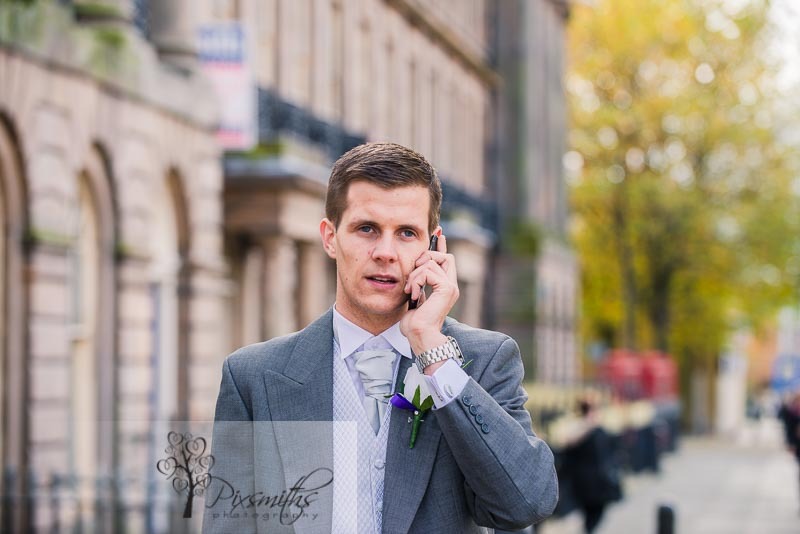 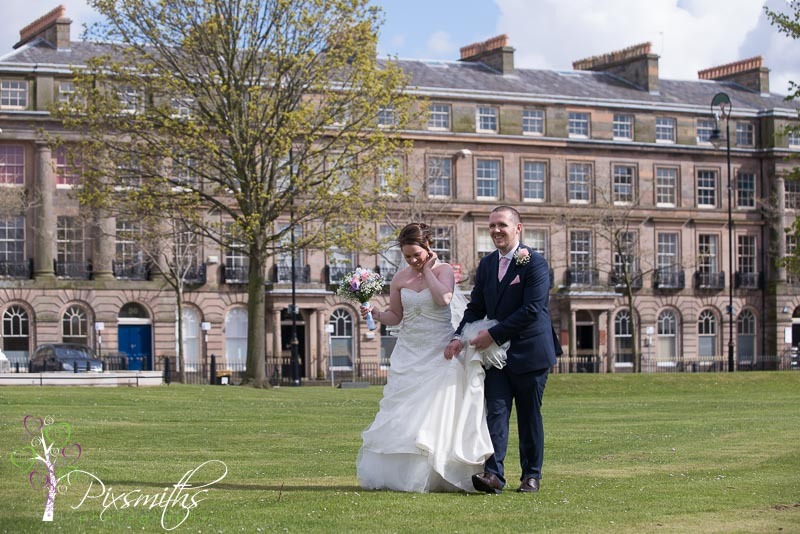 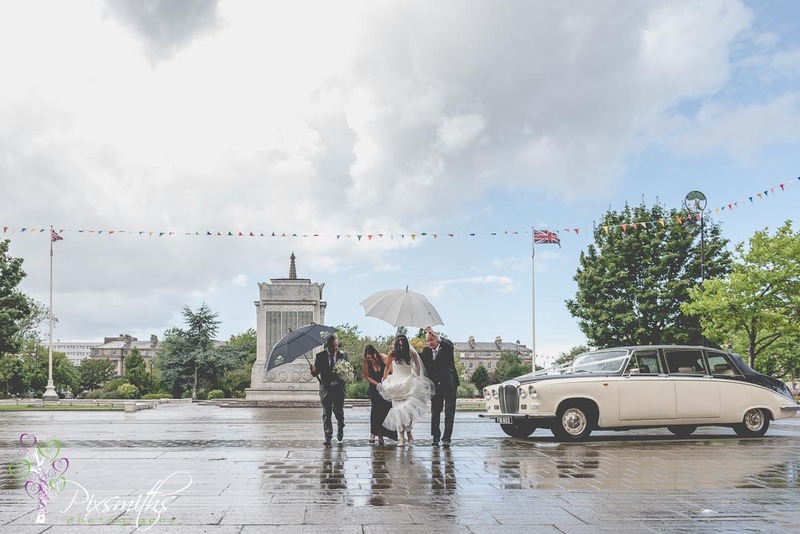 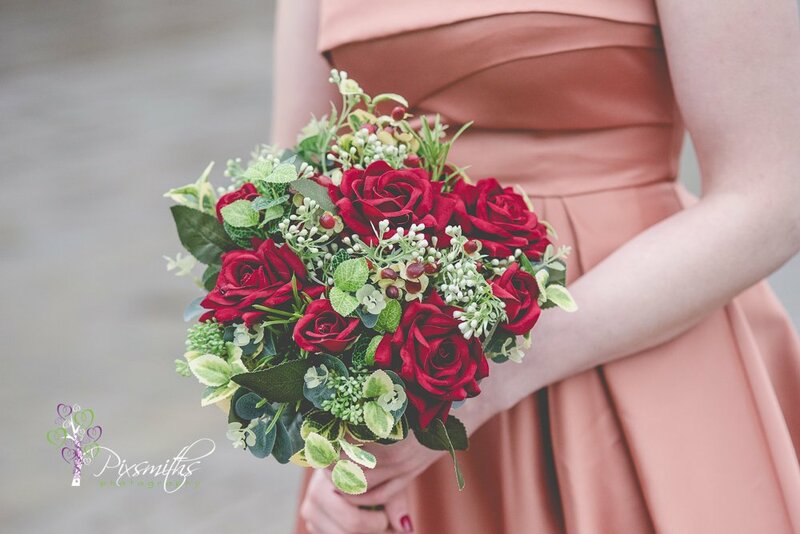 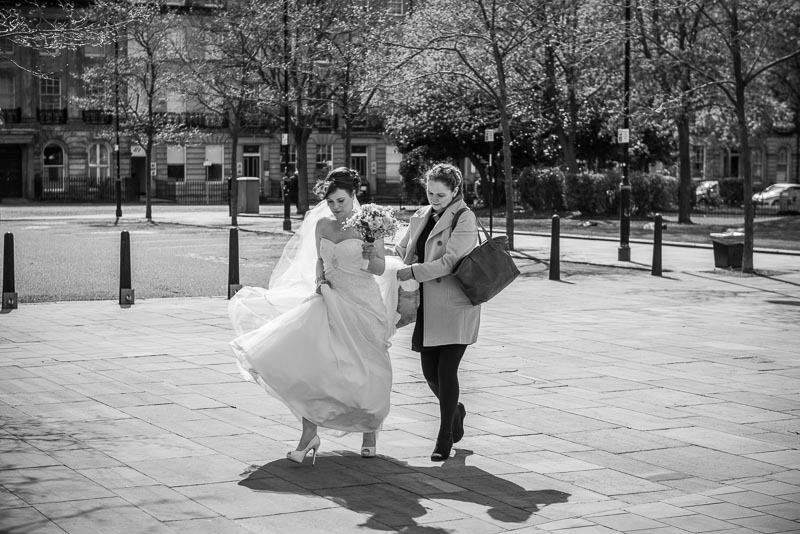 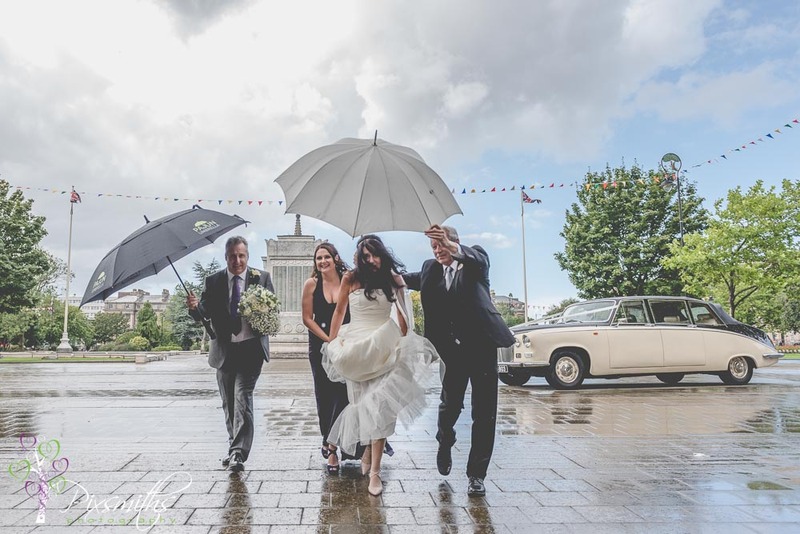 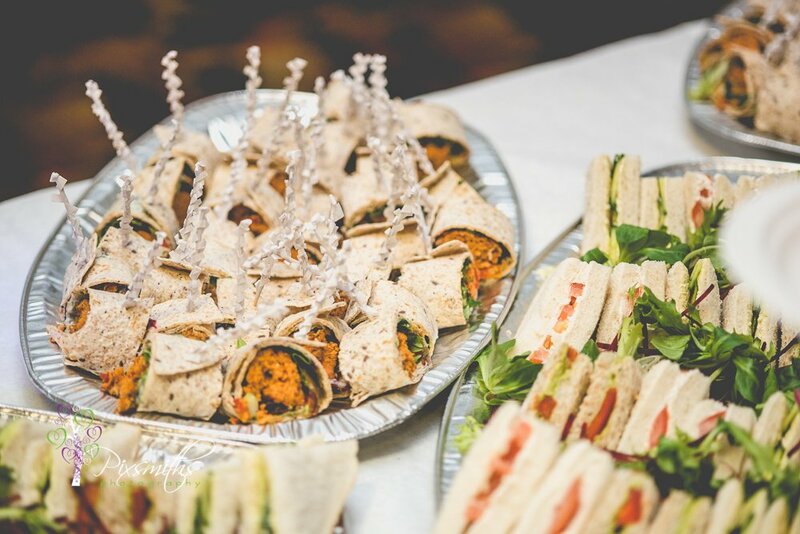 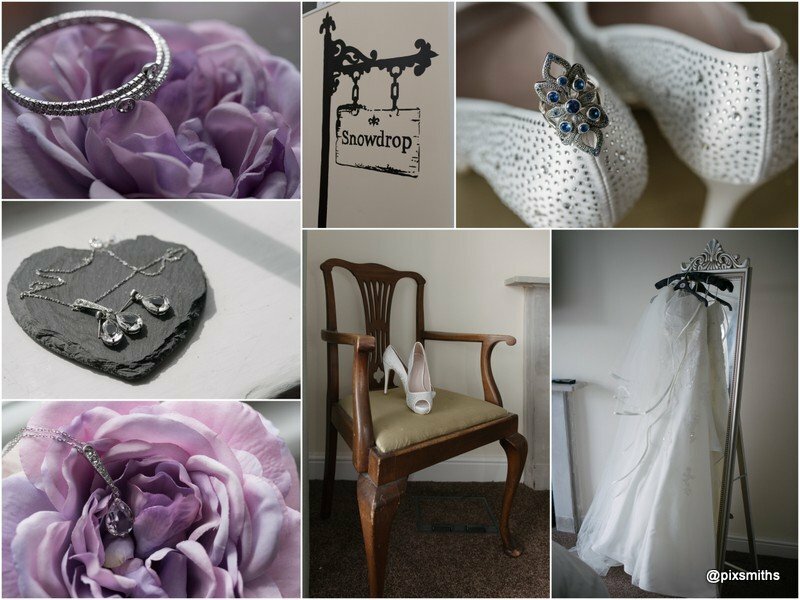 New venue, the quirky boutique 478 Hamilton Square made an ideal choice combination with a Town Hall Wedding. 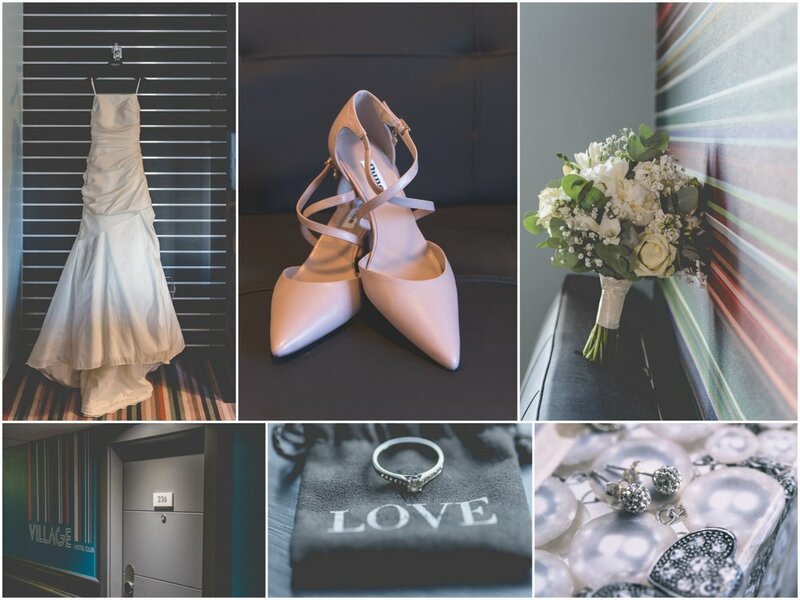 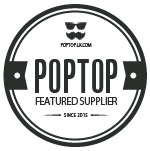 Preps just across the road from the Town Hall at 4748 in their beautiful Snowdrop suite – a wonderful space at the top of the hotel, contemporary furnishings for the bedroon backroonm, lounge and kitchen area. 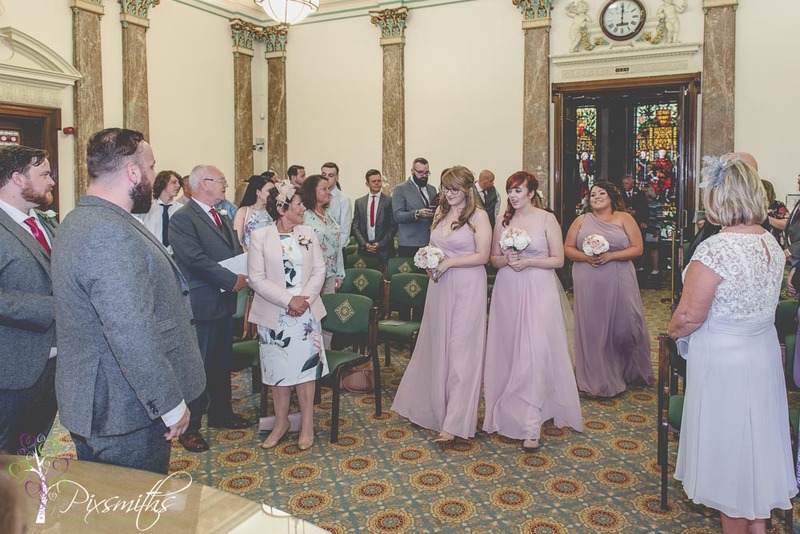 Gemma Bucley was lovely and calm on hair and make up duites and Liessa Murtagh was especially helpful to Khristie, helping her dress and leading her over to the Town Hall, lovely to see you Liessa! 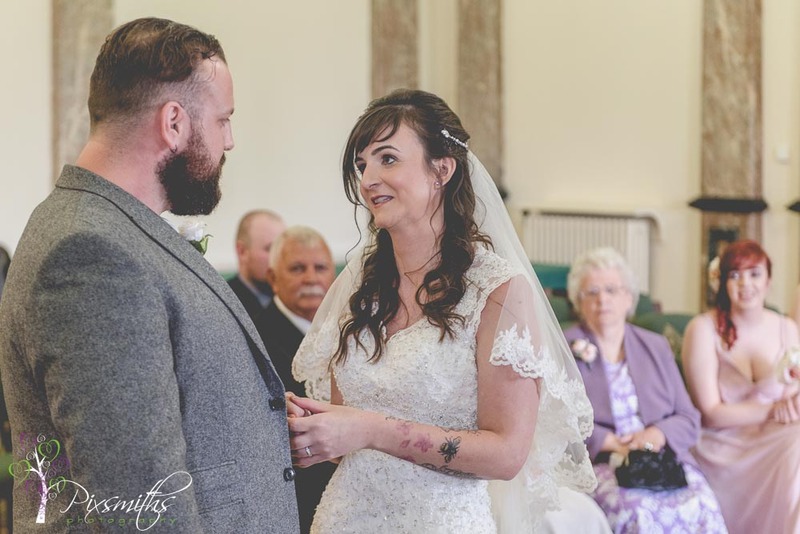 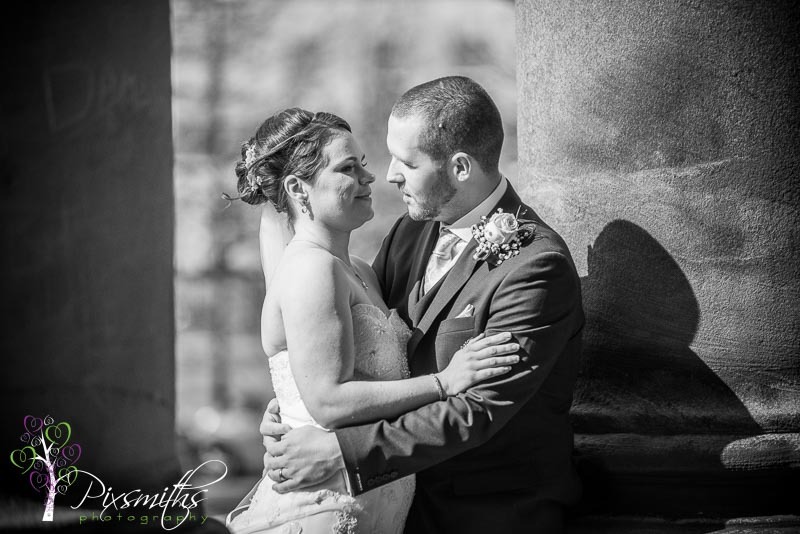 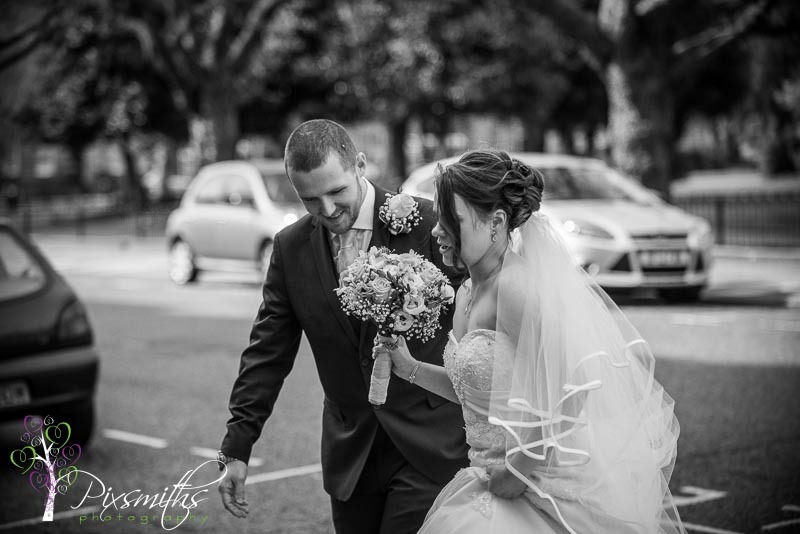 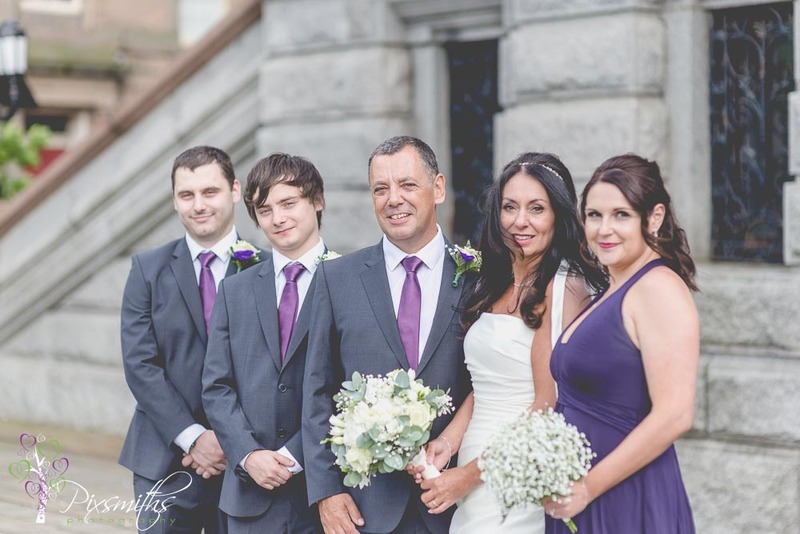 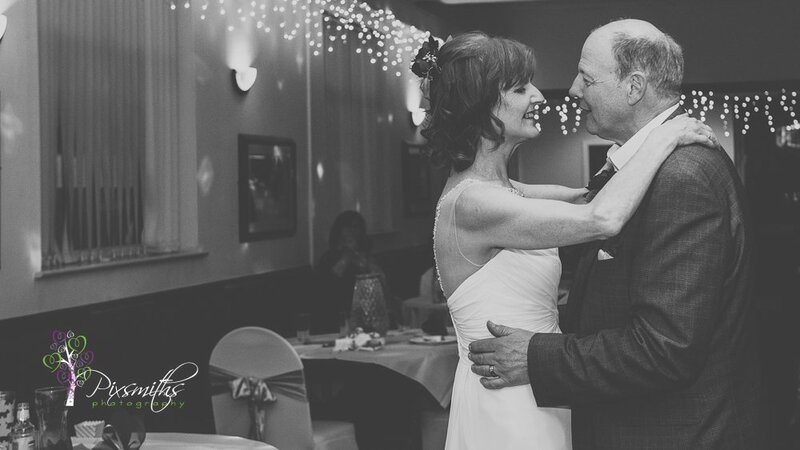 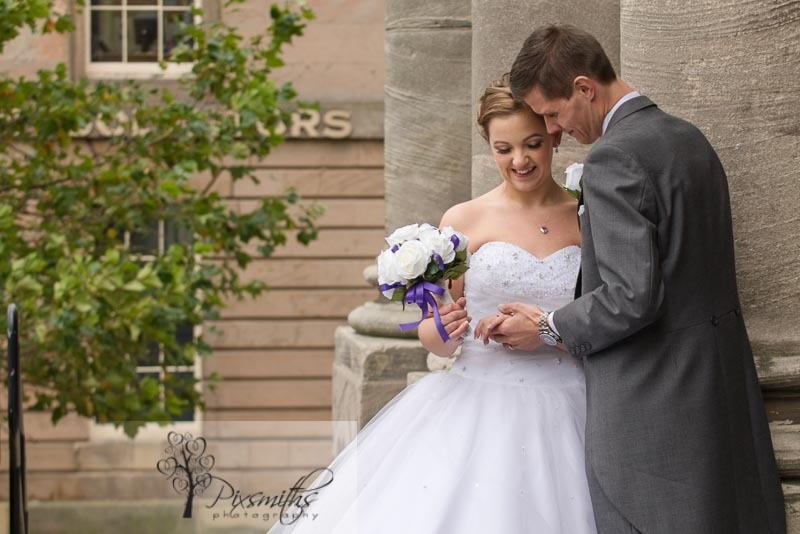 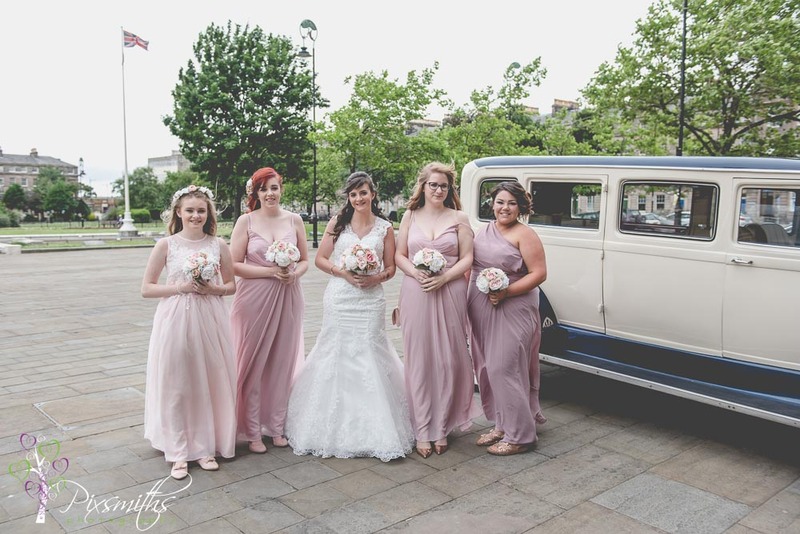 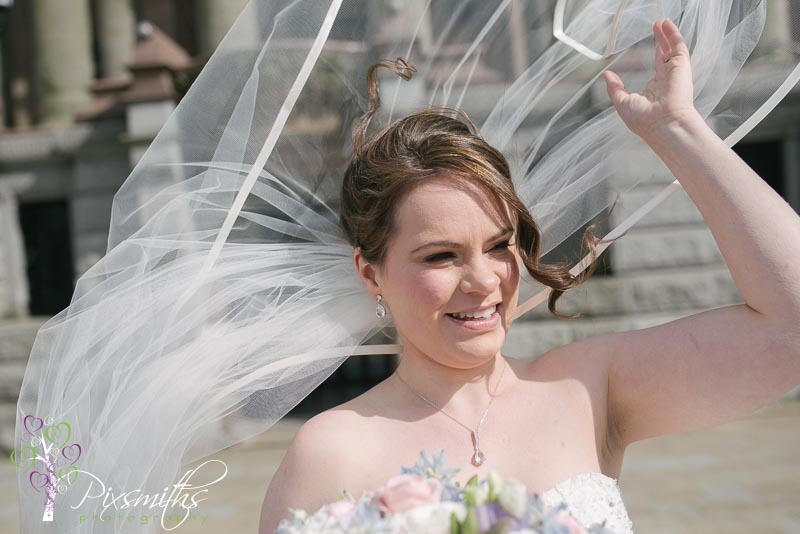 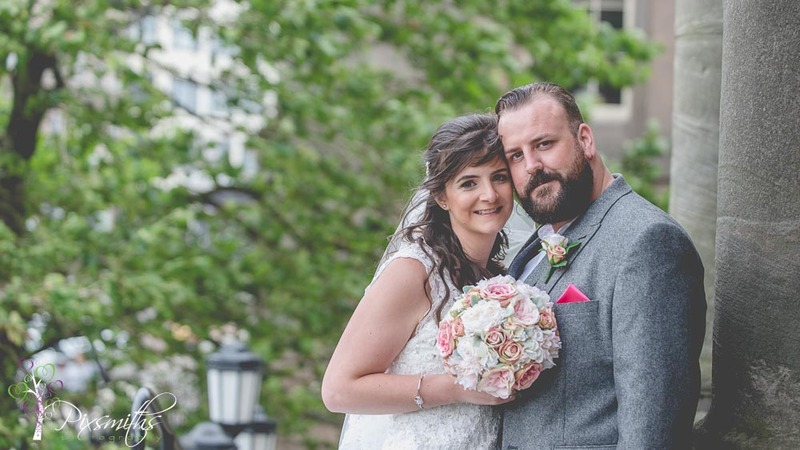 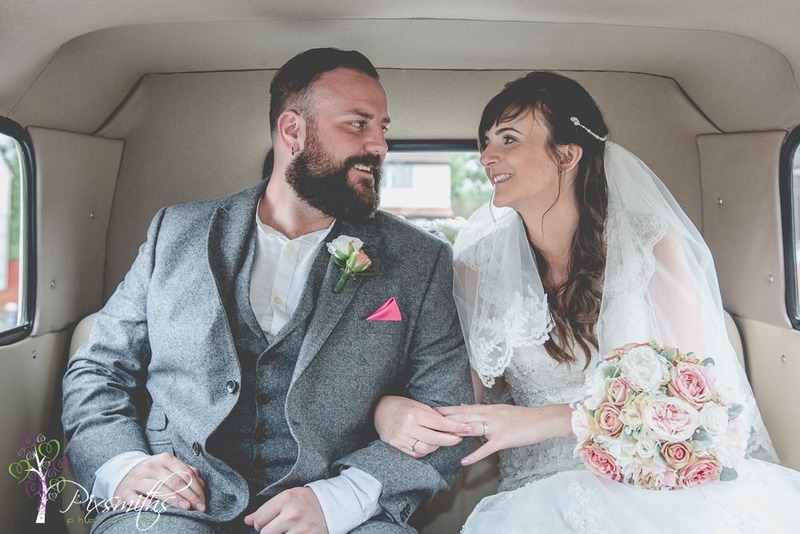 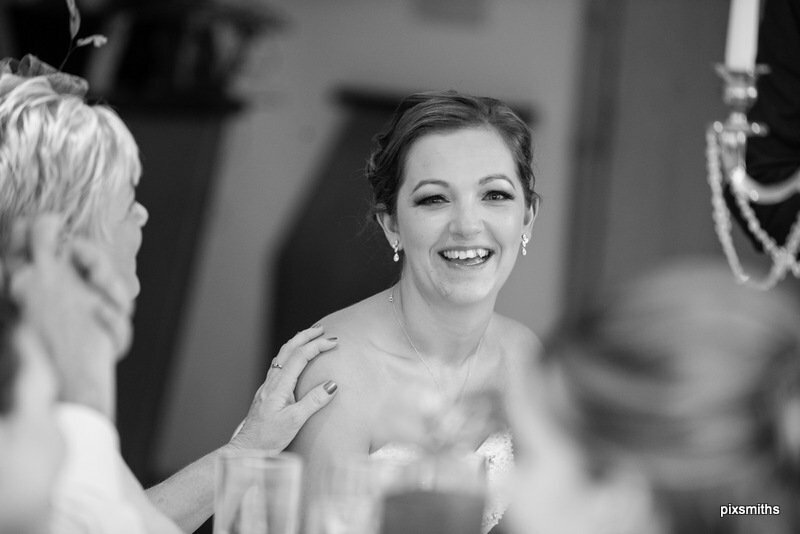 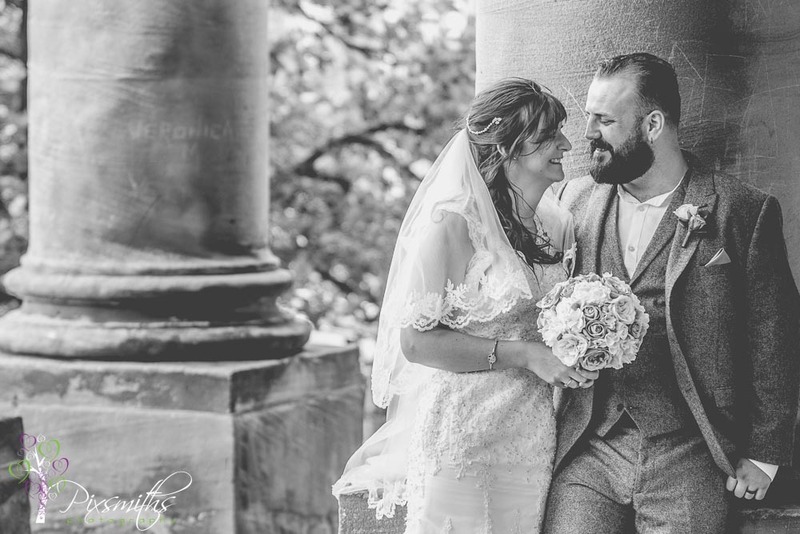 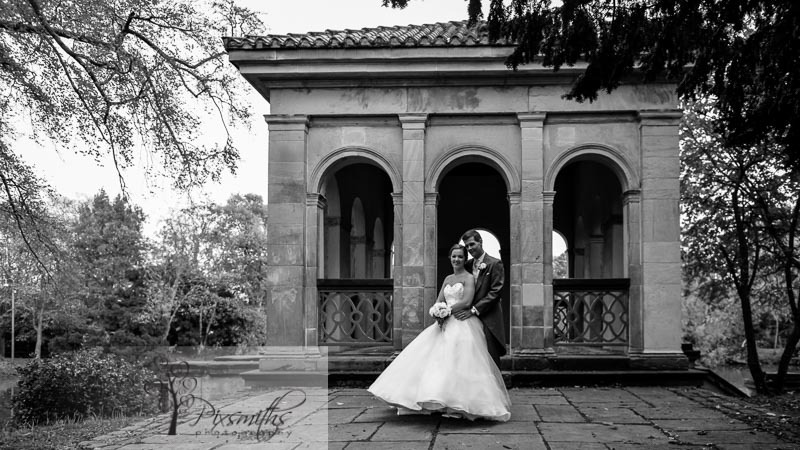 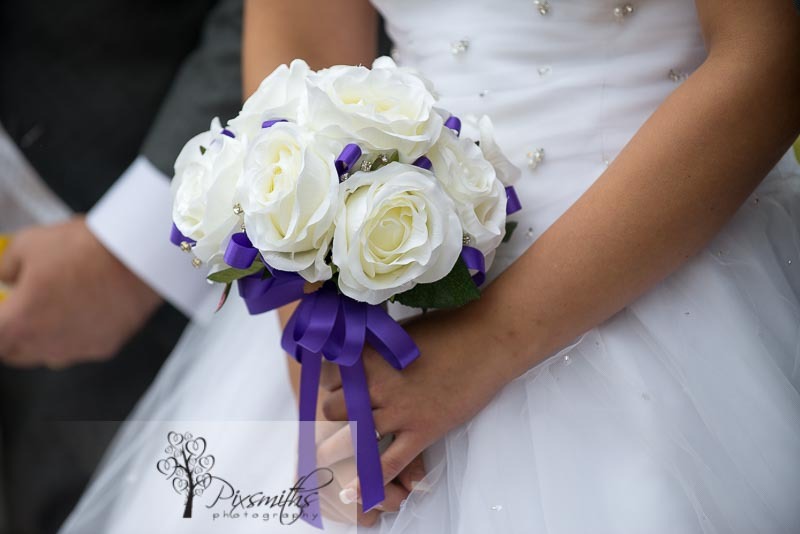 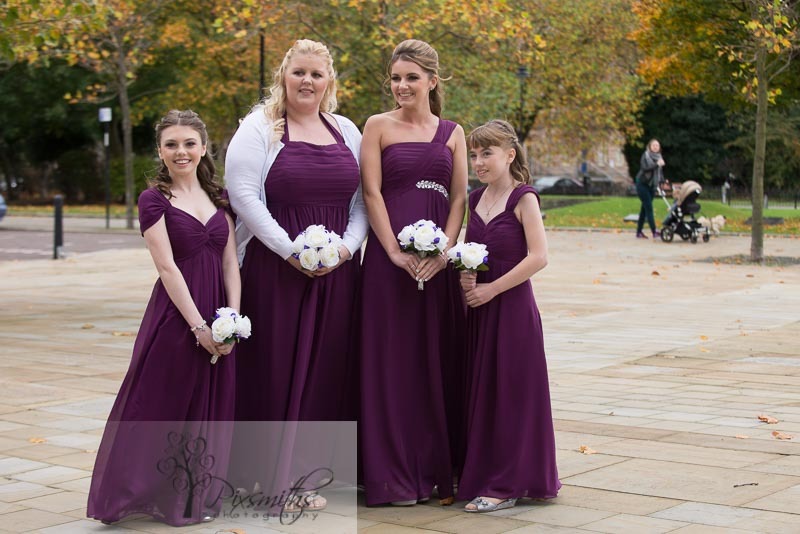 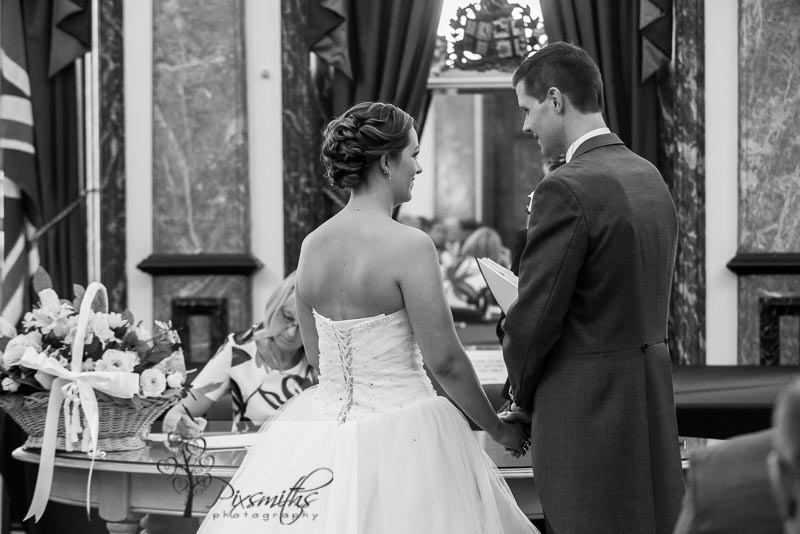 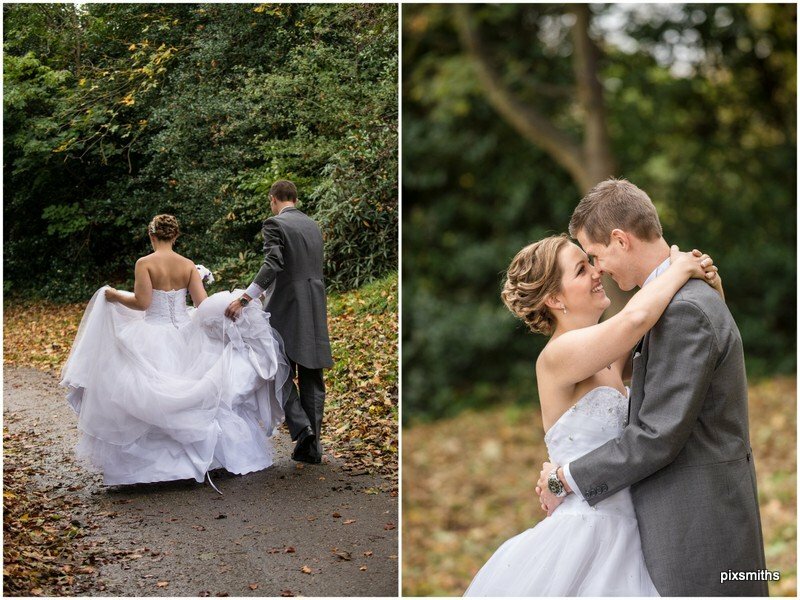 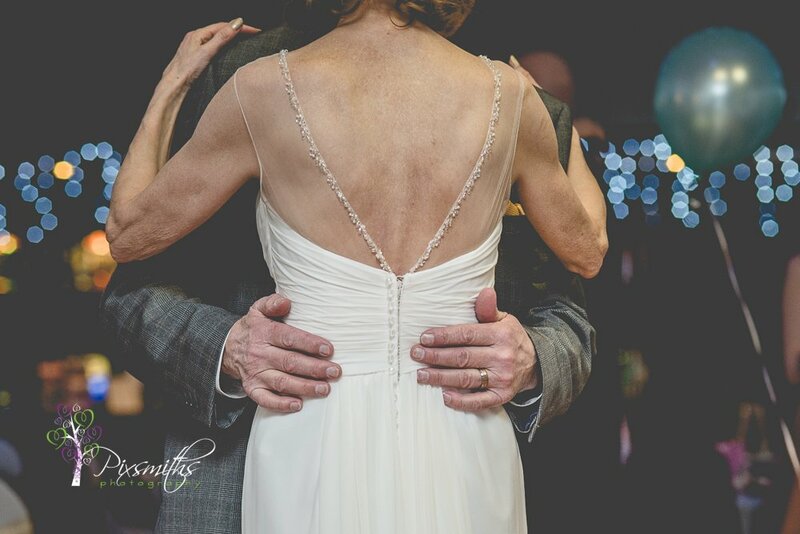 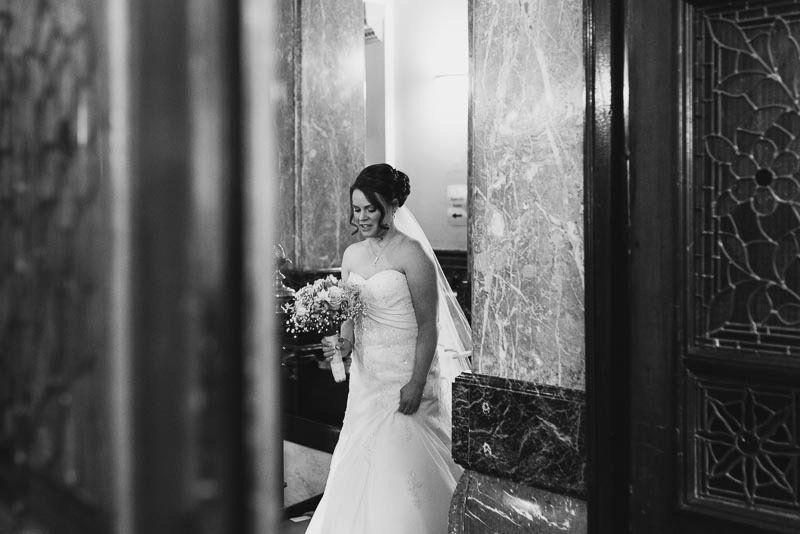 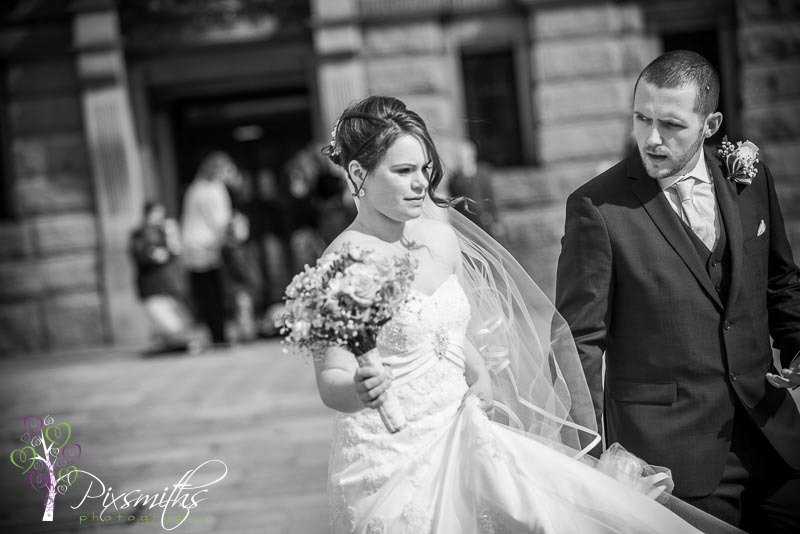 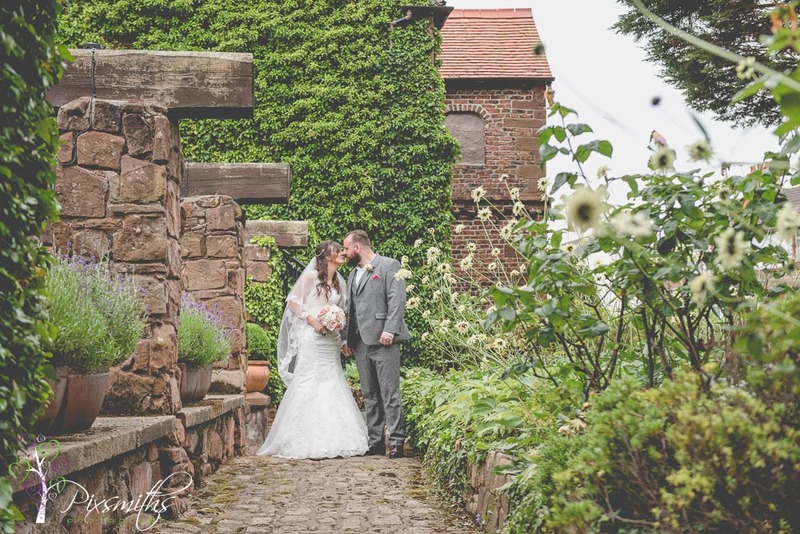 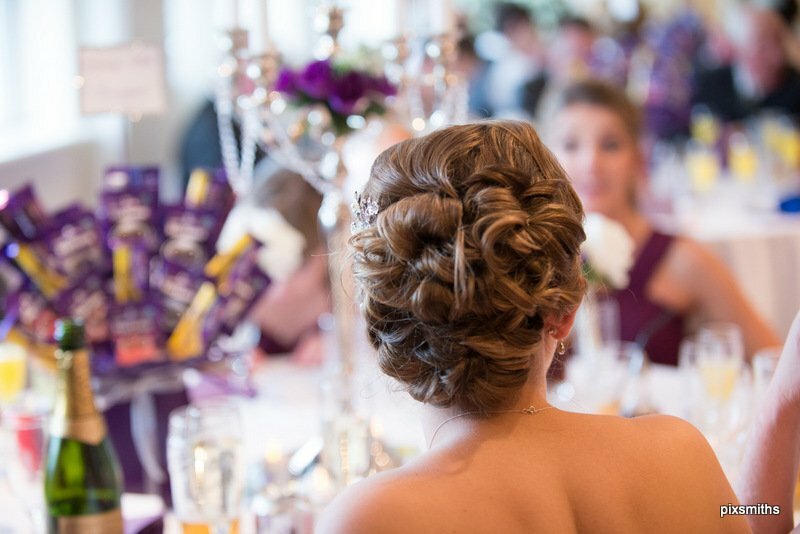 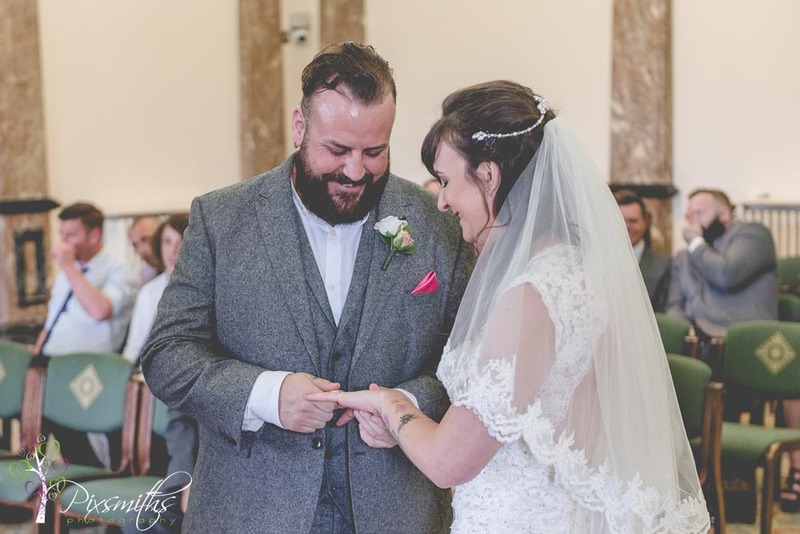 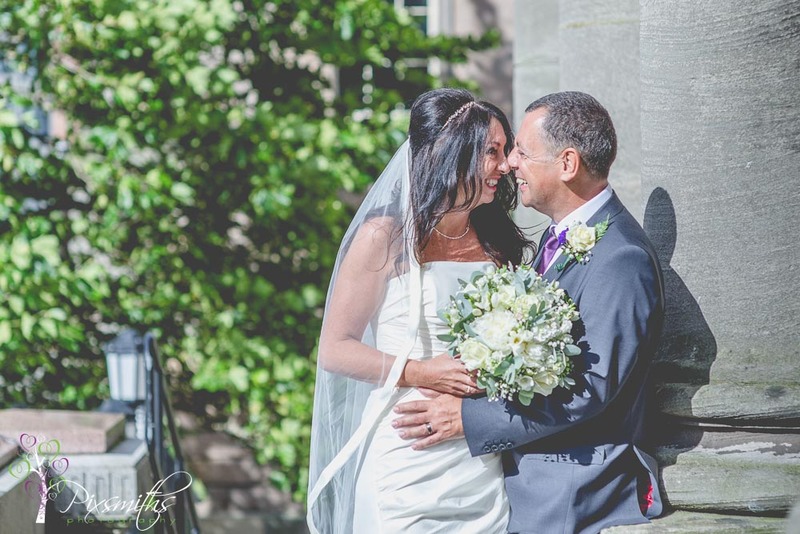 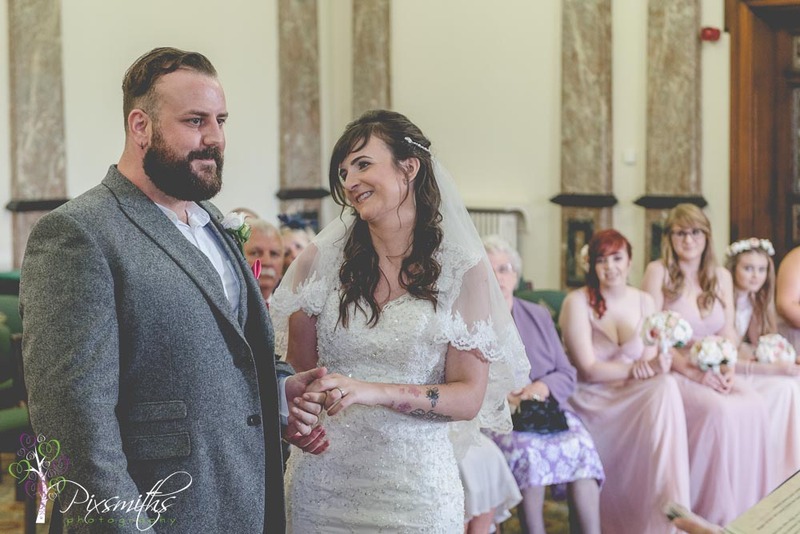 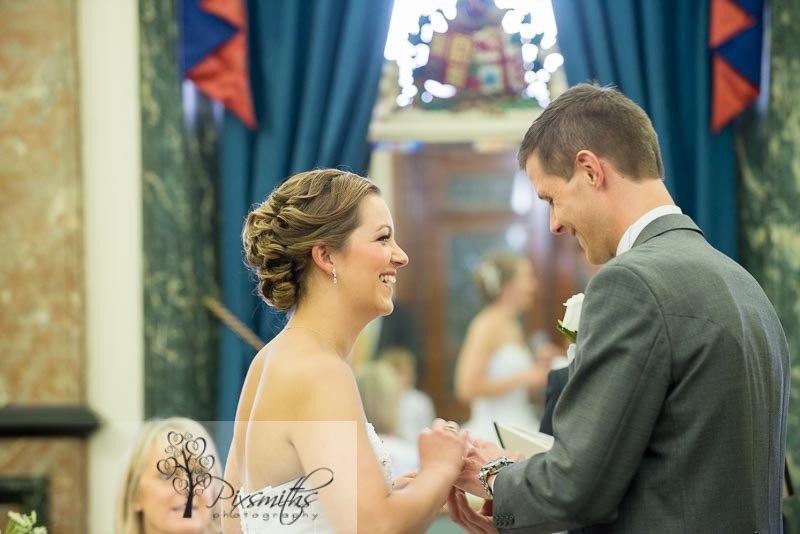 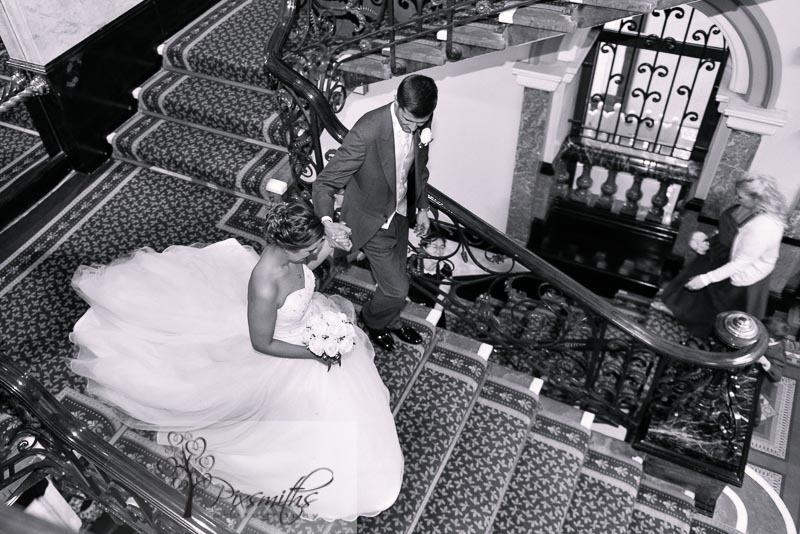 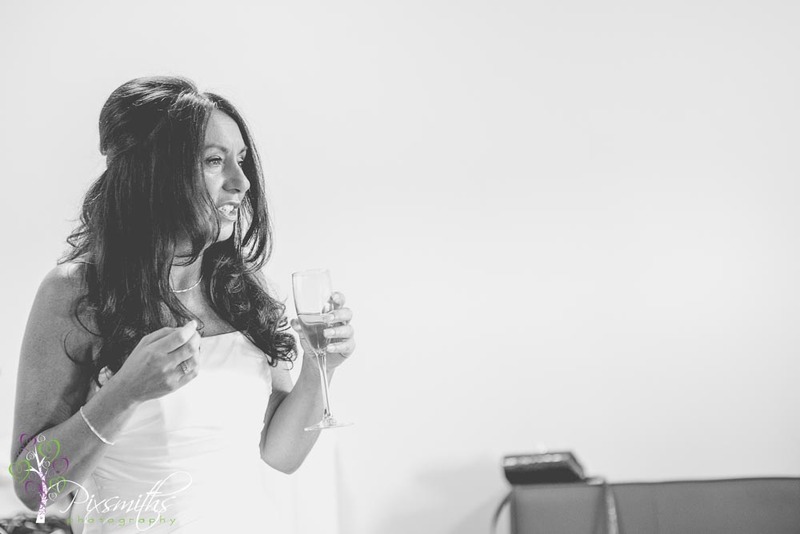 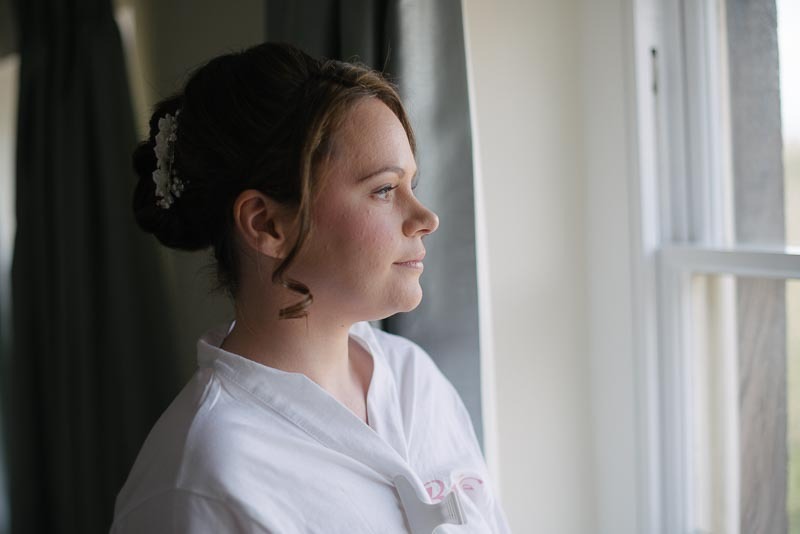 Kristie’s gorgeous gown is from the Kelsey Rose Bridal Collection from Cherish the Bride. 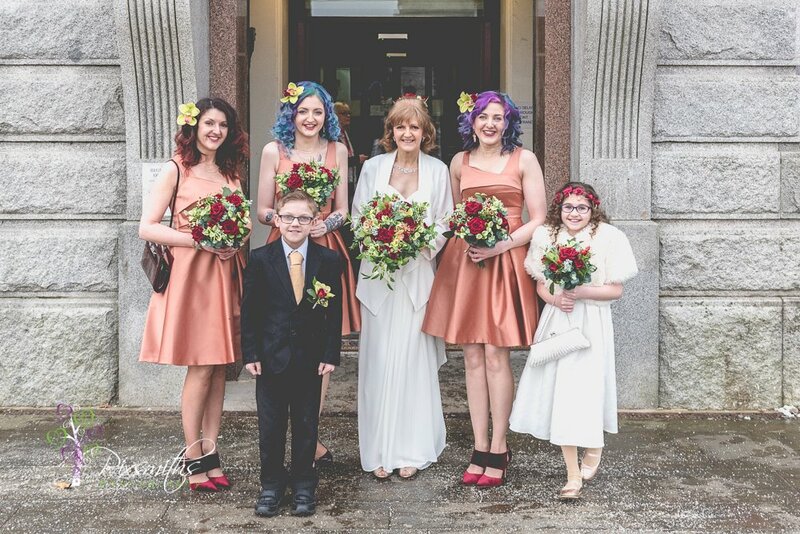 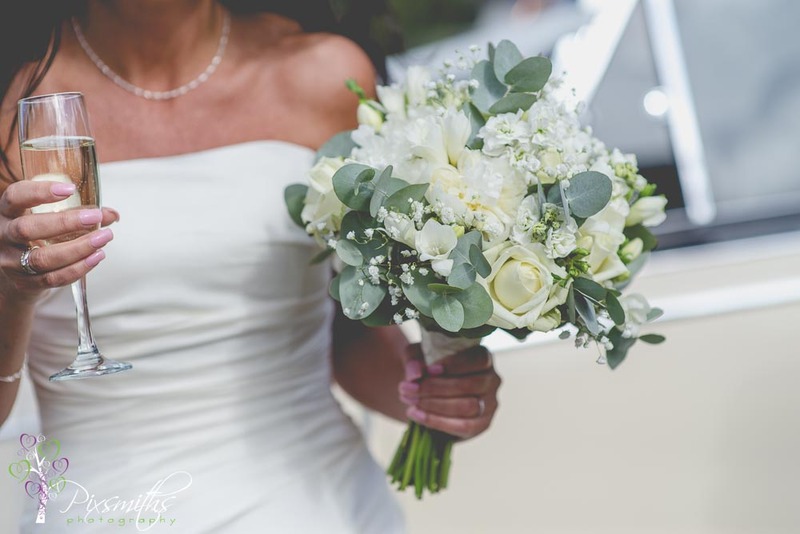 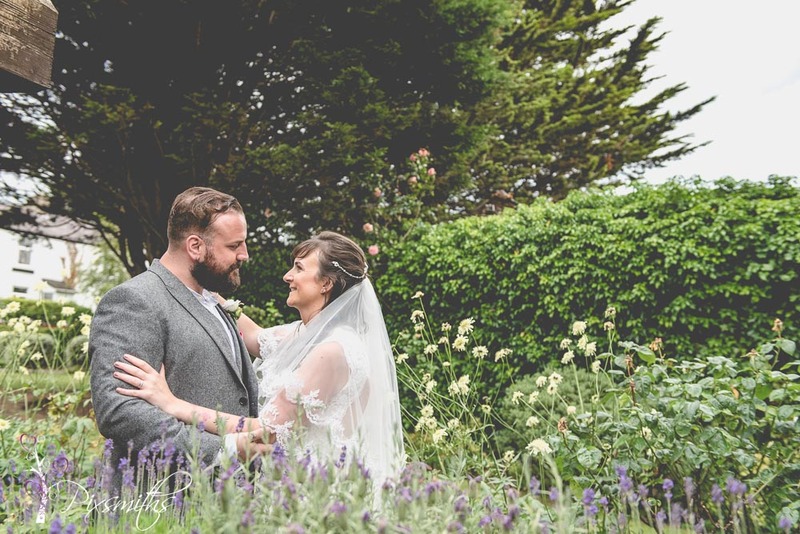 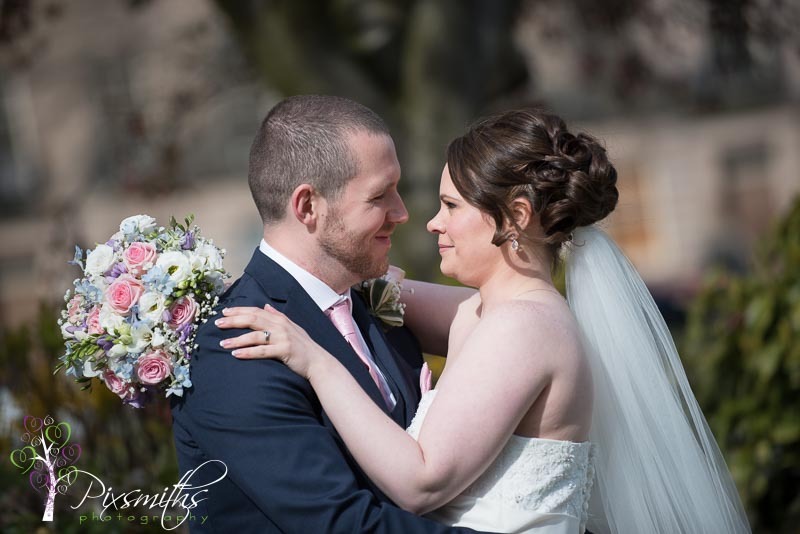 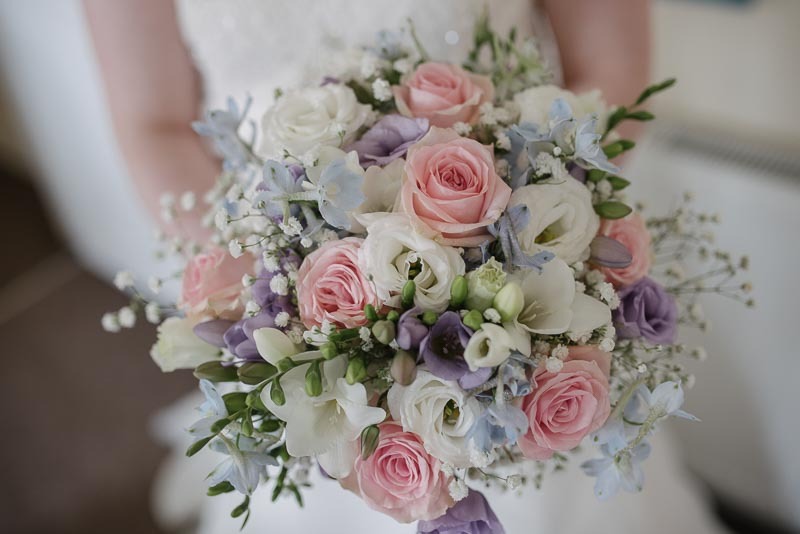 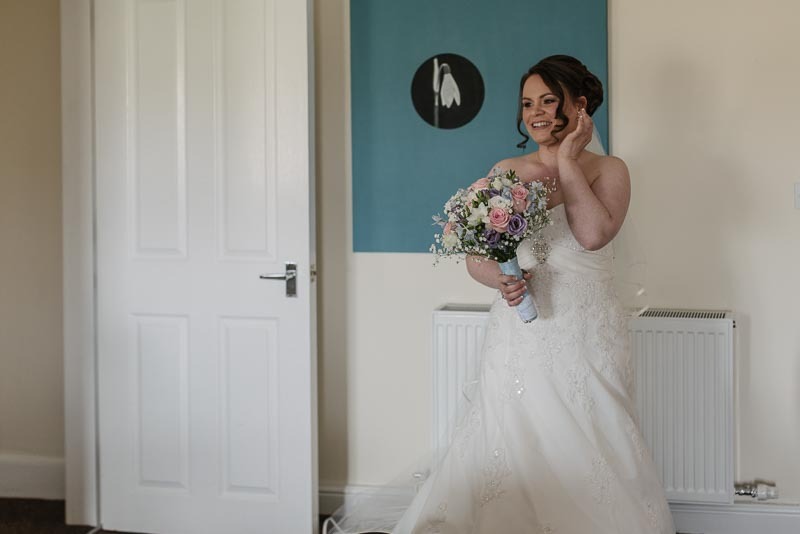 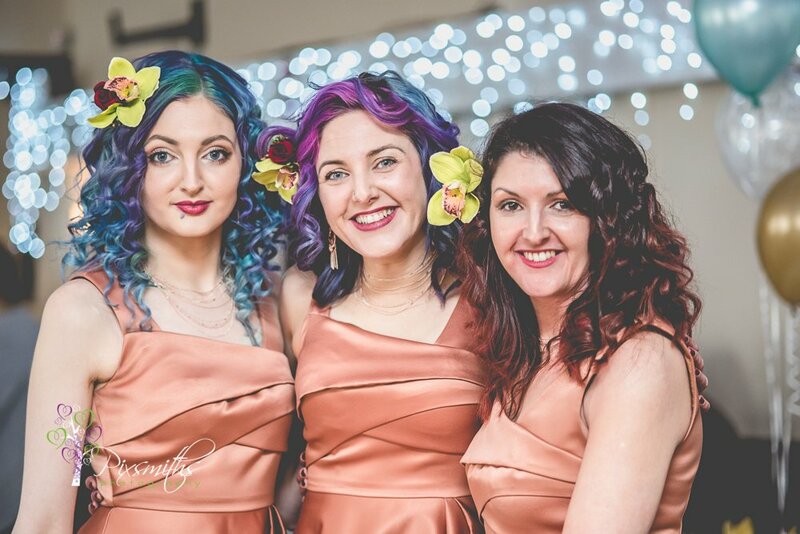 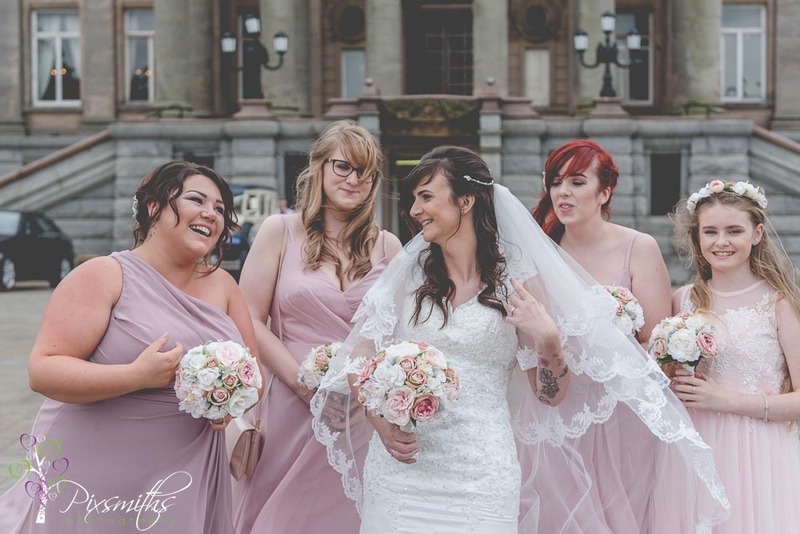 Kristie changed her colour scheme after being inspired by pastel baby colours and her bouquet from Amelia Jane Flowers epitomised this perfectly. 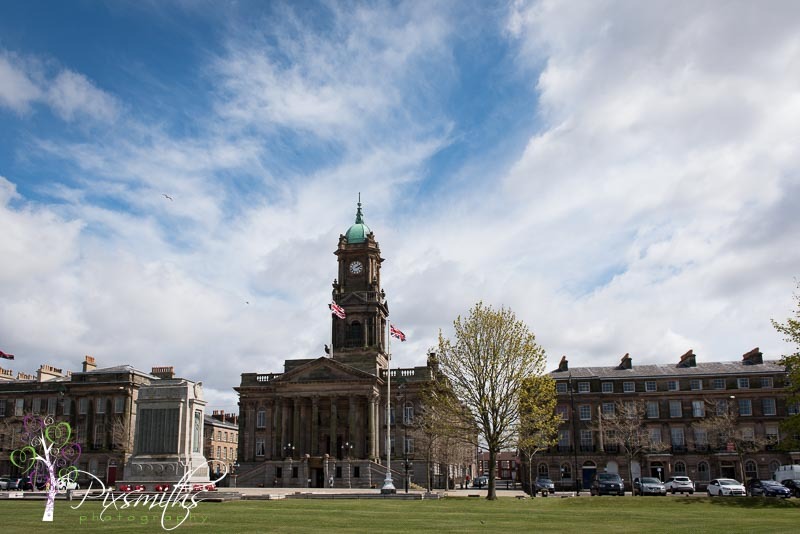 Beautiful Georgian buildings and architecture on the doorstep and the green park area of Hamilton Square for portraits. 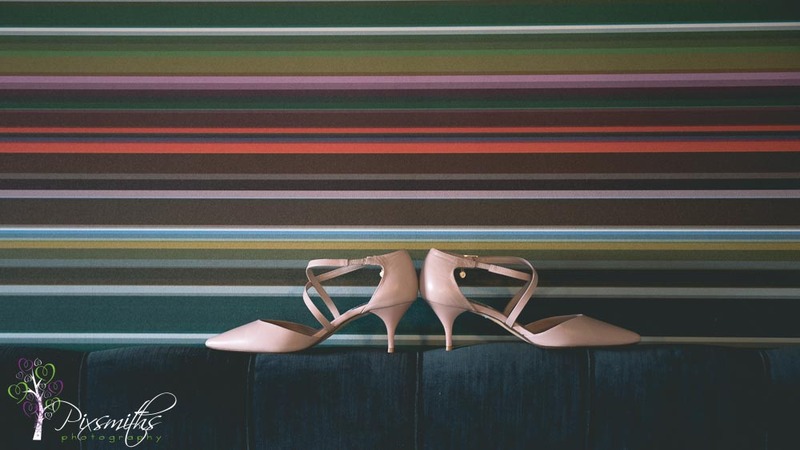 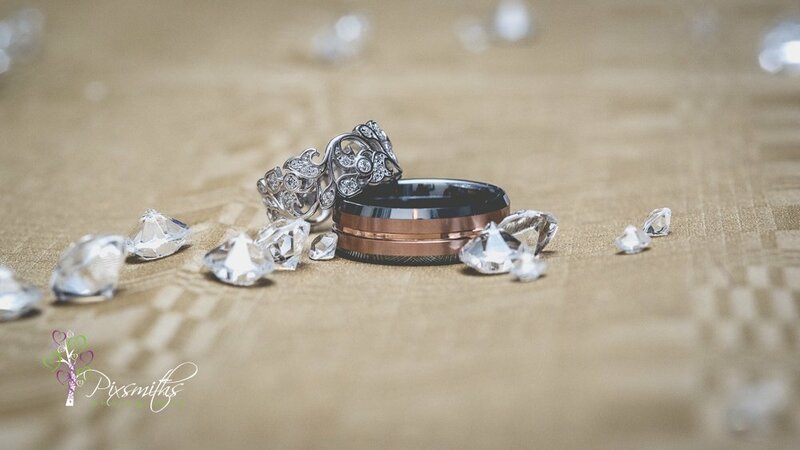 Perfectly placed for their relaxed intimate wedding party. 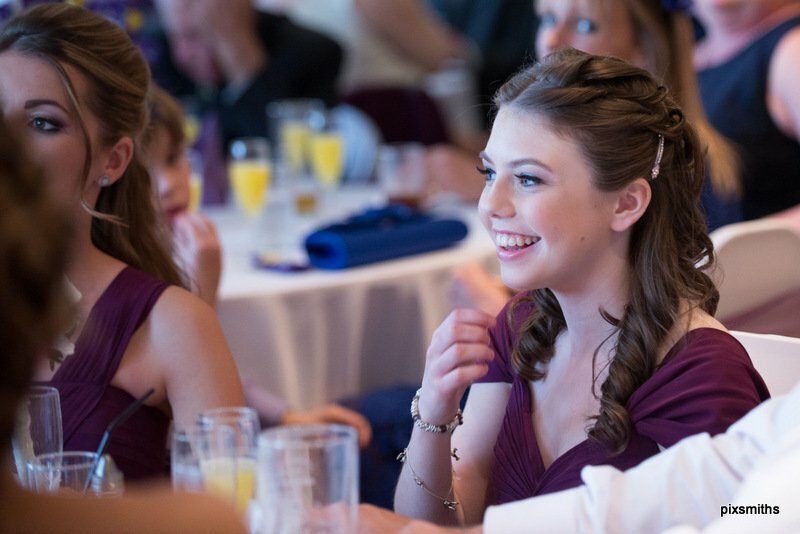 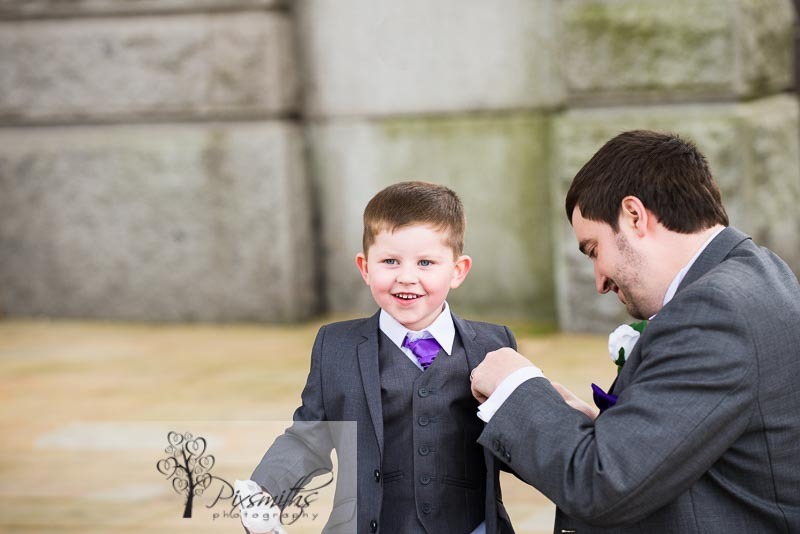 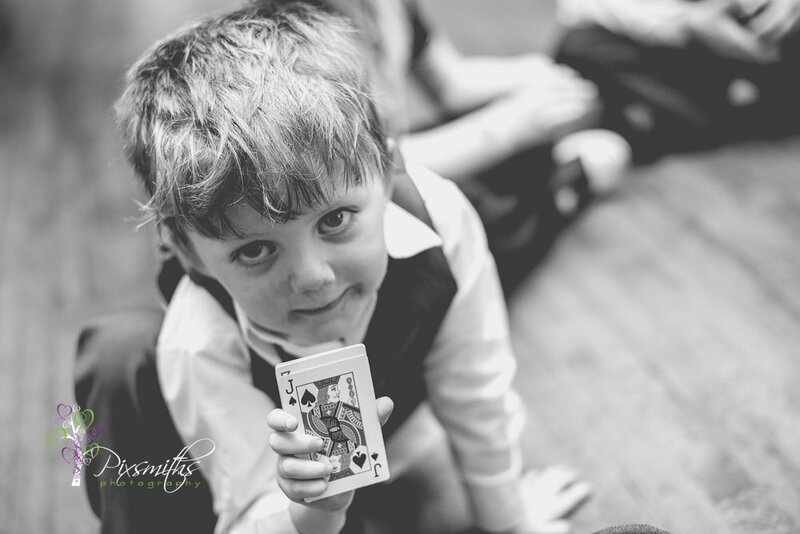 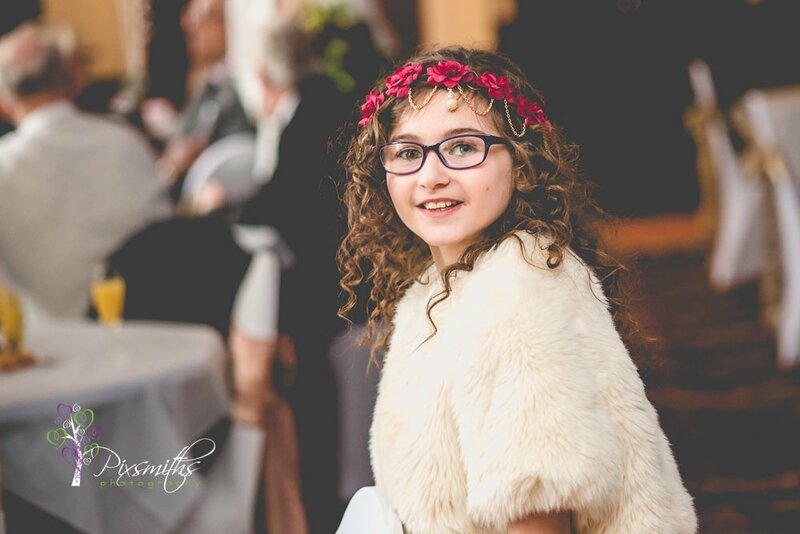 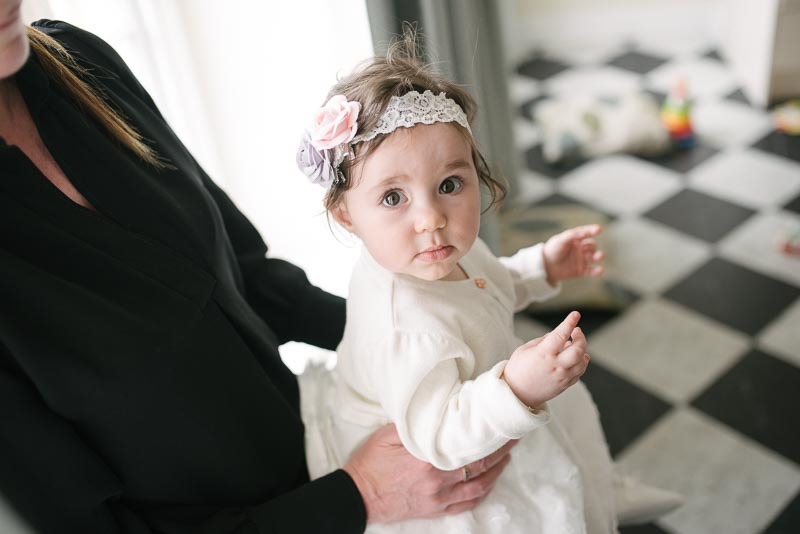 keeping things simple – thier adorable daughter as flower girl and Chris’s “bestman” was his sister. 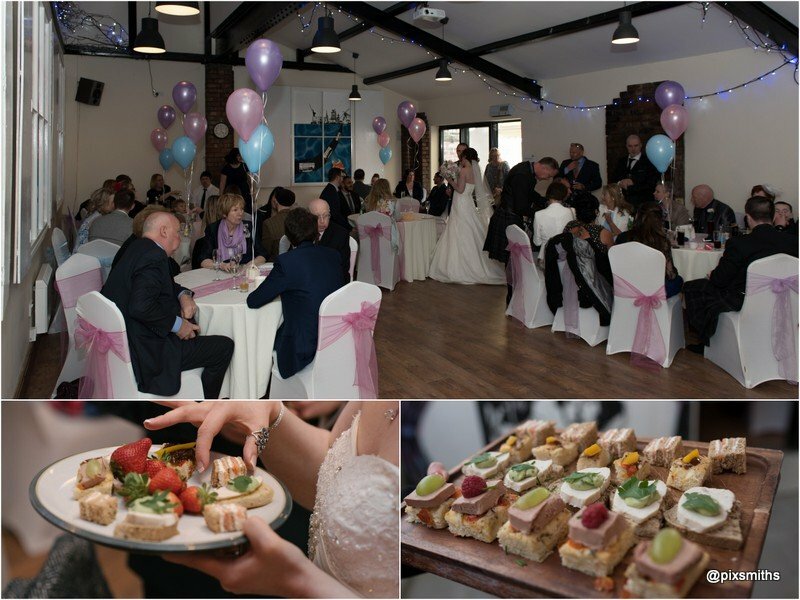 The stables and outdoor courtyard was ideal for their party size and a great time was had by all. 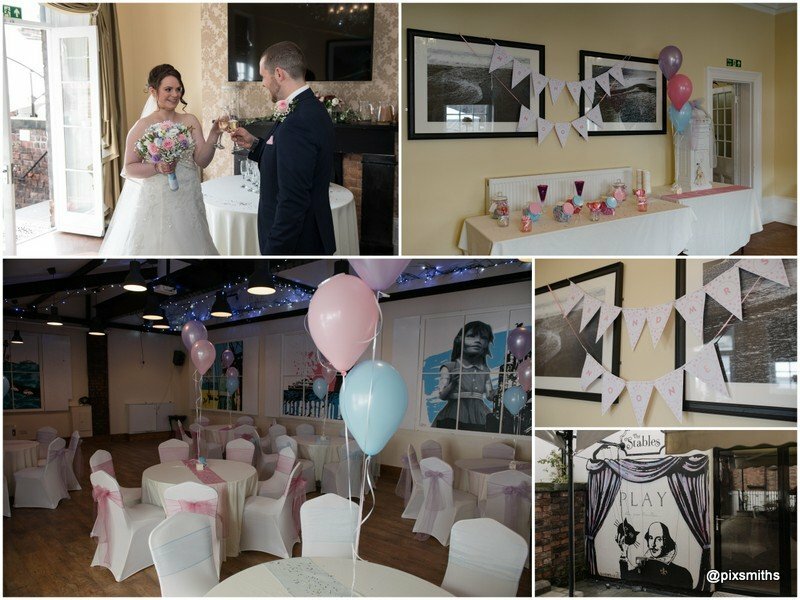 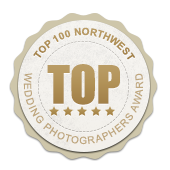 Many congratulations Kristie and Chris thank for for sharign your special day with us it was a real joy to be with you. 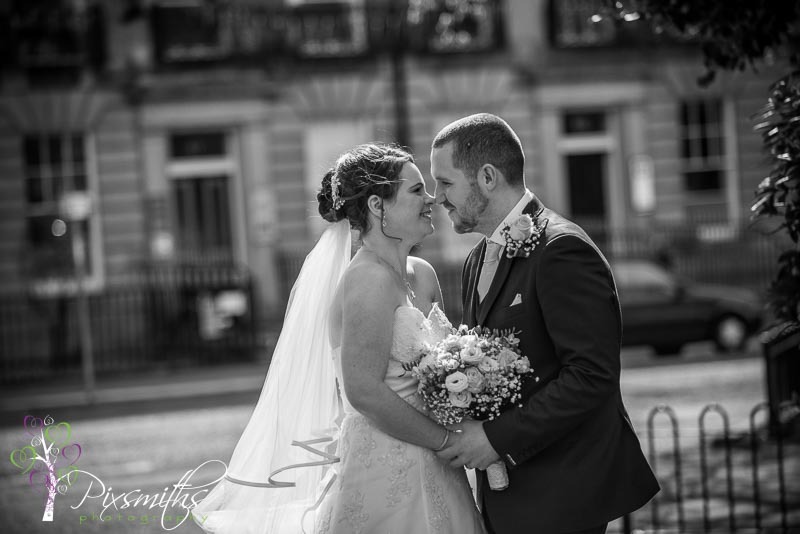 A sunny autumnal day and Pixsmiths had the pleasure of second shooting for Amy of Slinky Media for the wedding of Chris and Sam. 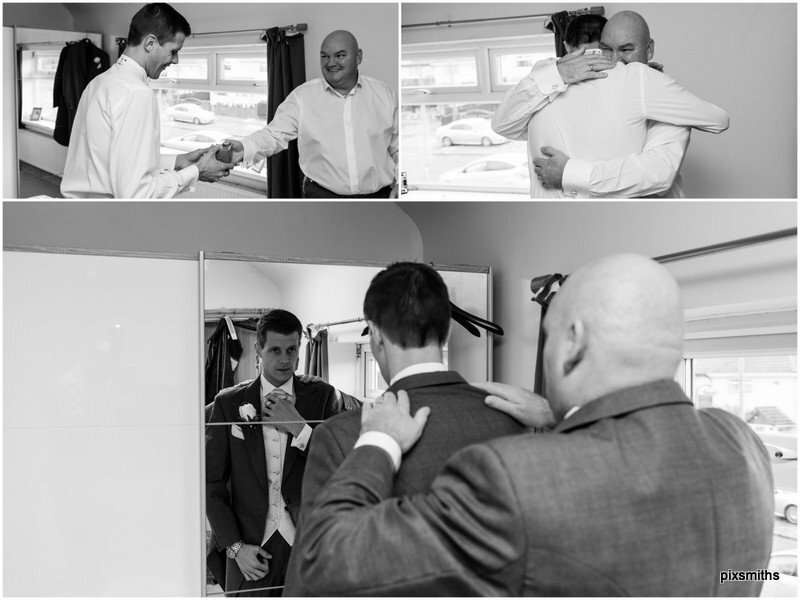 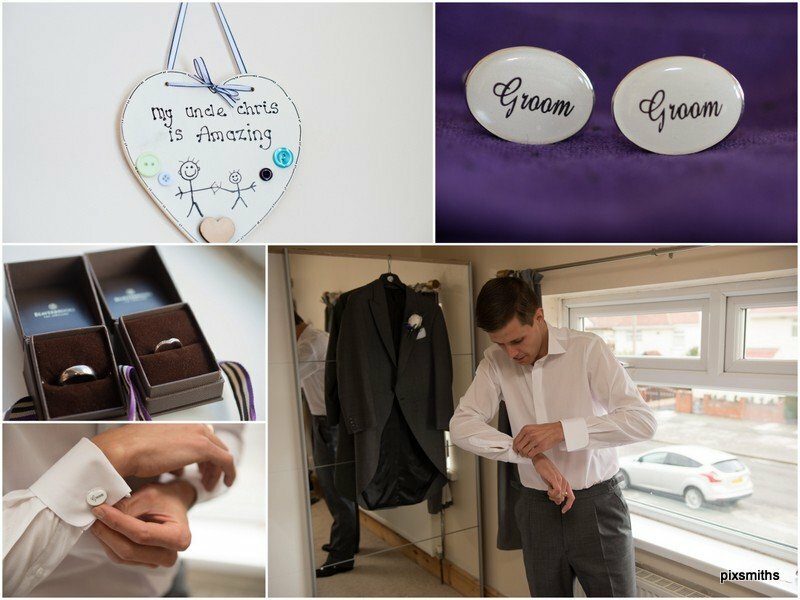 Groom preps captured made a change from our usual bridal preps – Chris was soon put at ease and soon it was time to head off to Birkenhead Town Hall to meet up with Amy. 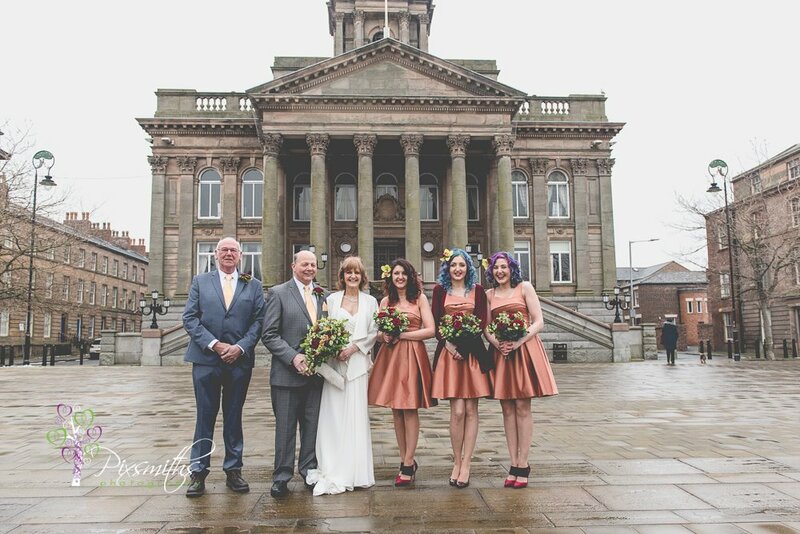 The large room at the top of Birkenhead Town Hall was the setting for the ceremony, and what a setting too, beautiful stained glass windows a real grand setting indeed. 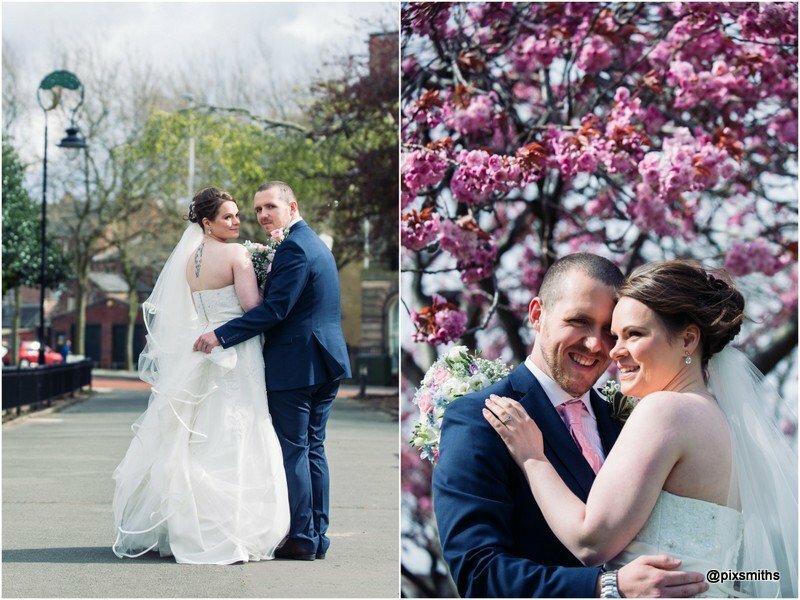 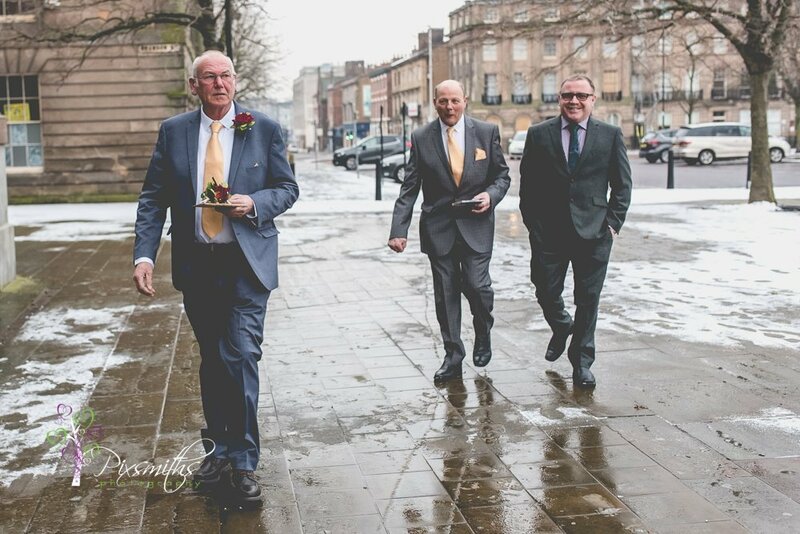 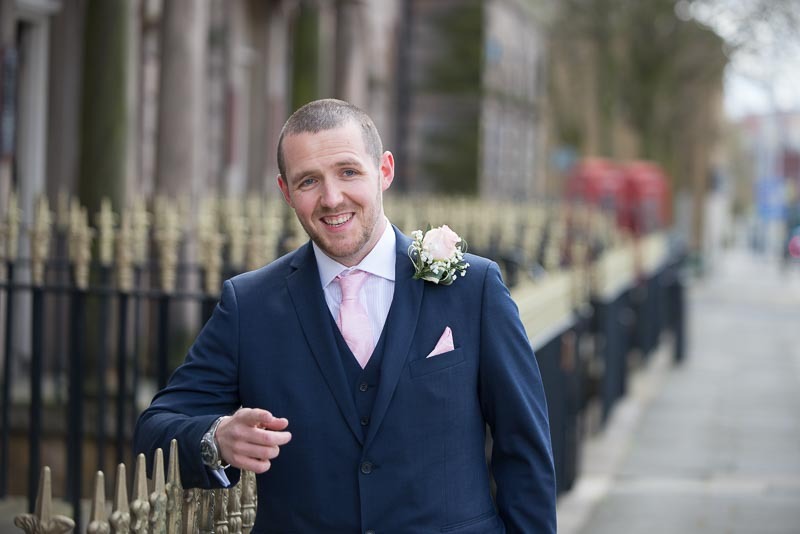 Ceremony and few pics over and lots of laughter and joy and it was off for a stop in Birkenhead Park for a few portraits. 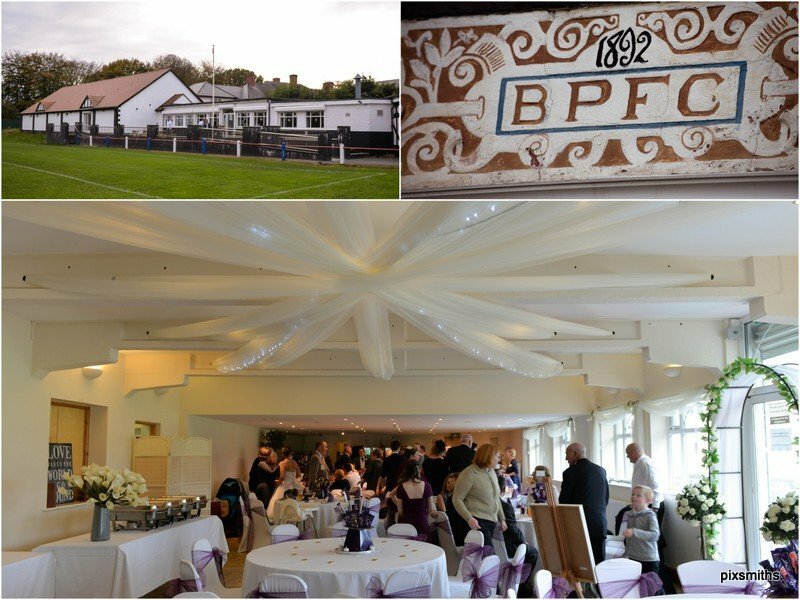 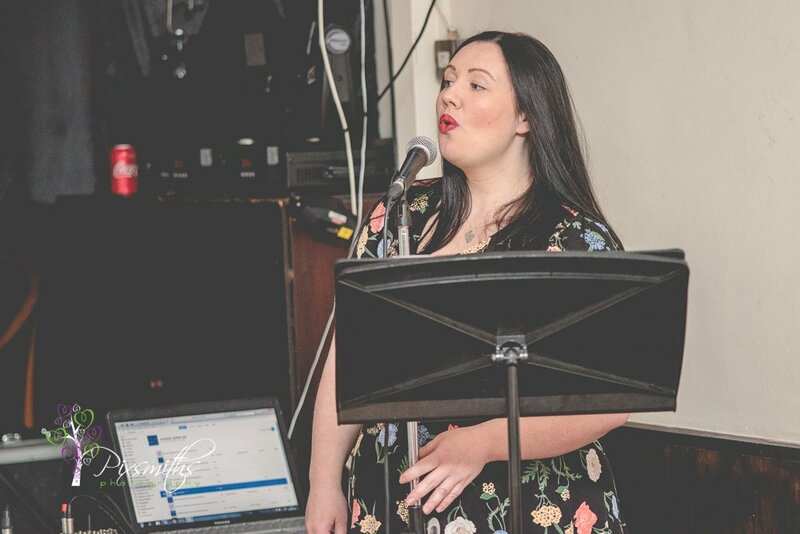 Then on to Birkenhead Park Rugby Club for the reception…beautifully set out by Alley Cats and the team there. 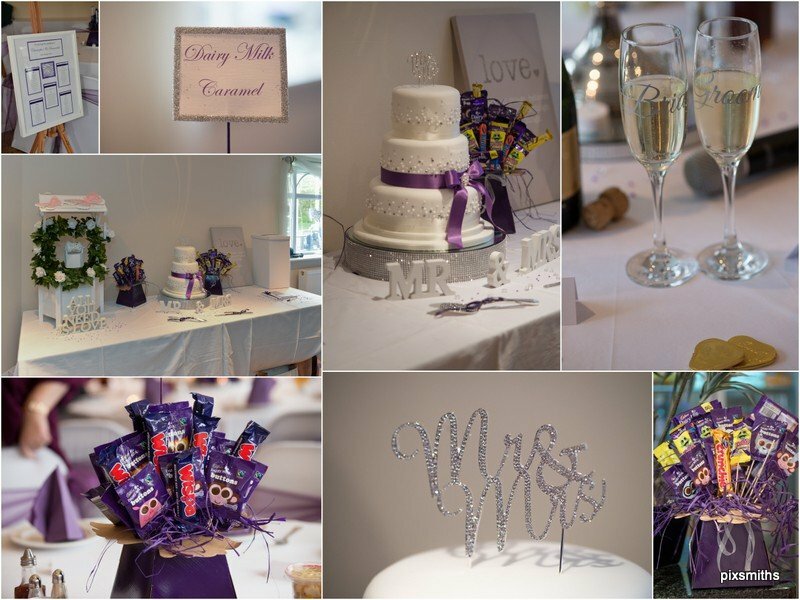 Loved the chocolate bar theme and centrepieces, so colourful.